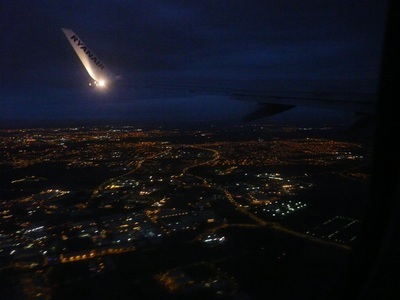 Day one early start left Sligo Midnight arrived Dublin around 4am after the bus driver slightly mislaid us in Mullingar for about 10 minutes. 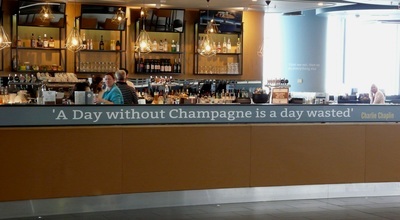 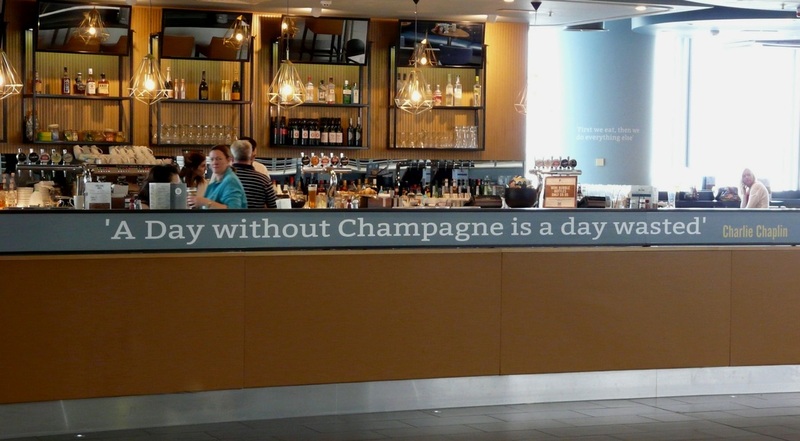 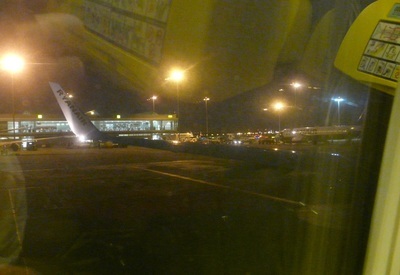 After that it was a day of airport. 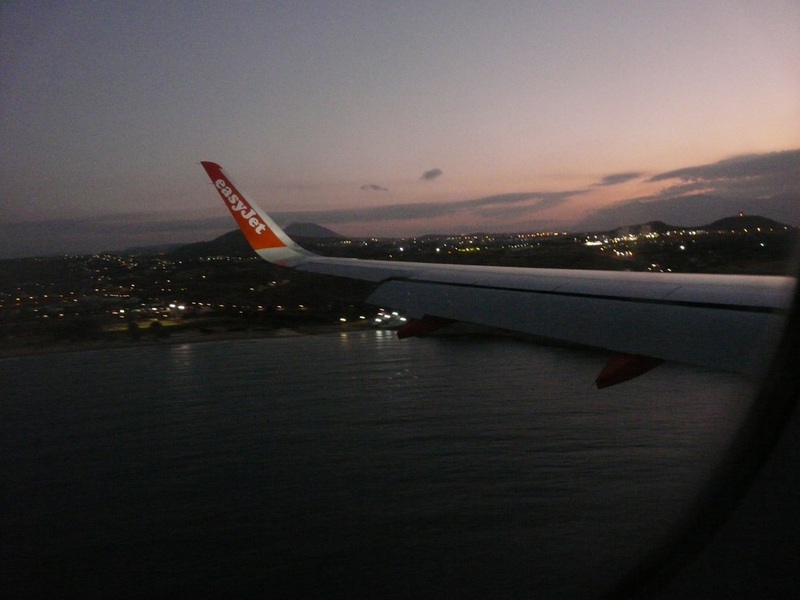 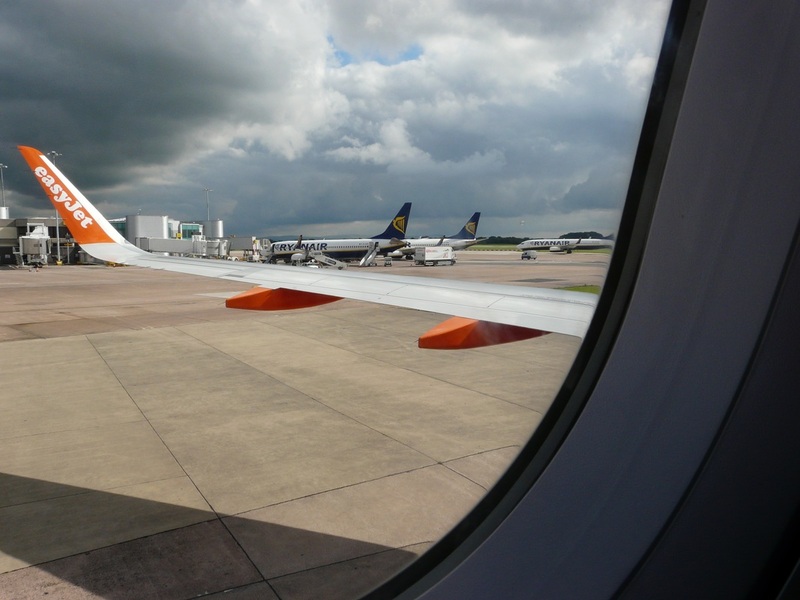 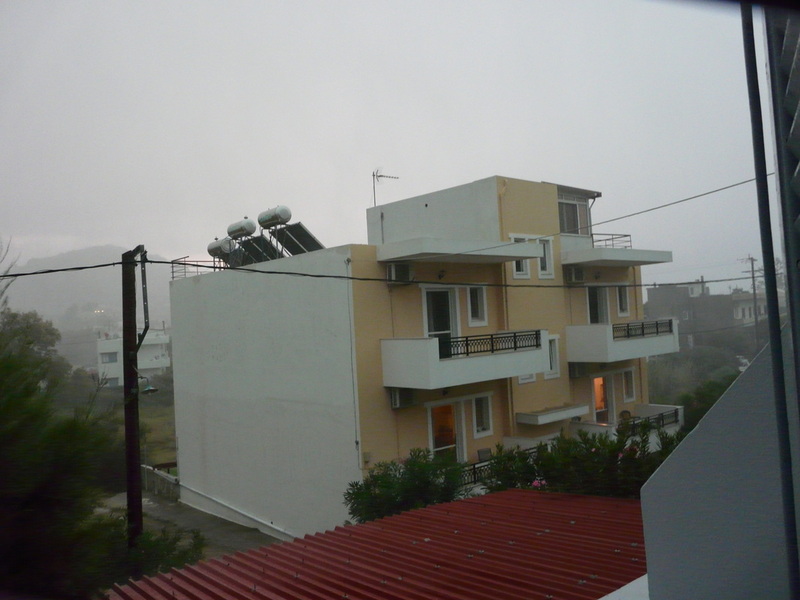 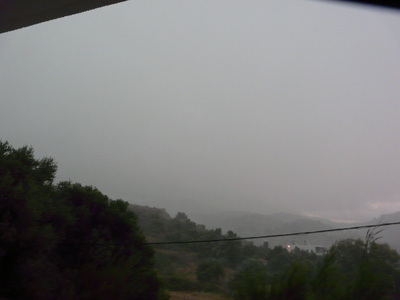 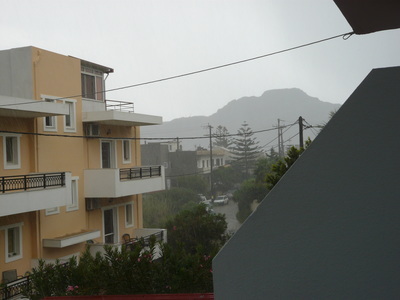 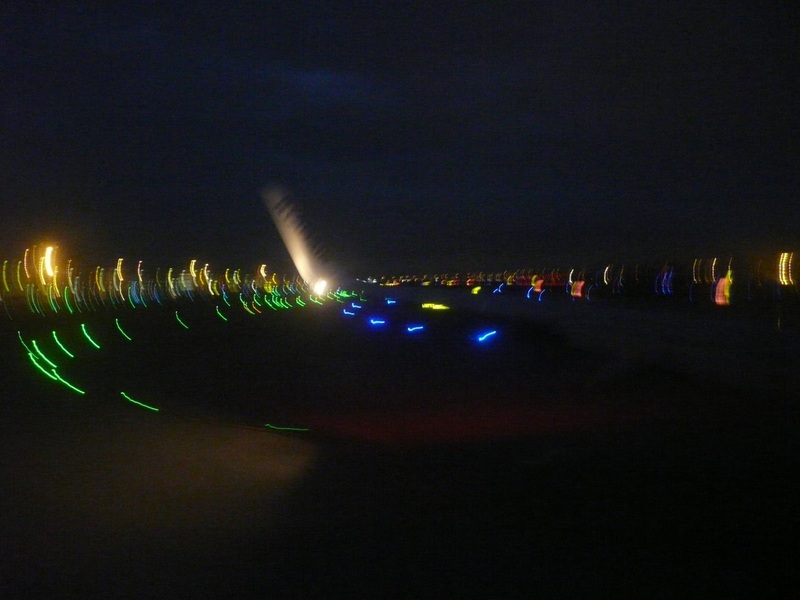 left Dublin around 6 am to arrive in rainy Manchester and finally after a five year absence Heraklion at around 7.40pm. 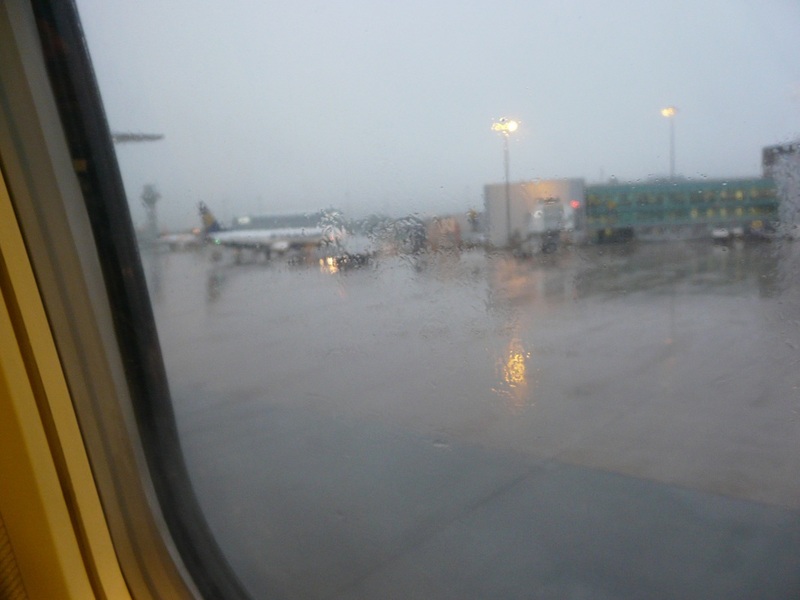 I could taste of the salt air as I exited the plane...wow. 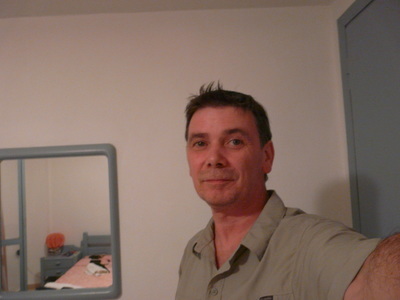 Forgot to mention I met some guy called Mike and his friend Viv in Manchester. Day Two. 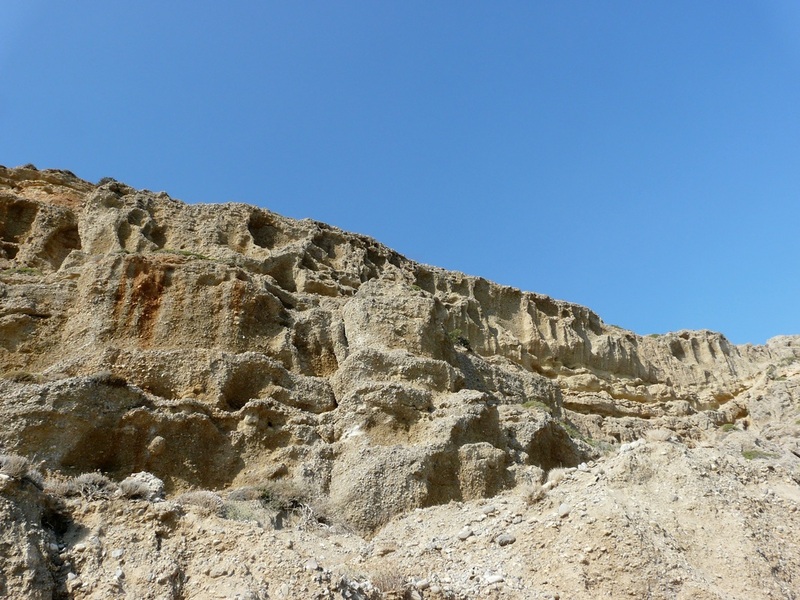 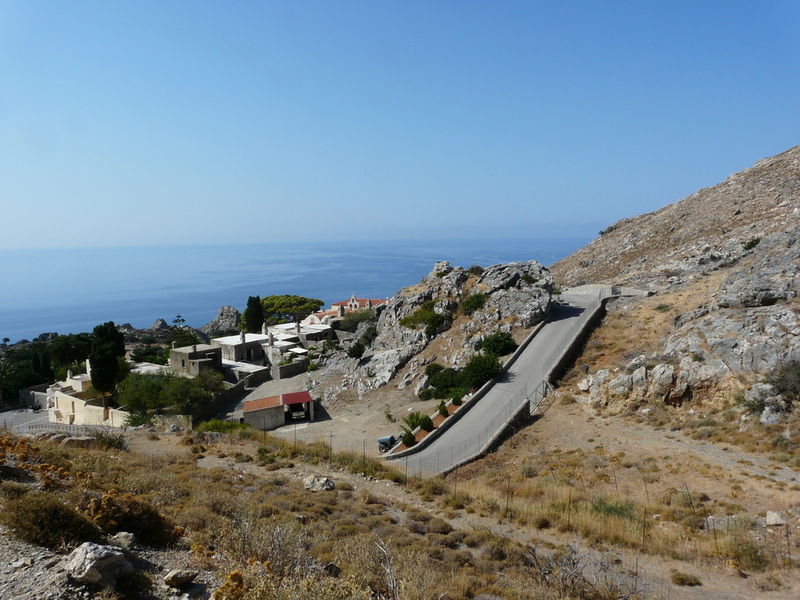 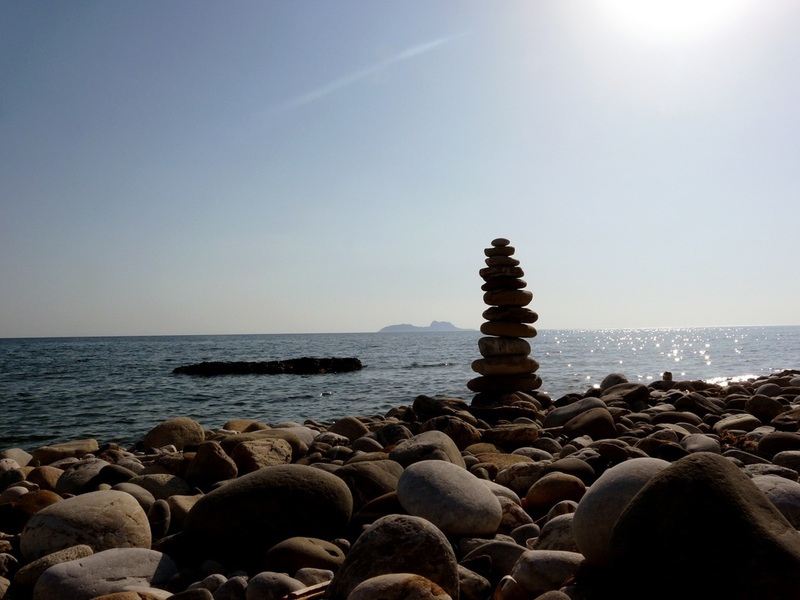 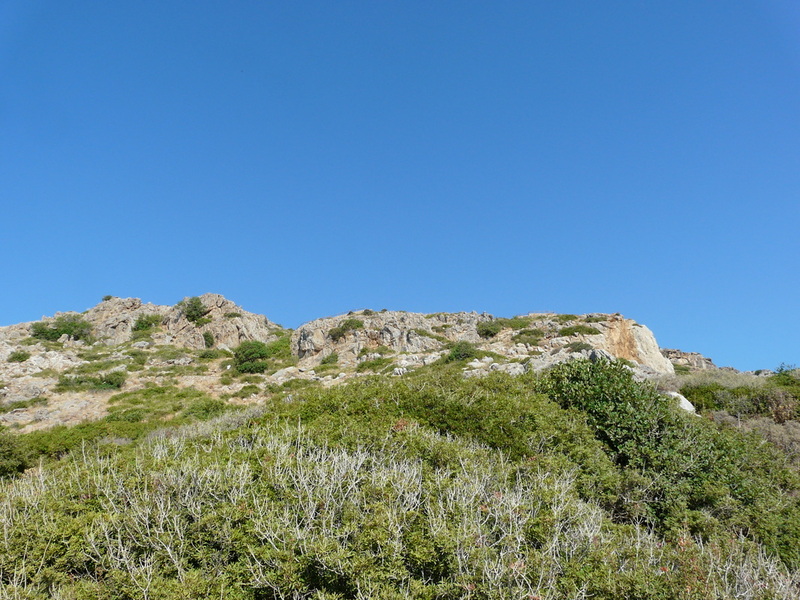 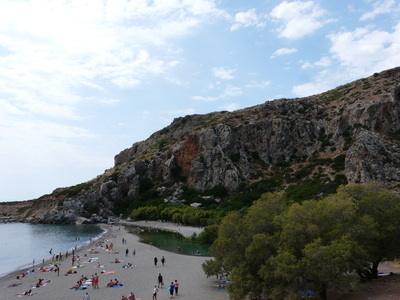 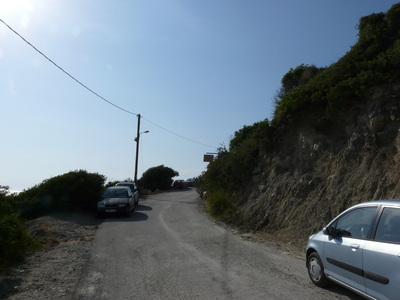 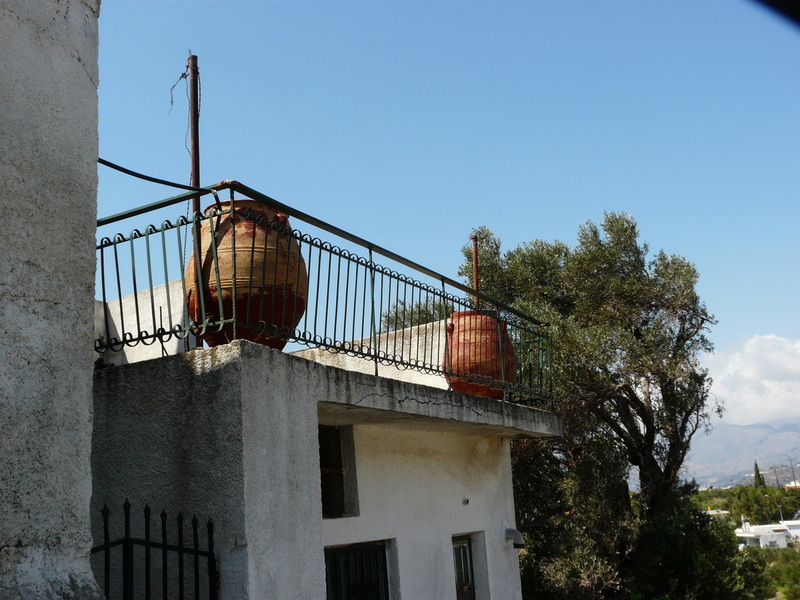 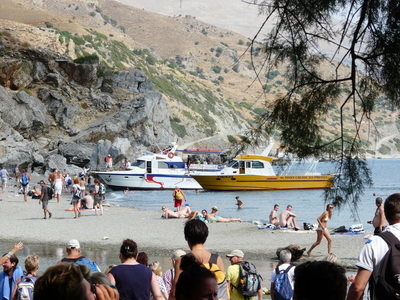 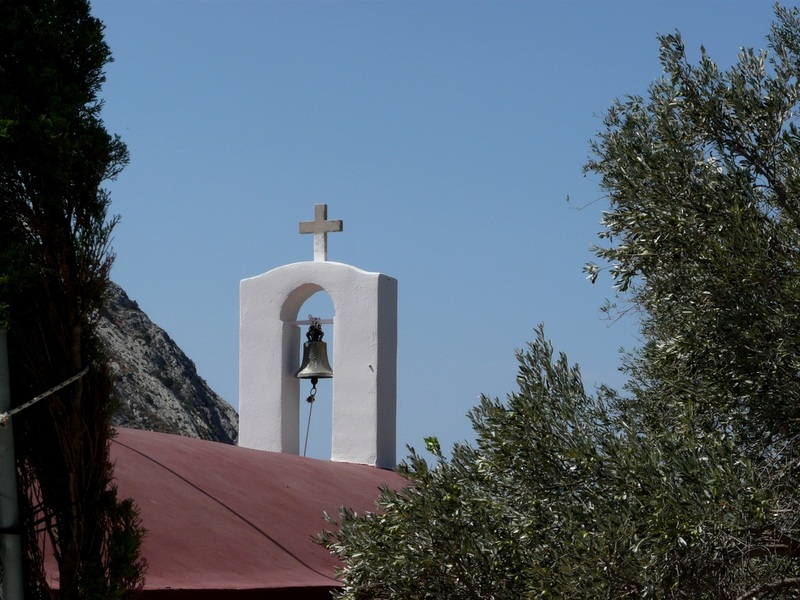 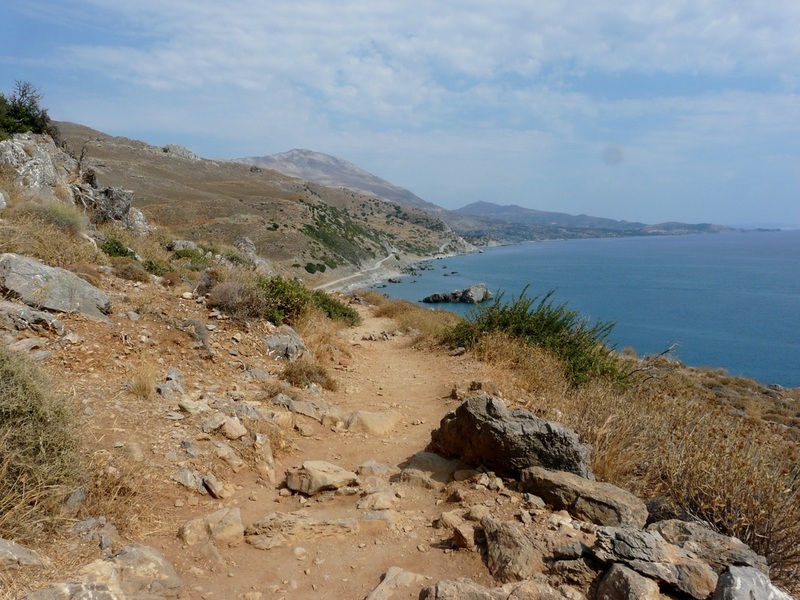 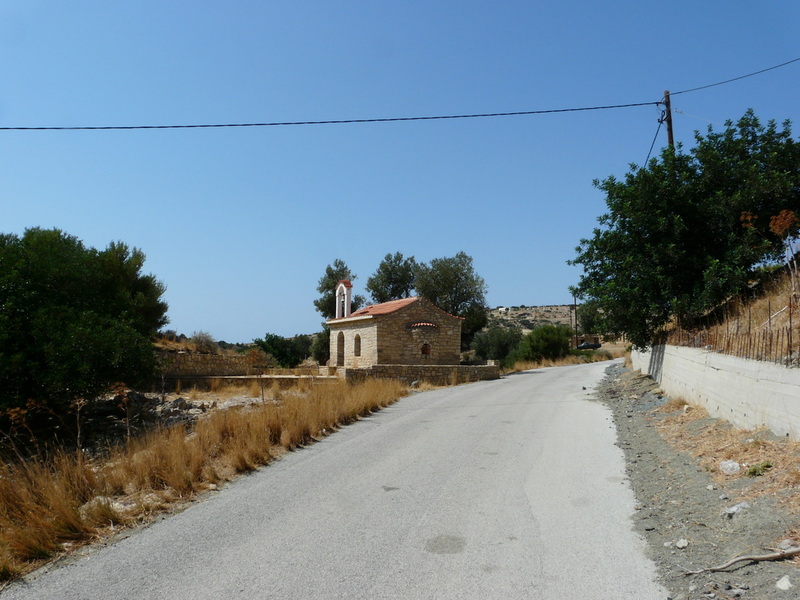 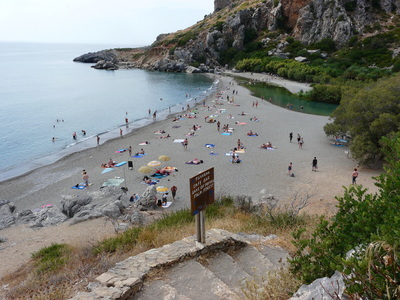 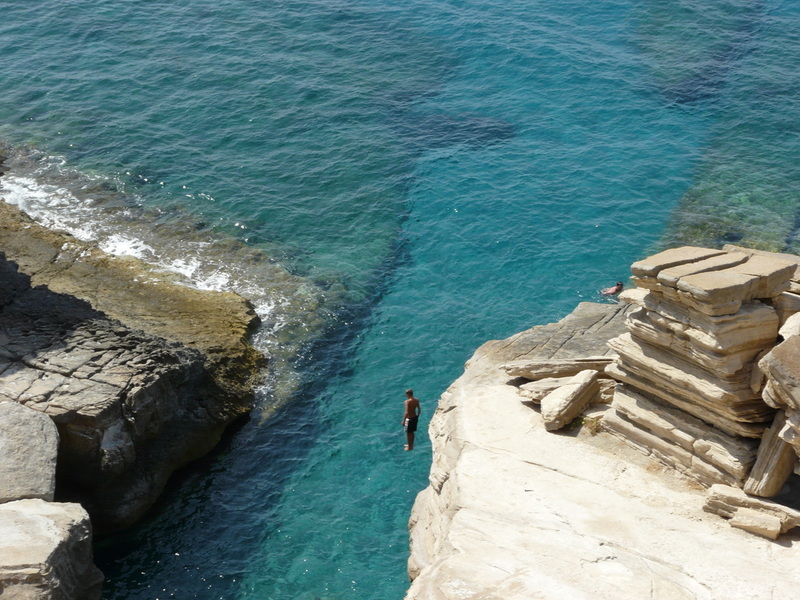 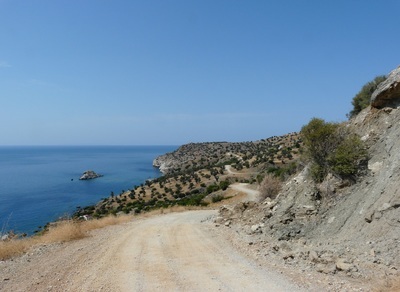 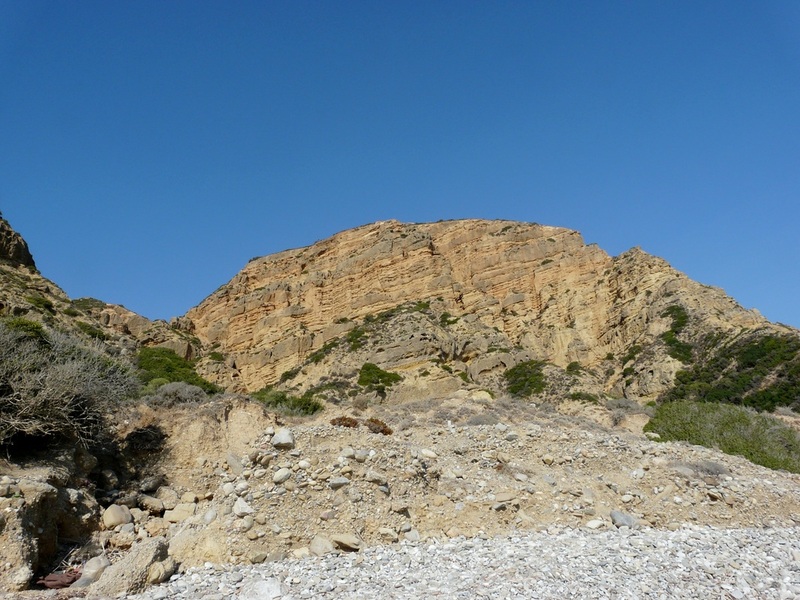 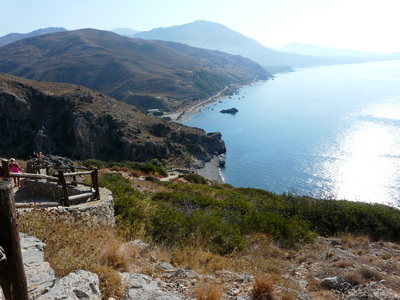 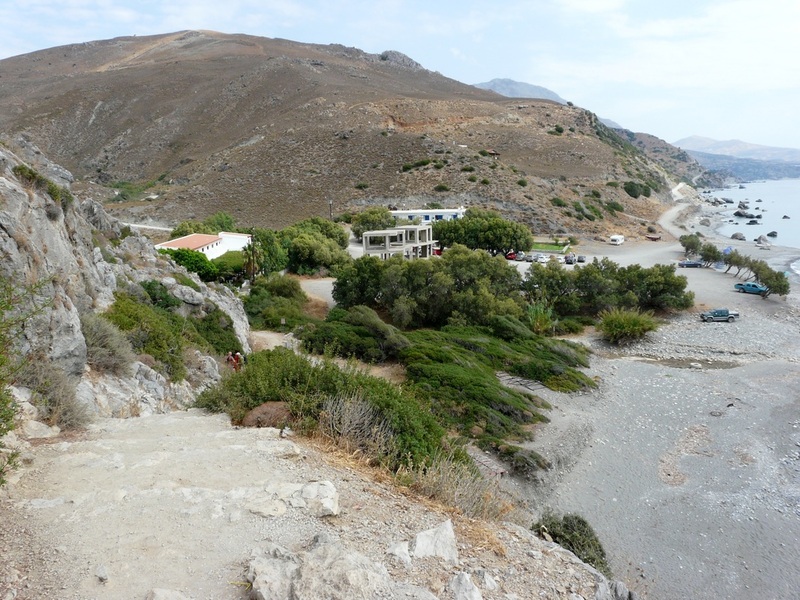 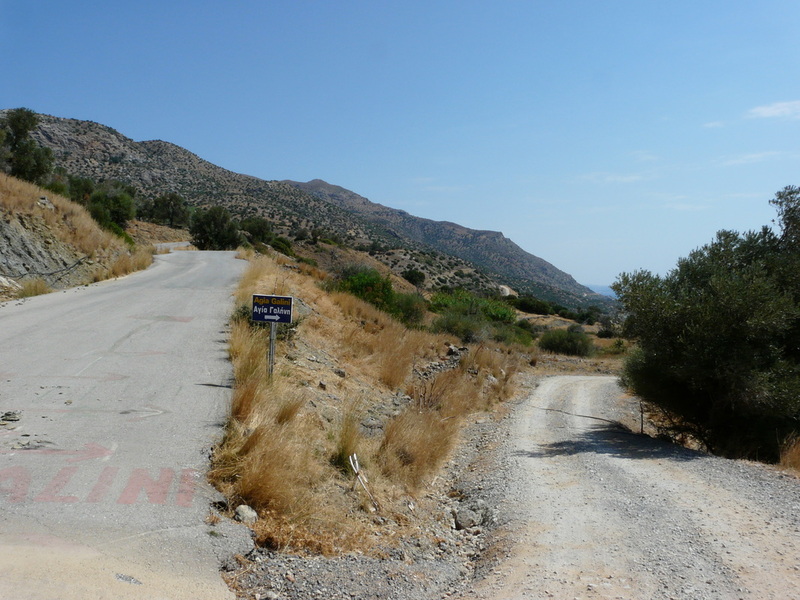 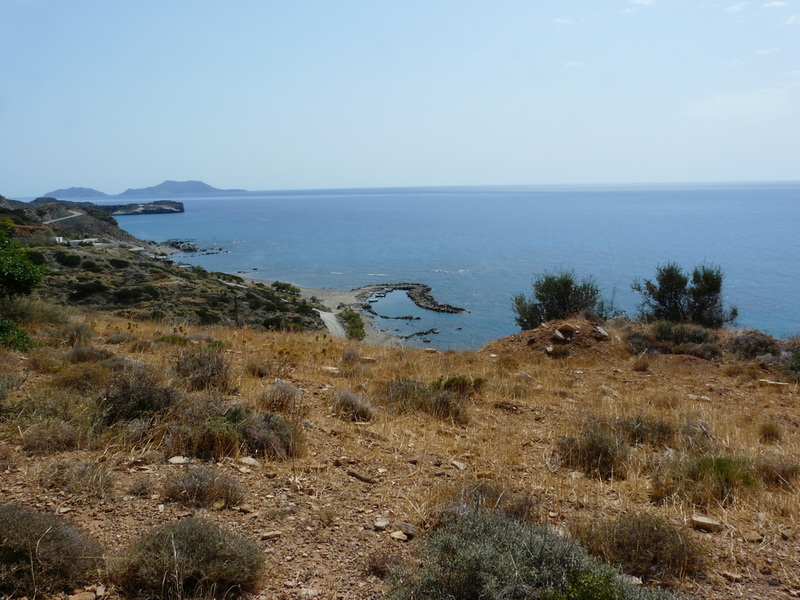 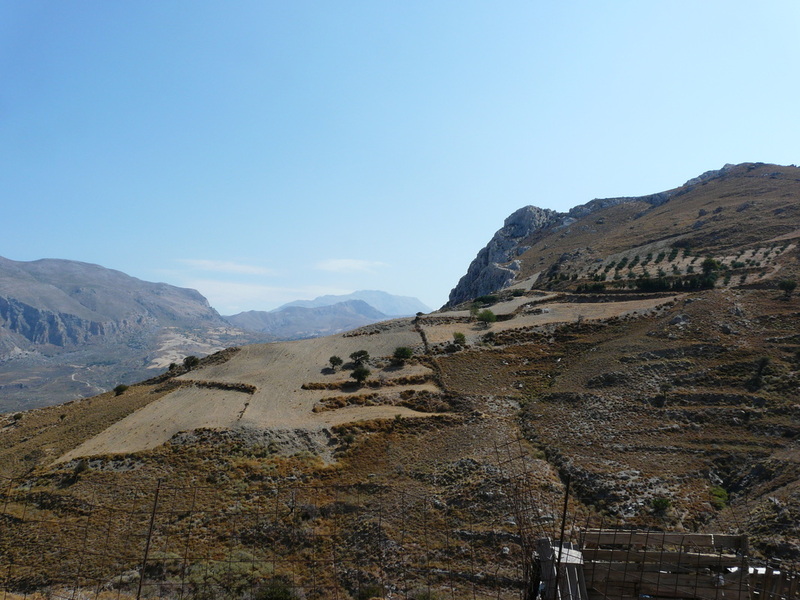 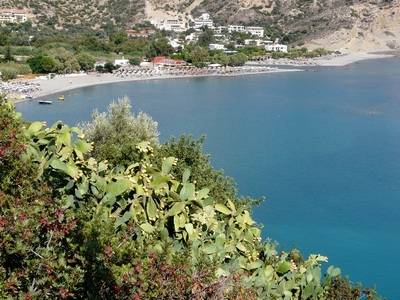 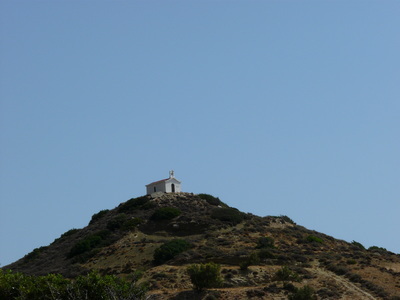 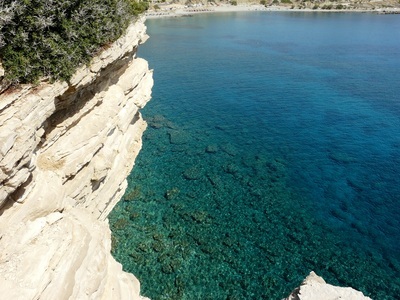 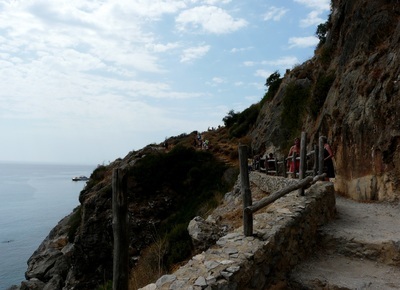 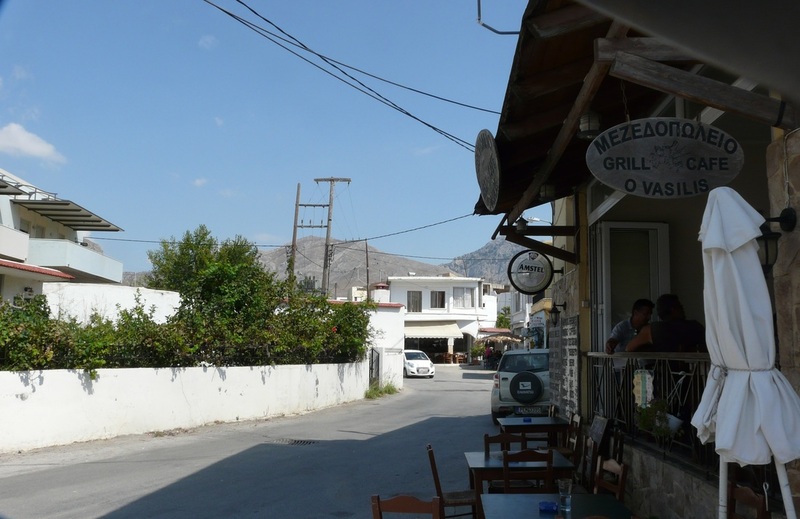 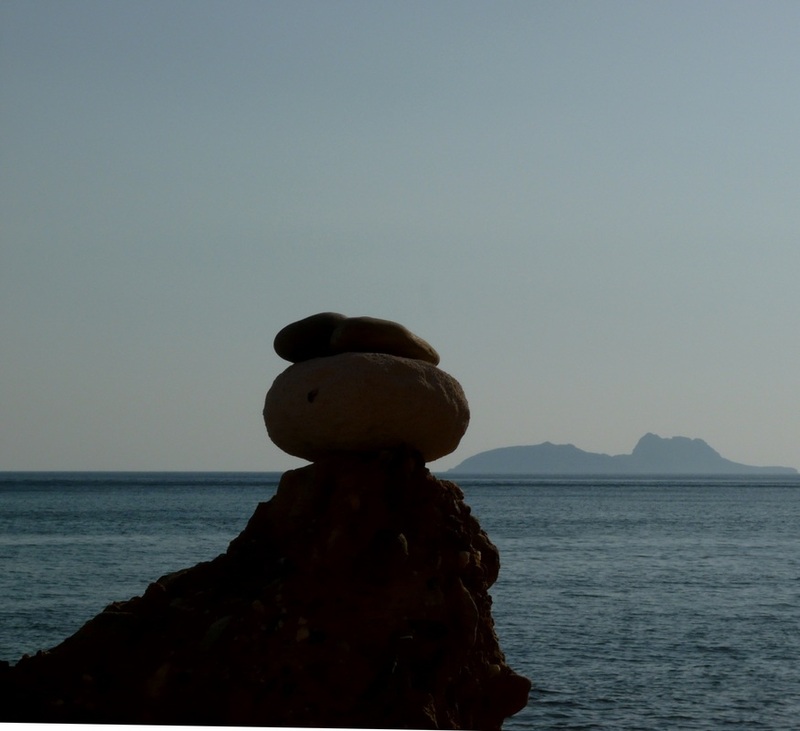 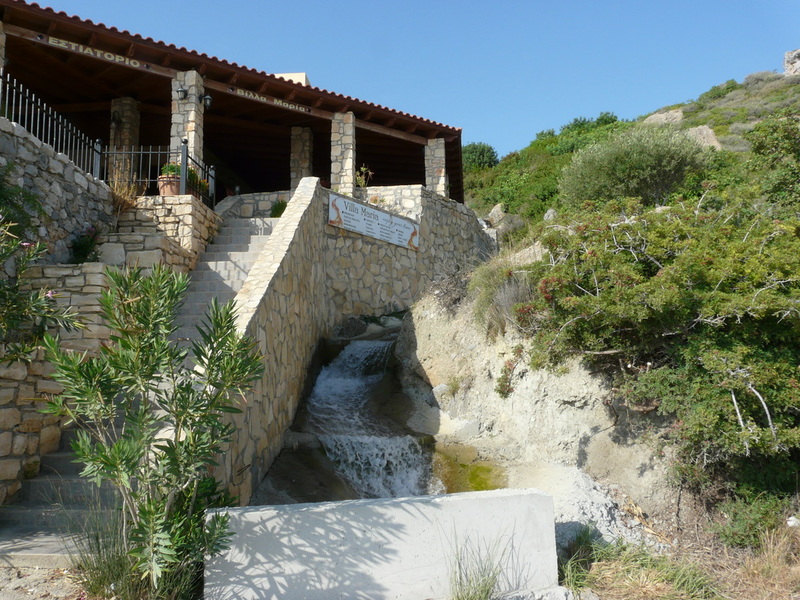 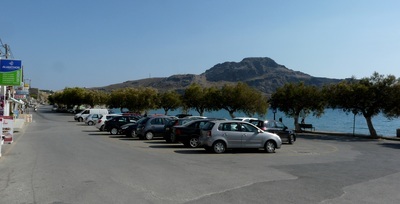 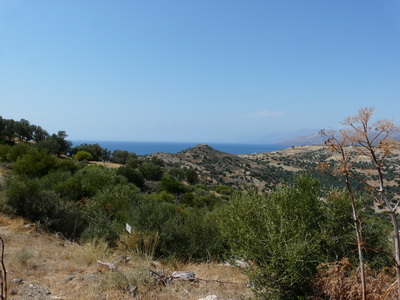 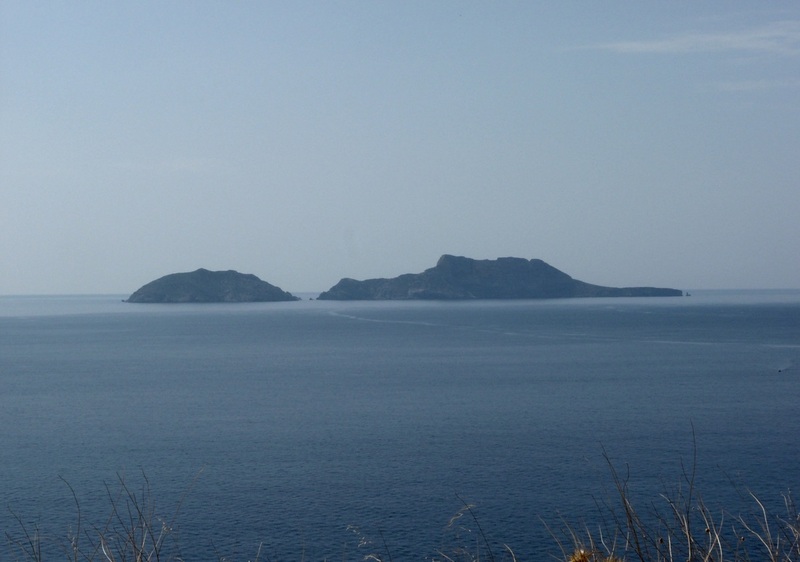 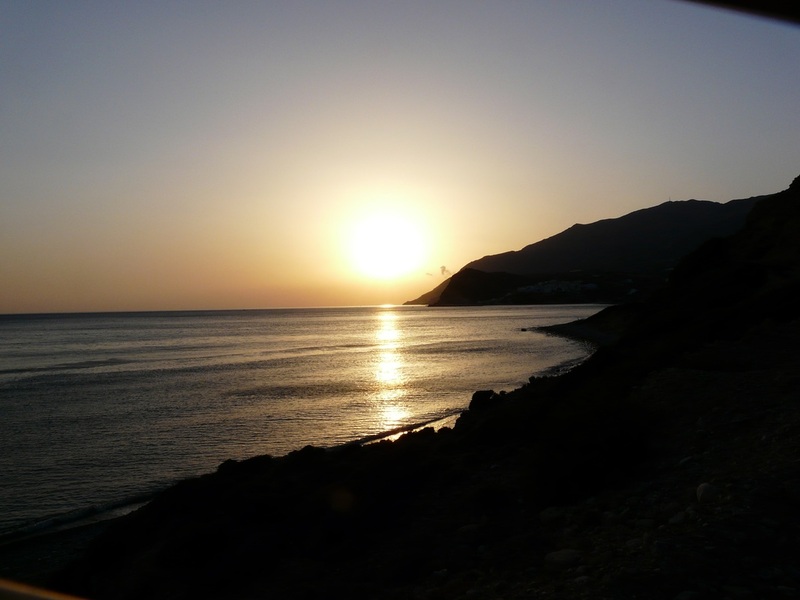 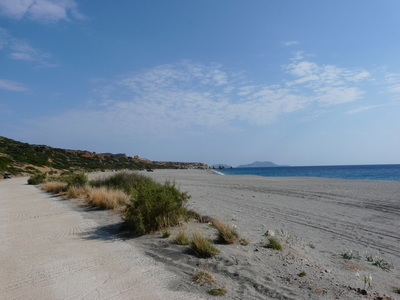 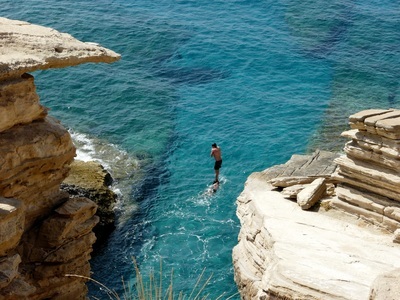 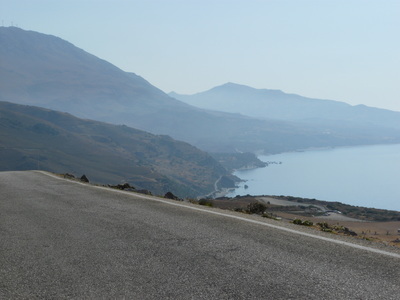 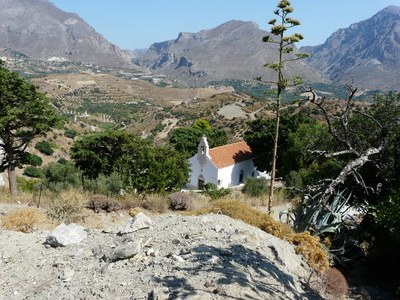 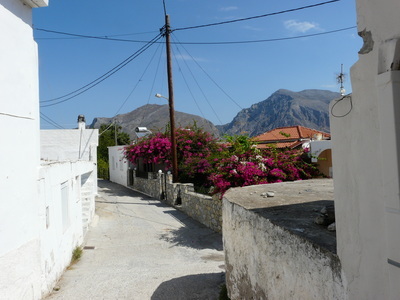 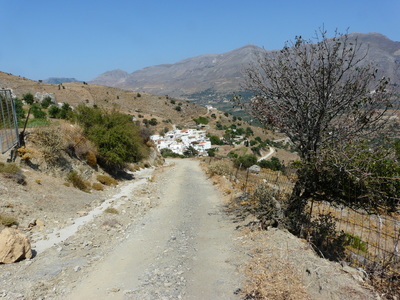 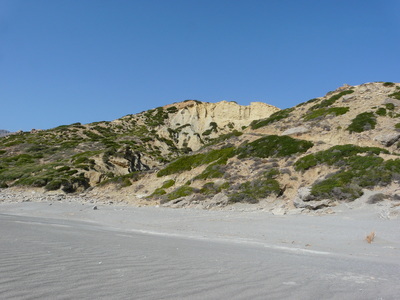 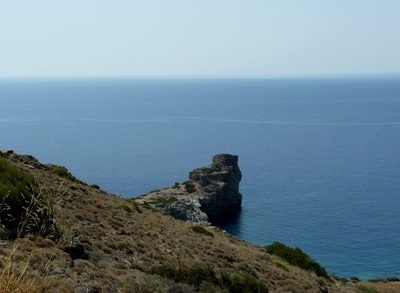 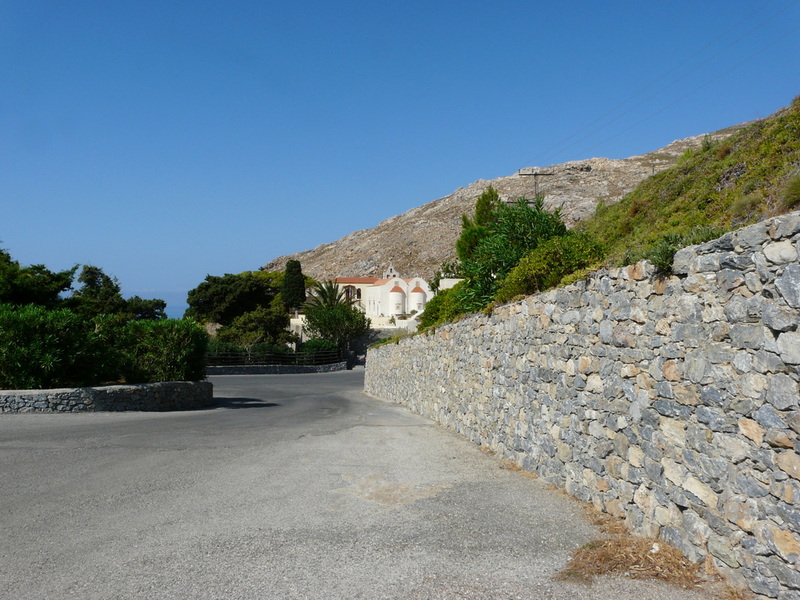 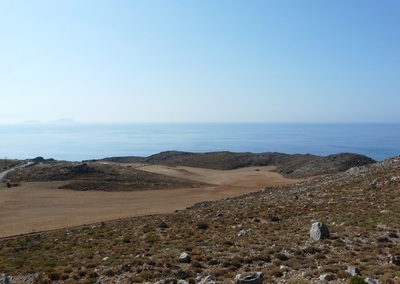 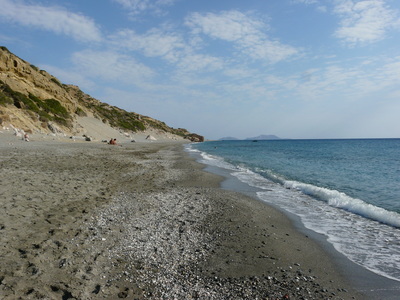 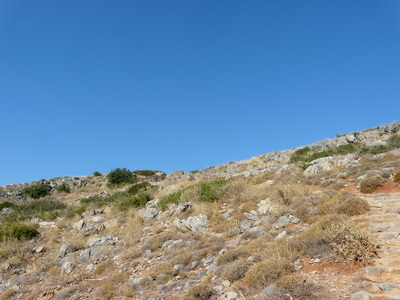 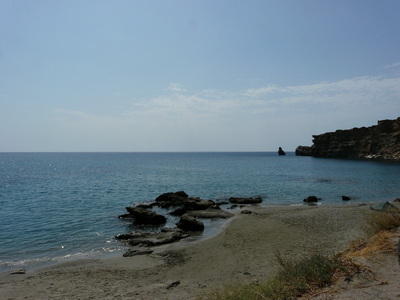 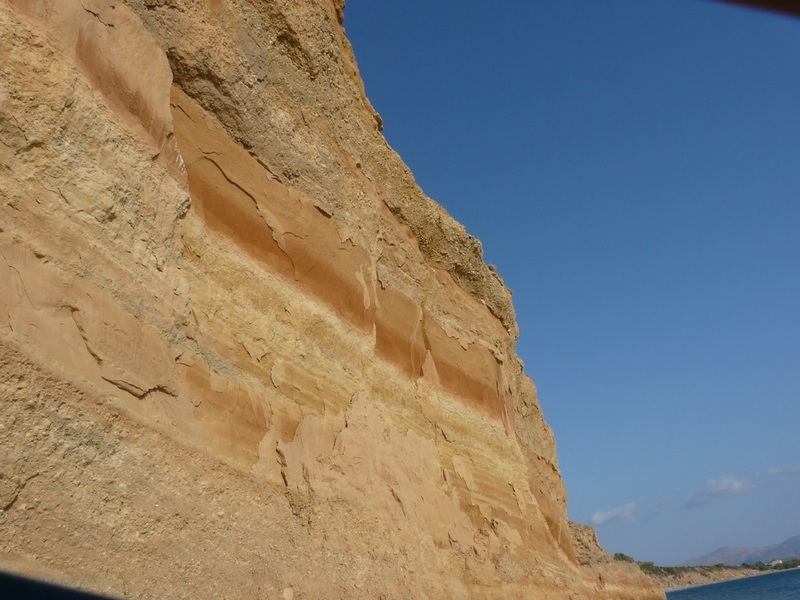 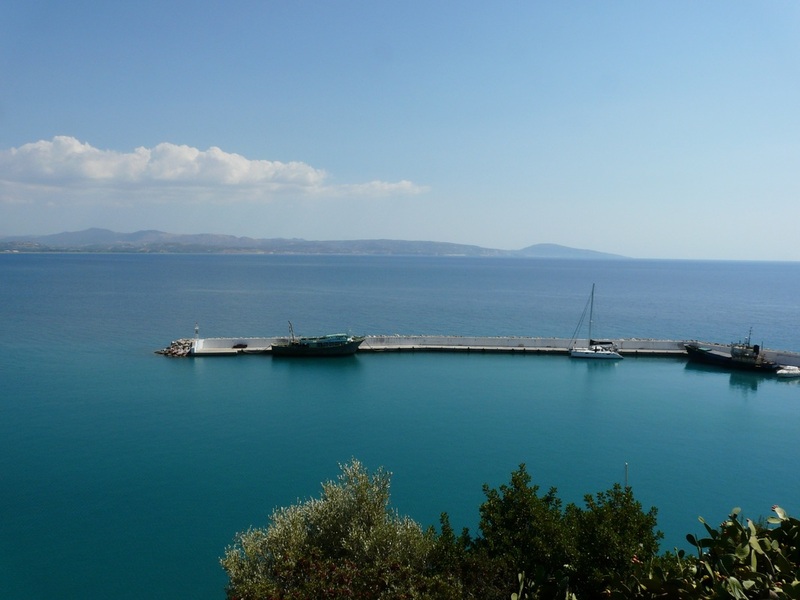 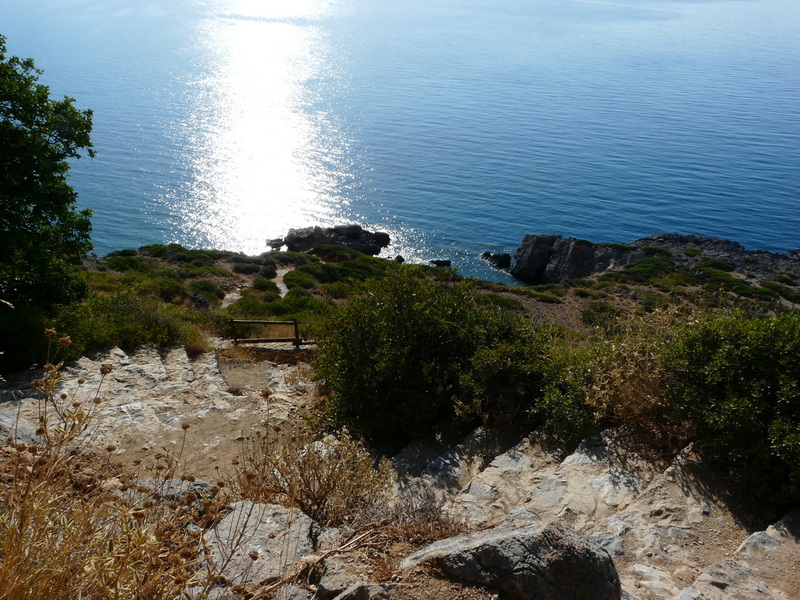 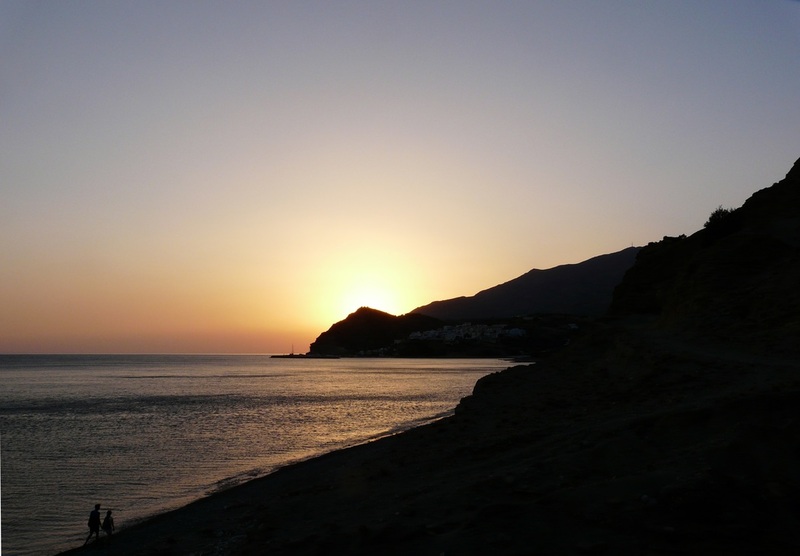 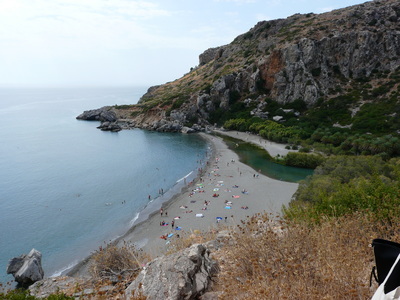 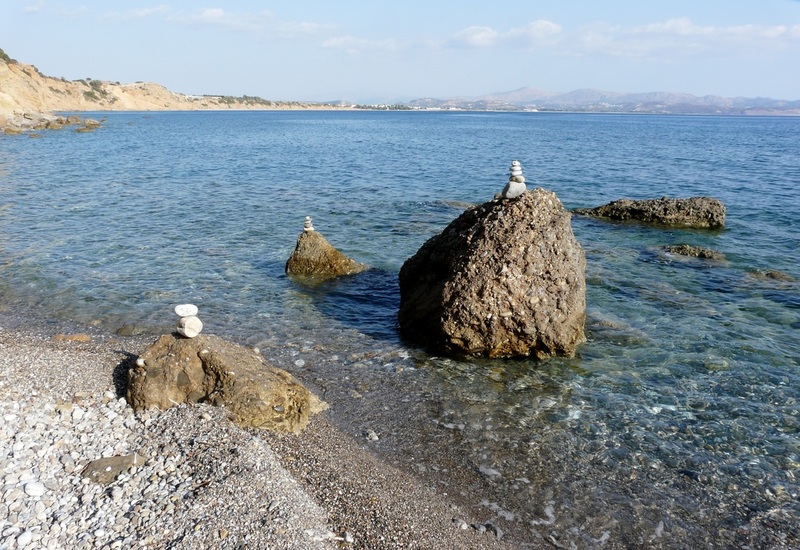 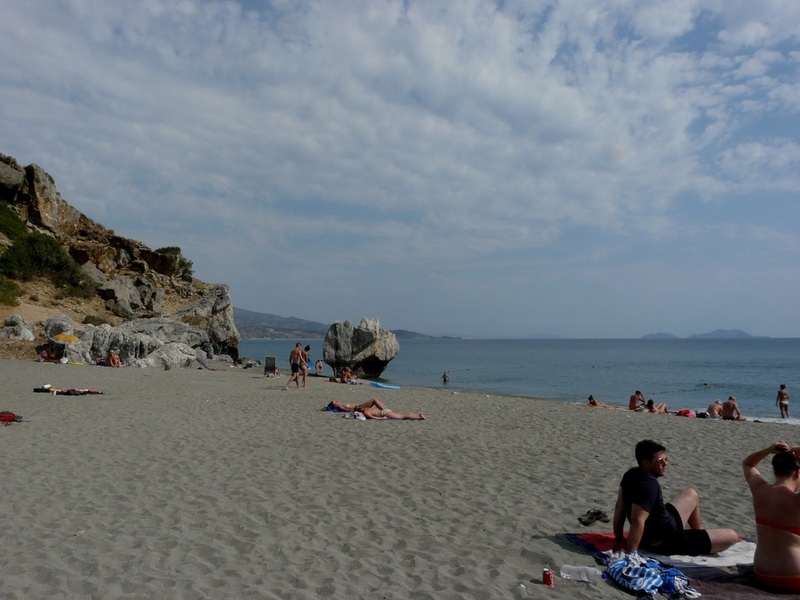 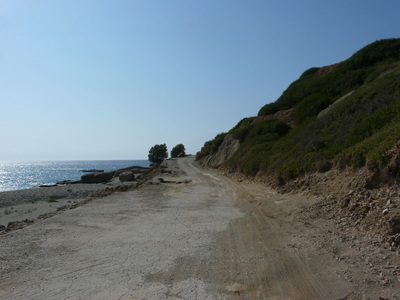 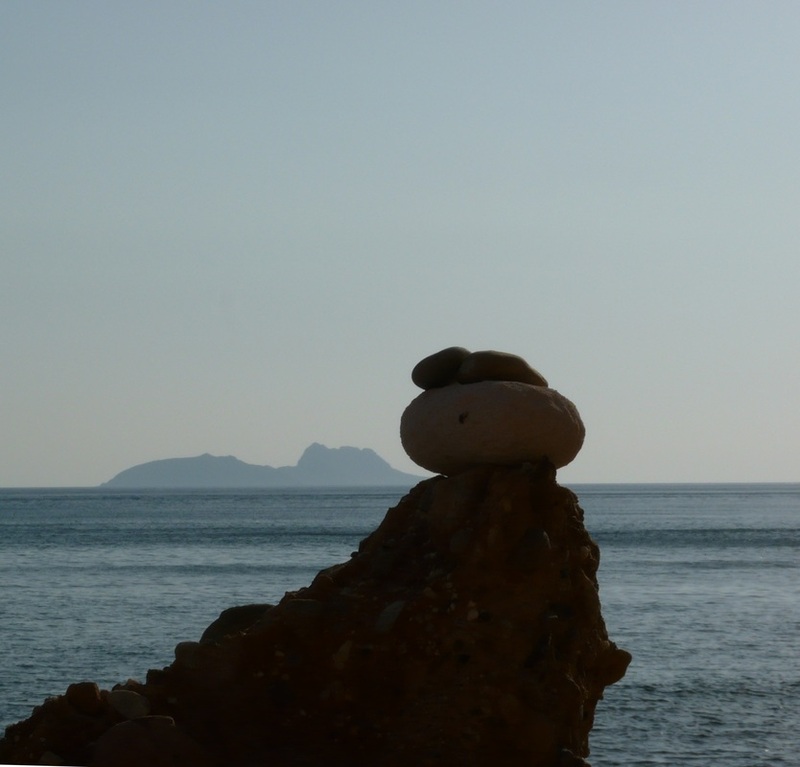 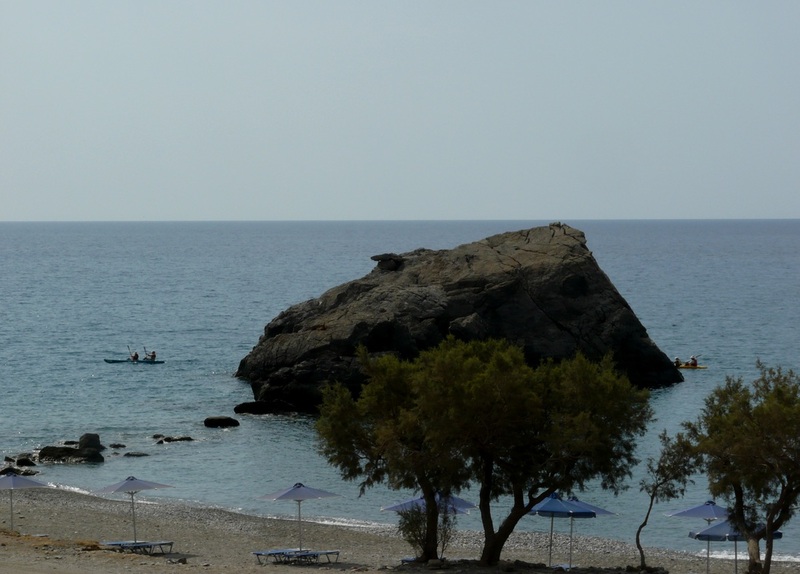 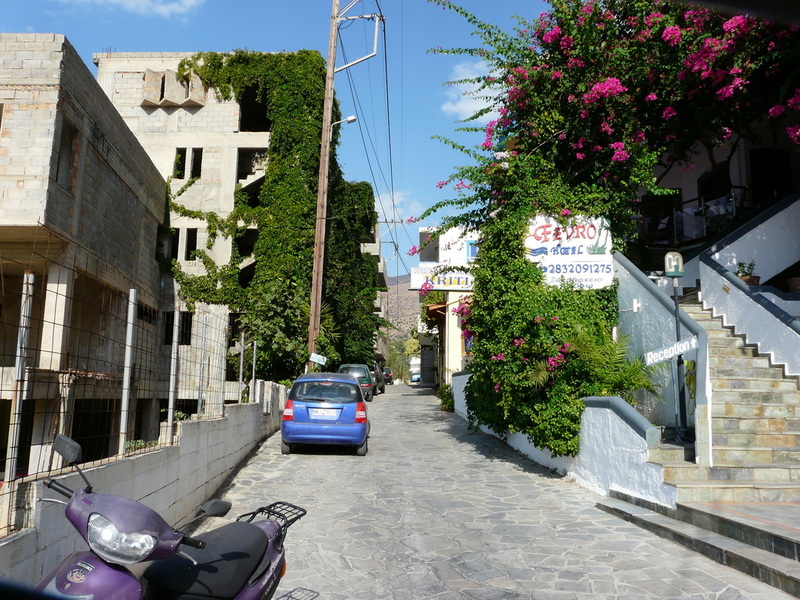 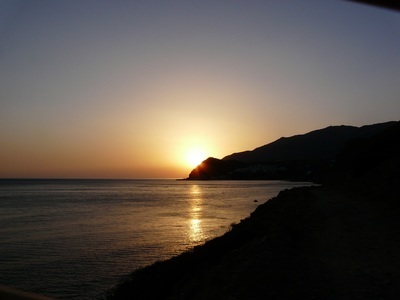 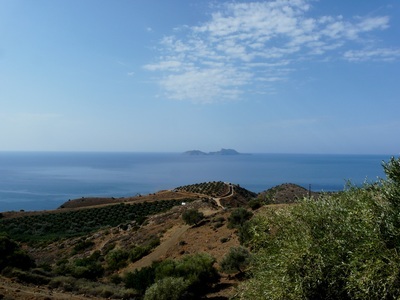 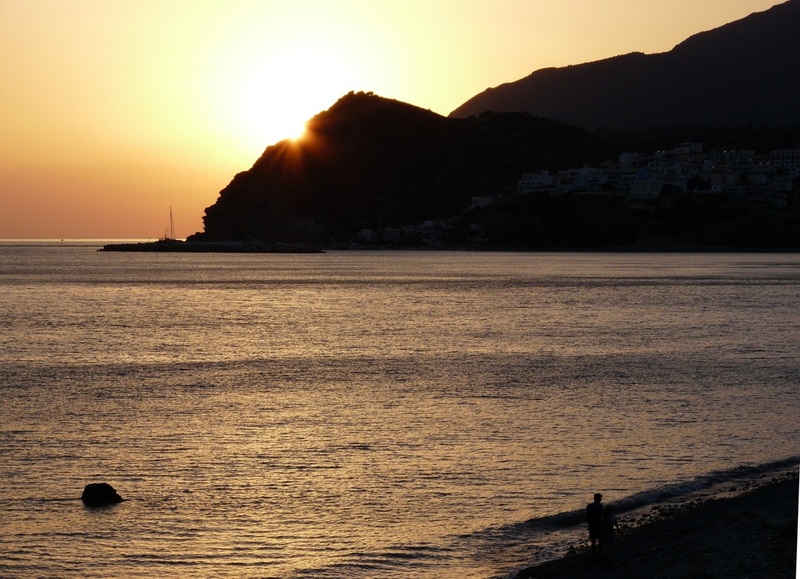 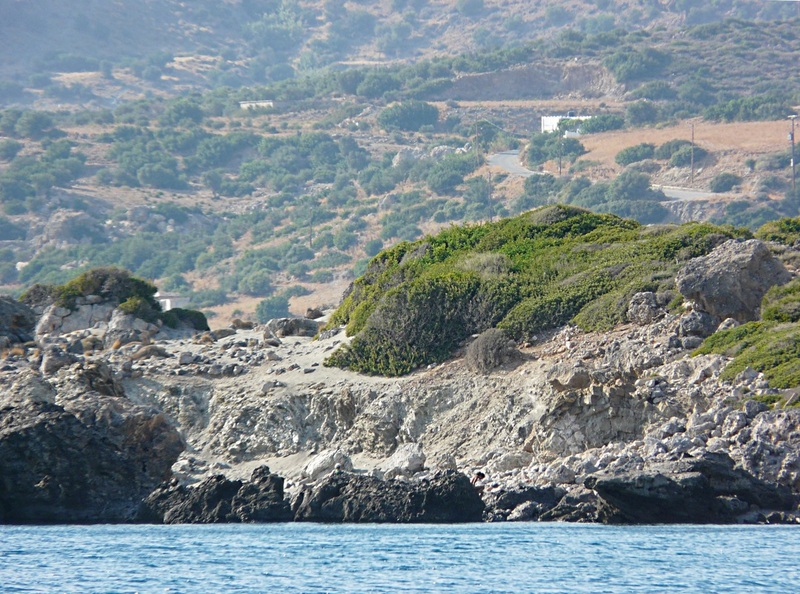 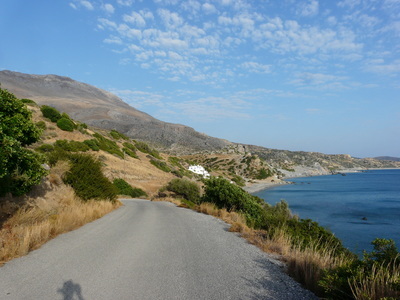 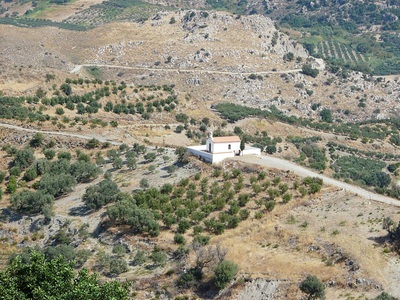 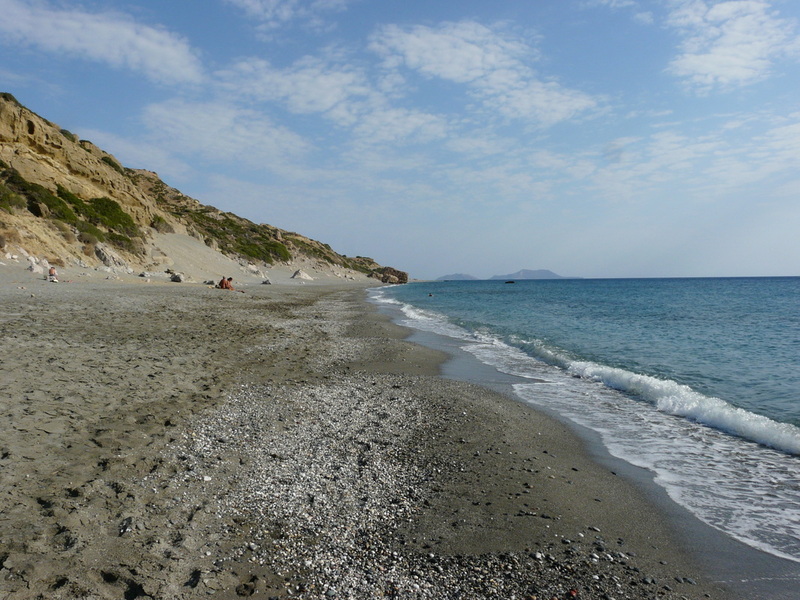 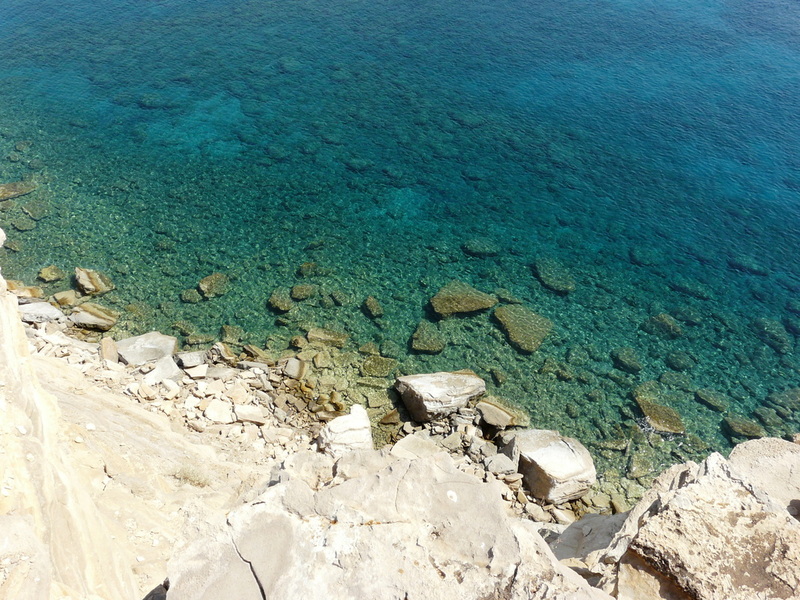 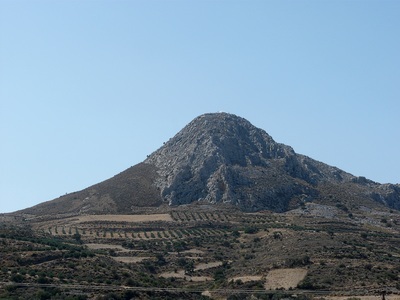 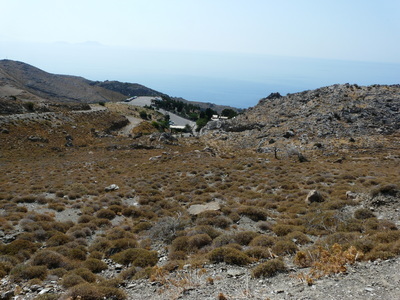 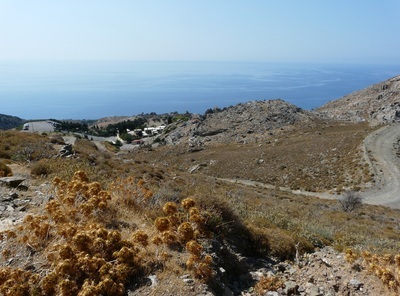 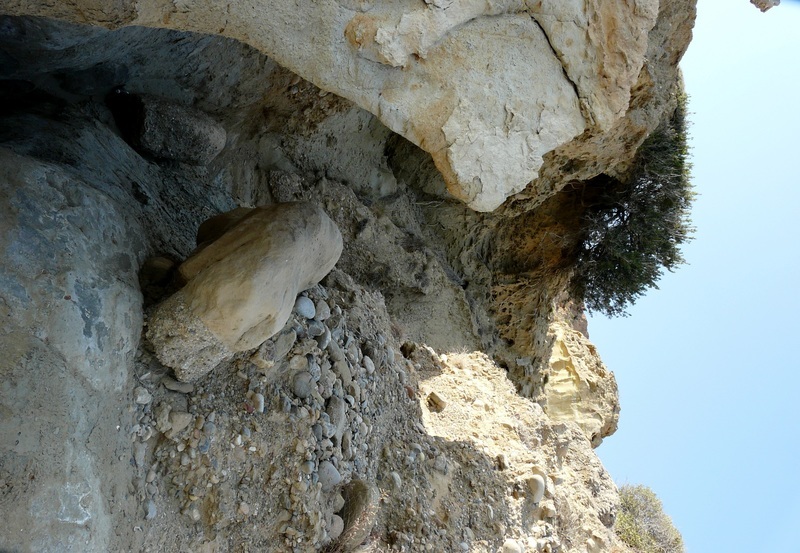 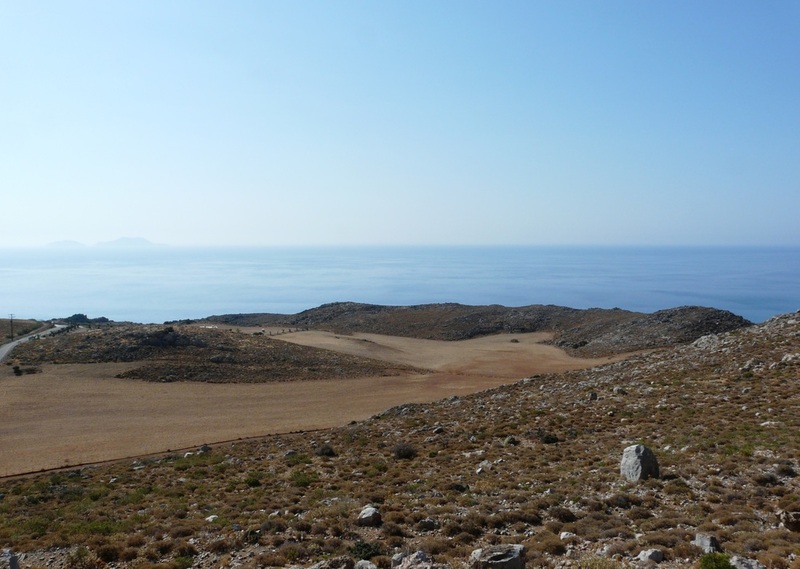 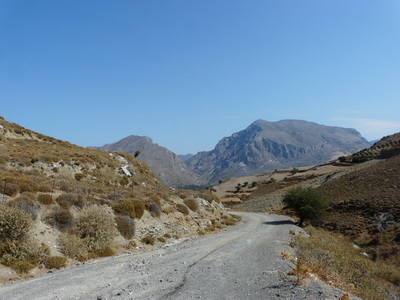 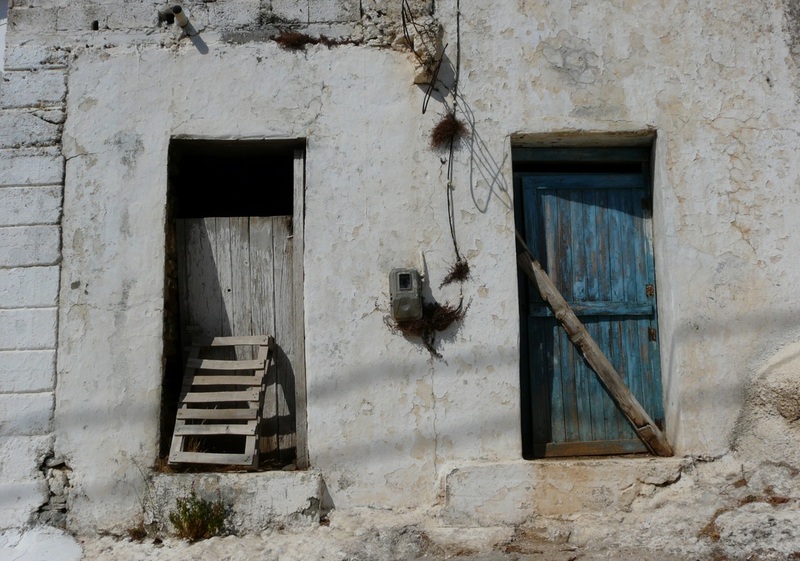 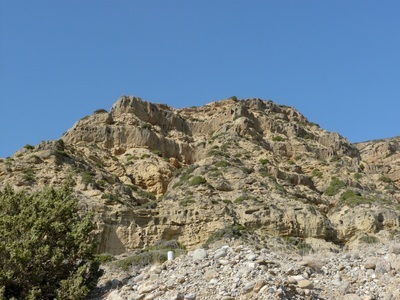 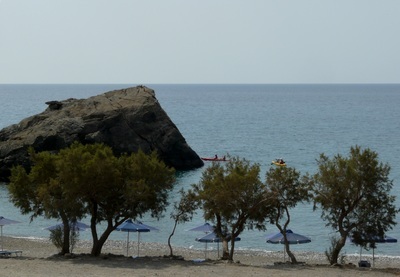 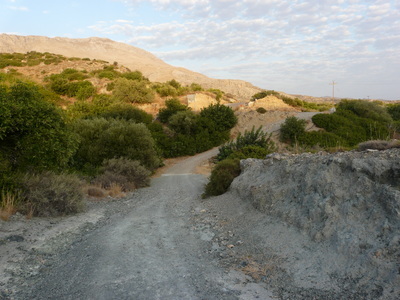 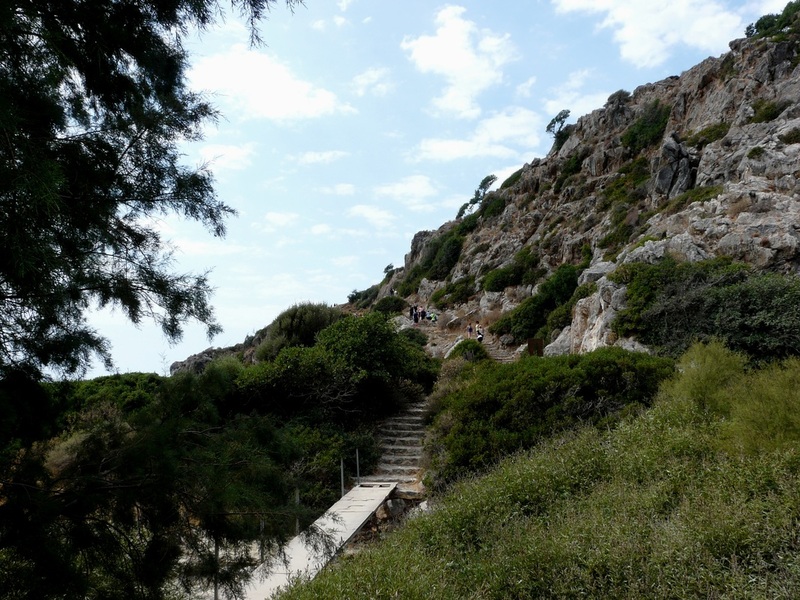 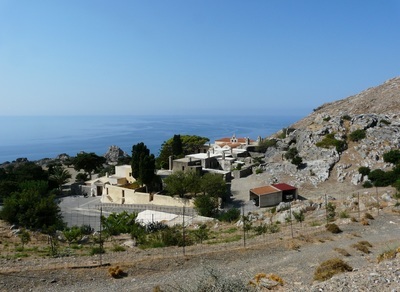 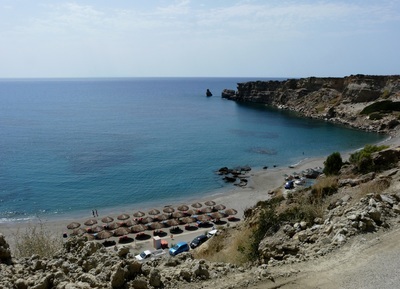 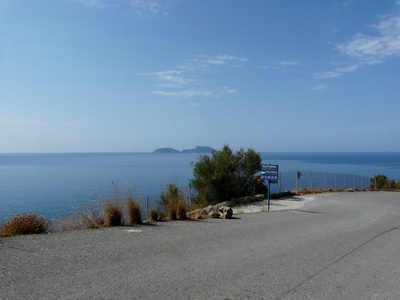 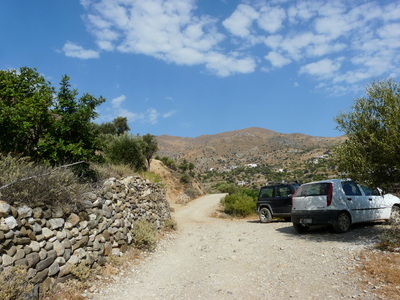 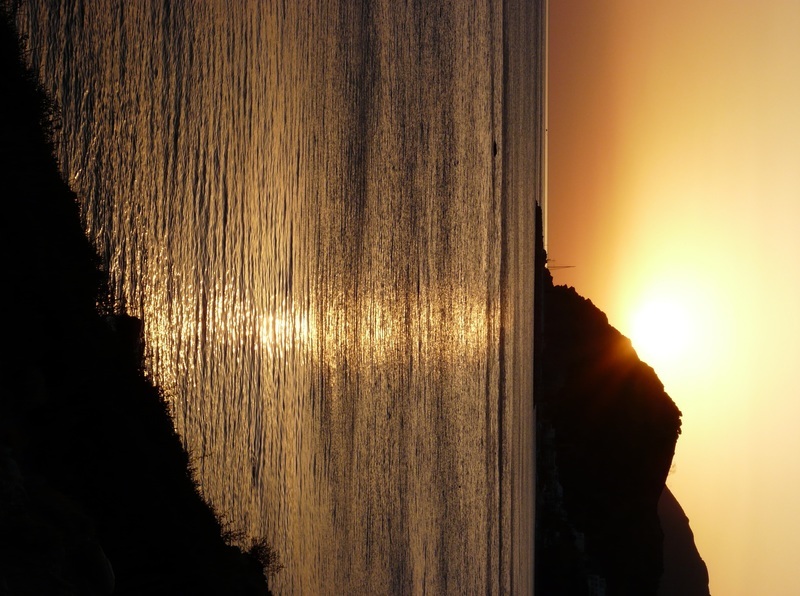 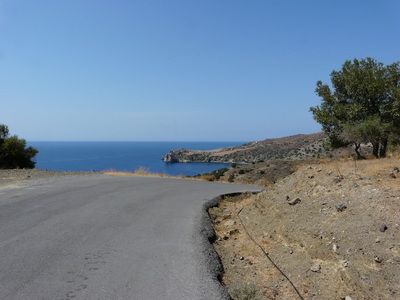 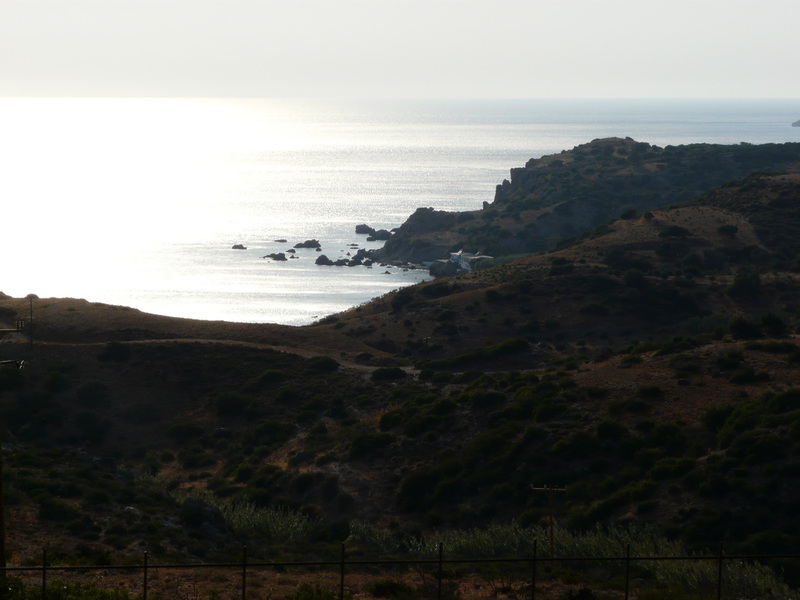 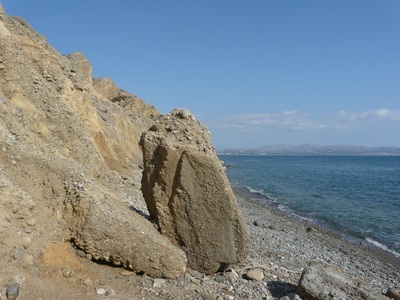 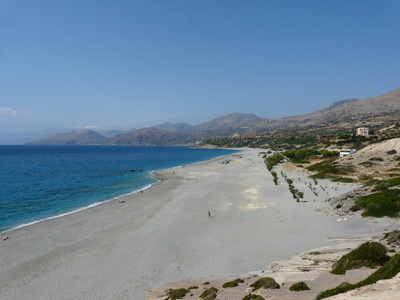 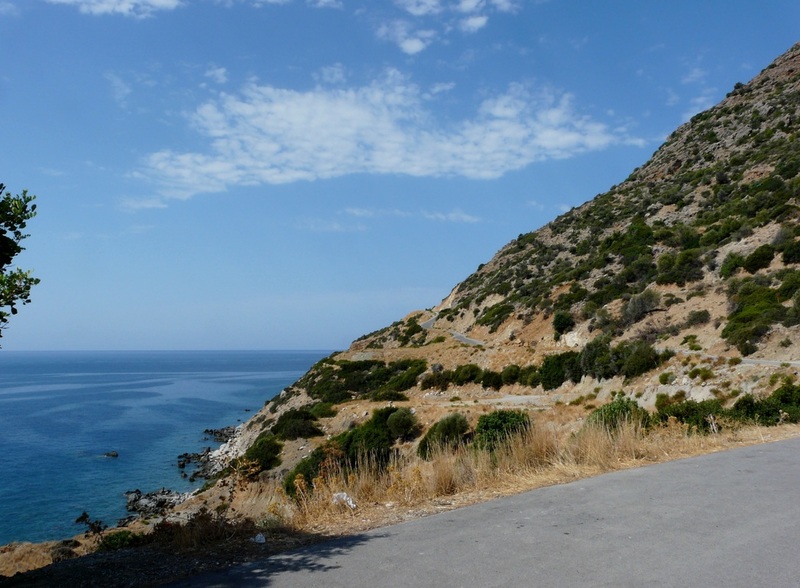 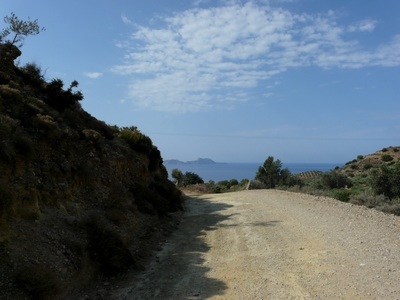 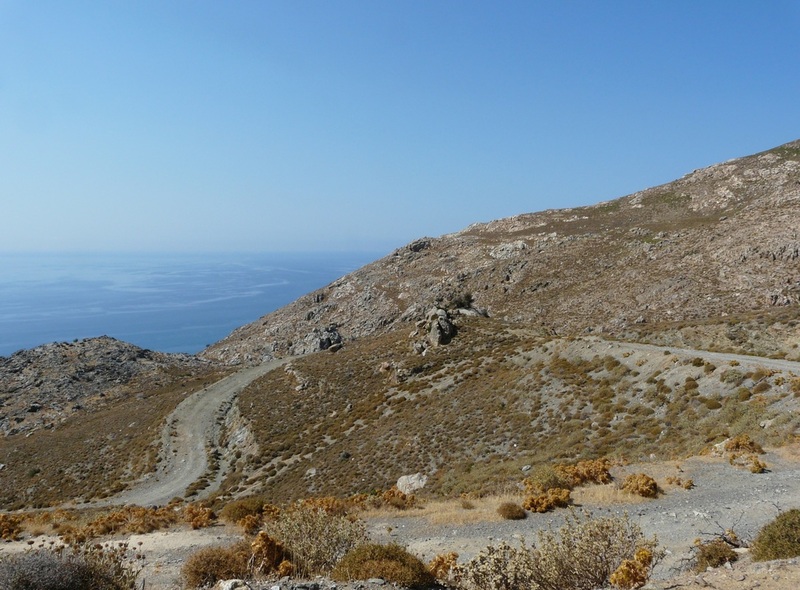 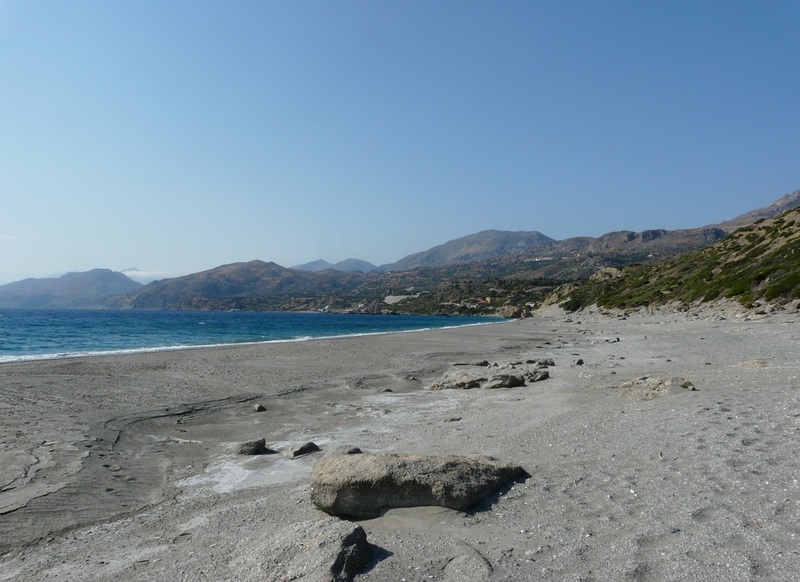 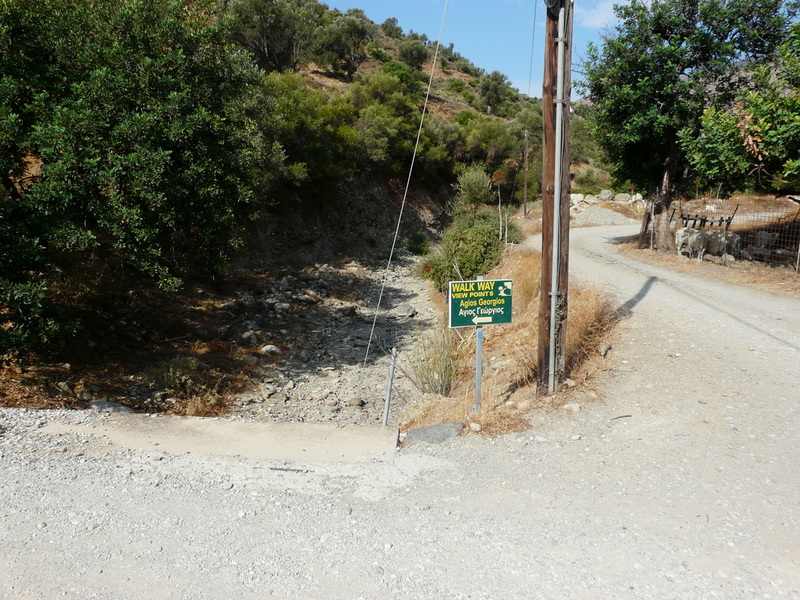 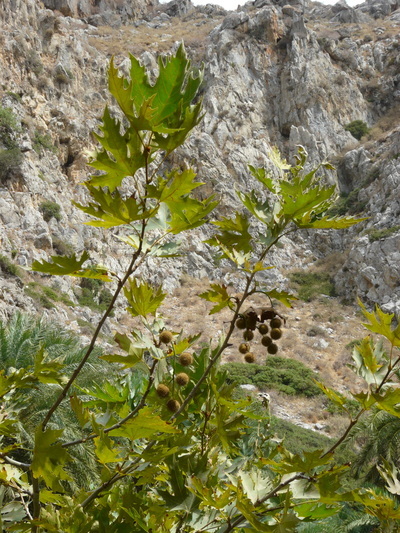 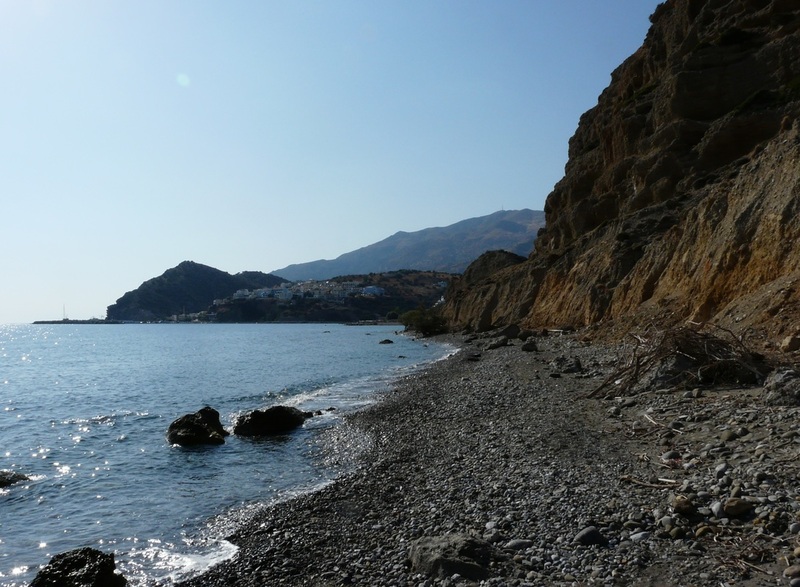 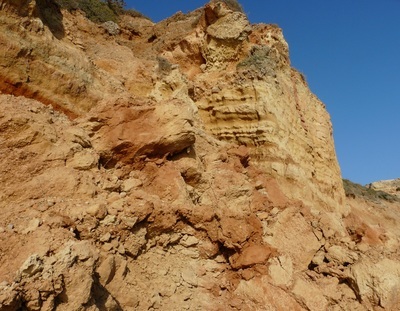 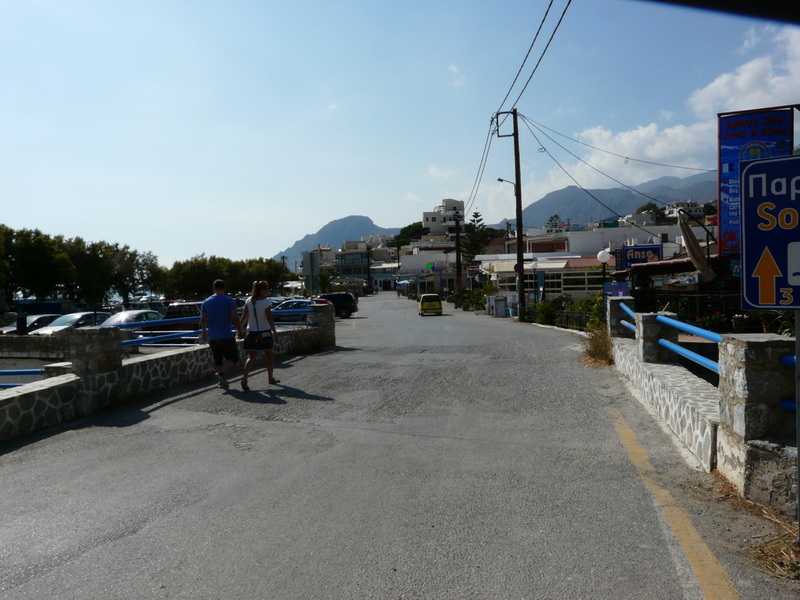 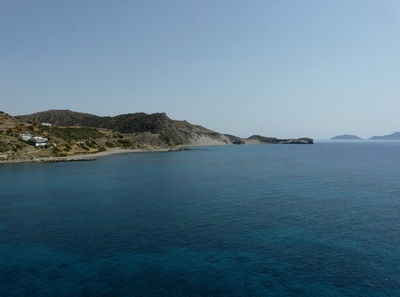 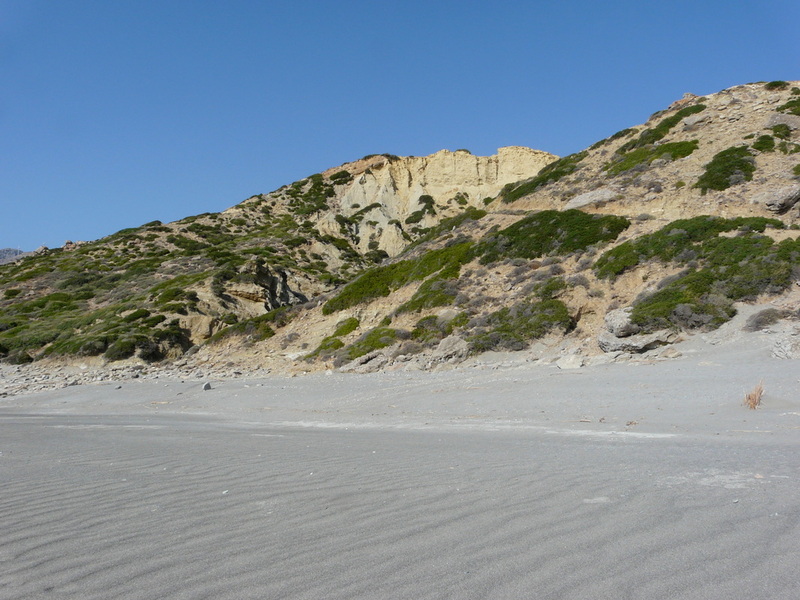 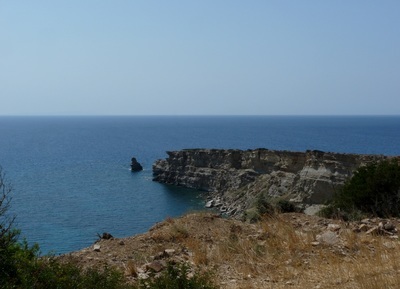 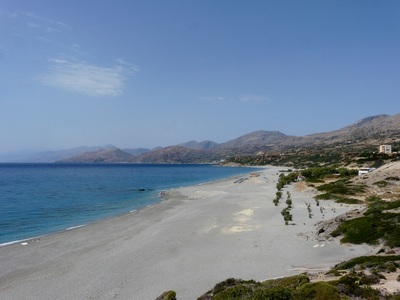 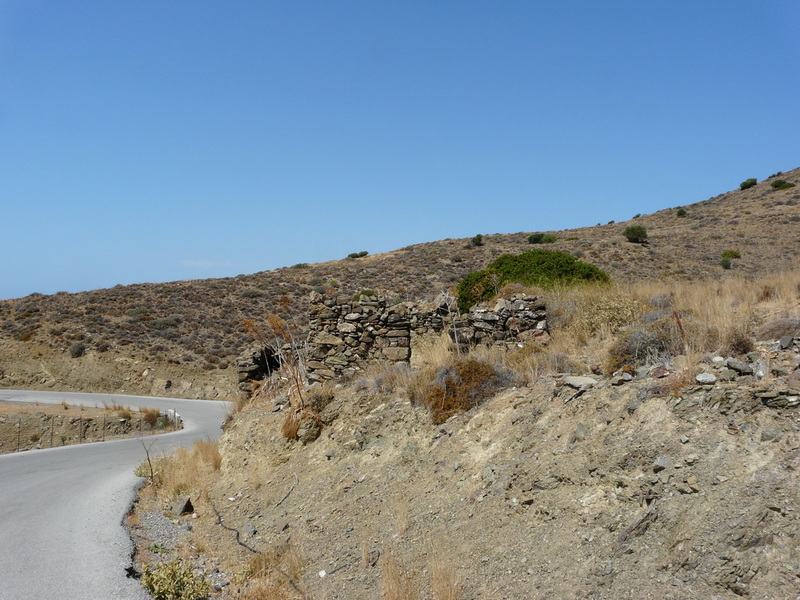 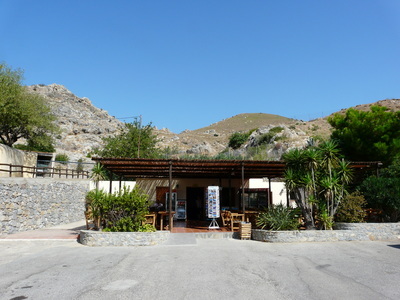 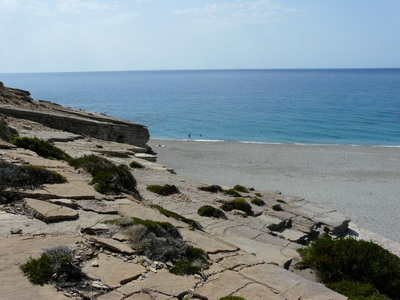 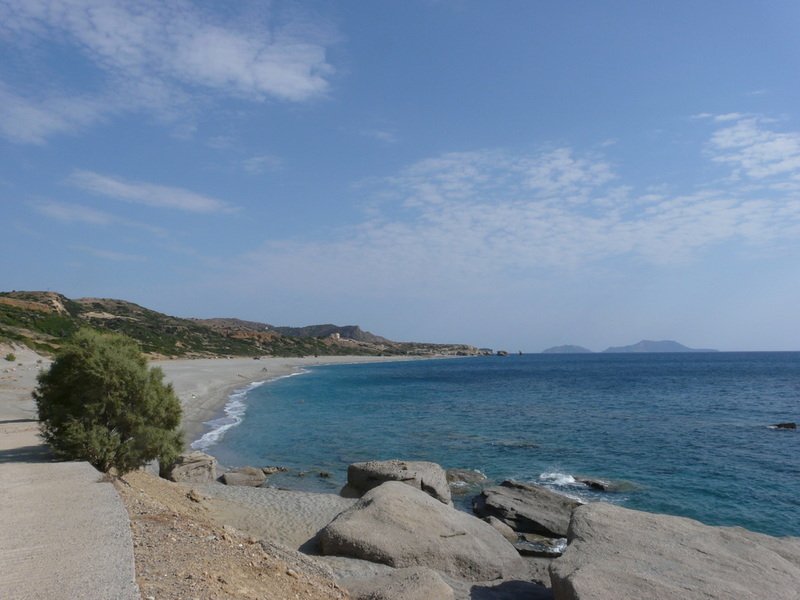 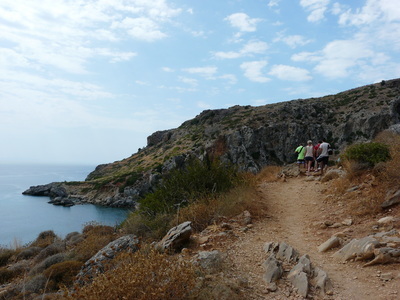 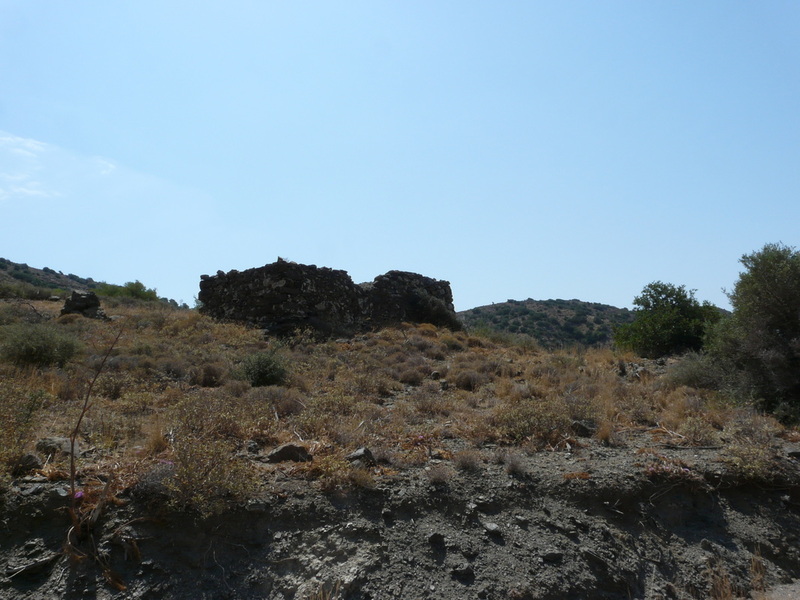 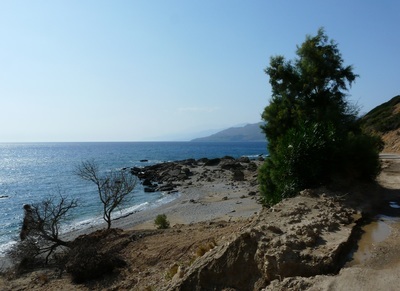 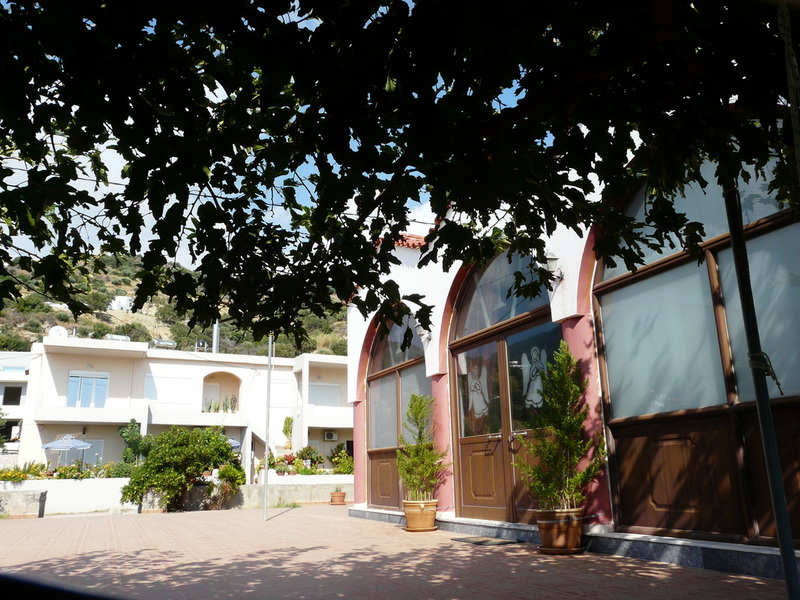 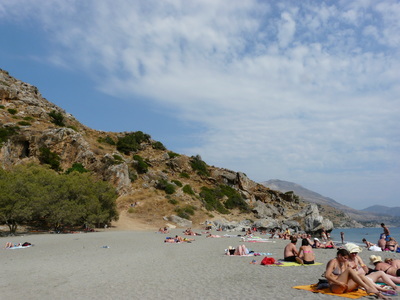 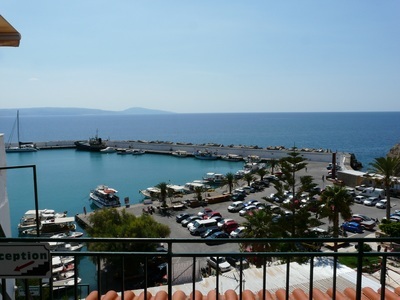 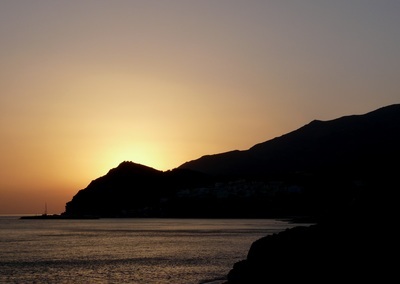 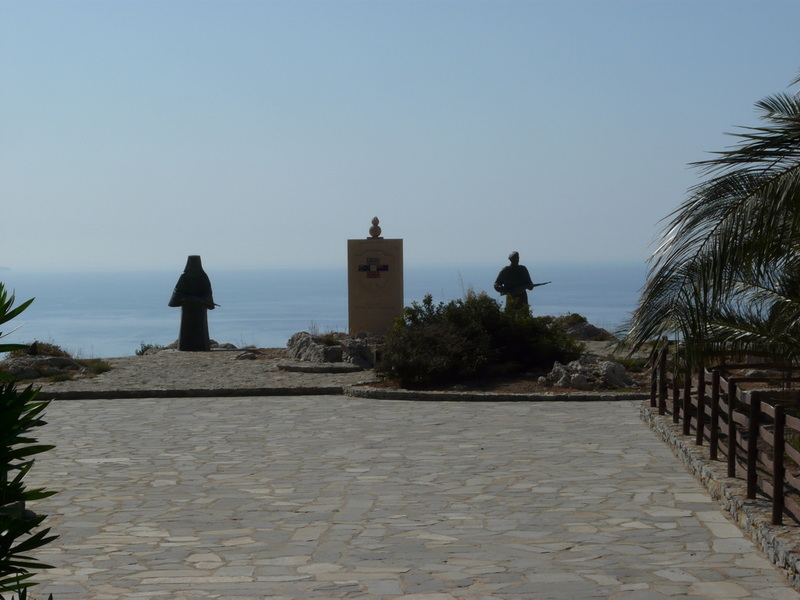 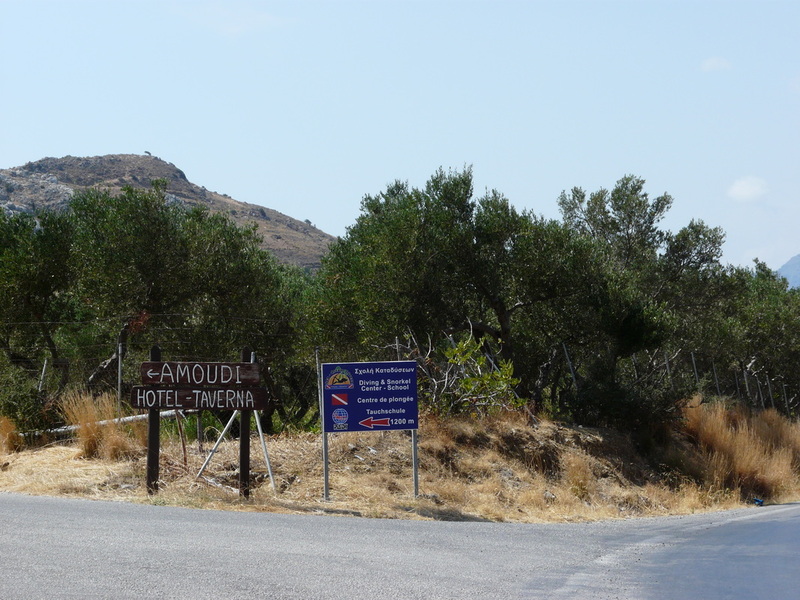 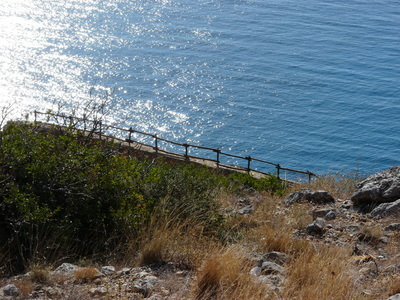 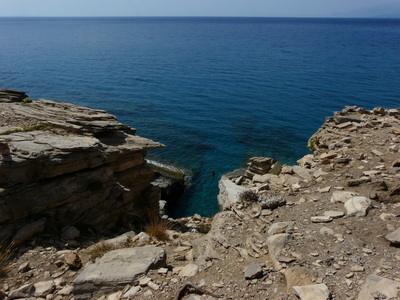 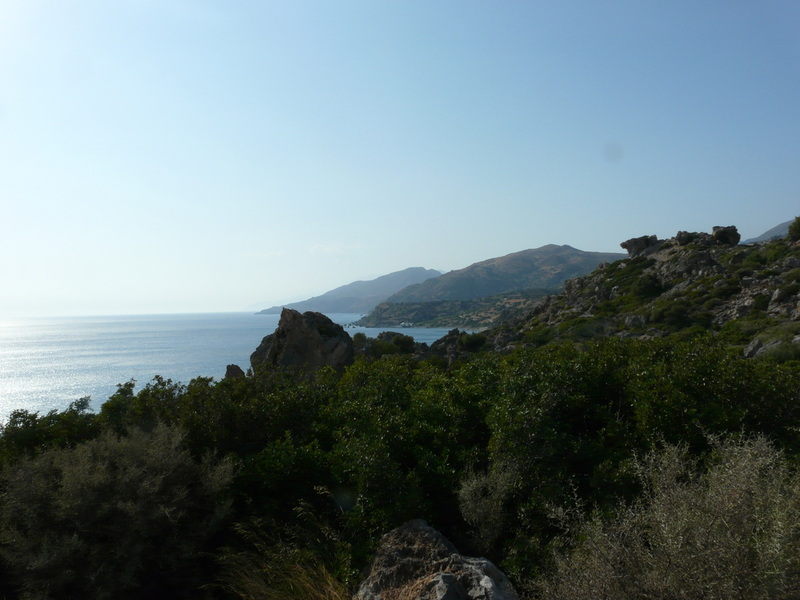 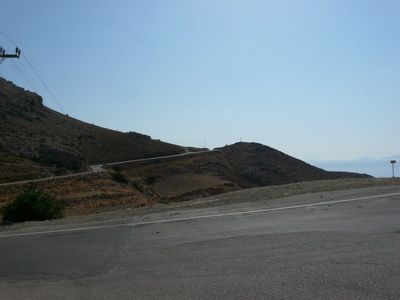 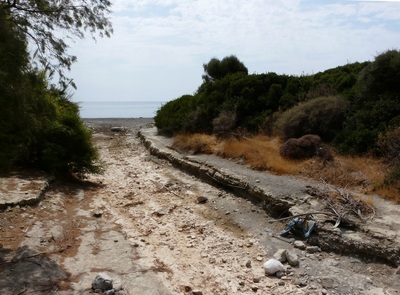 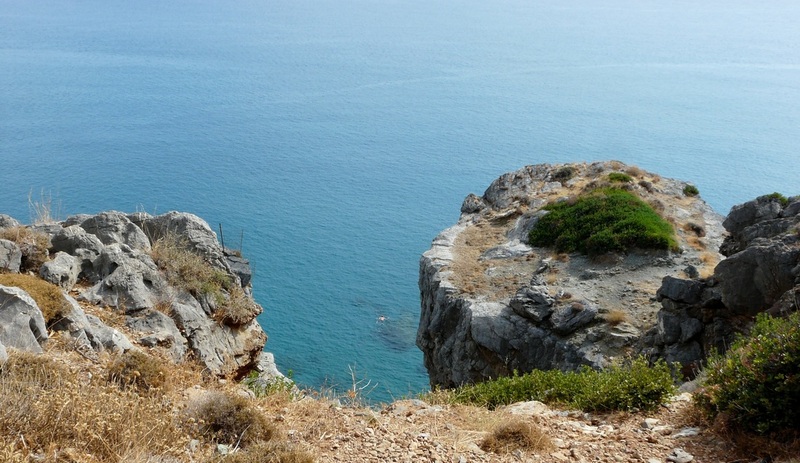 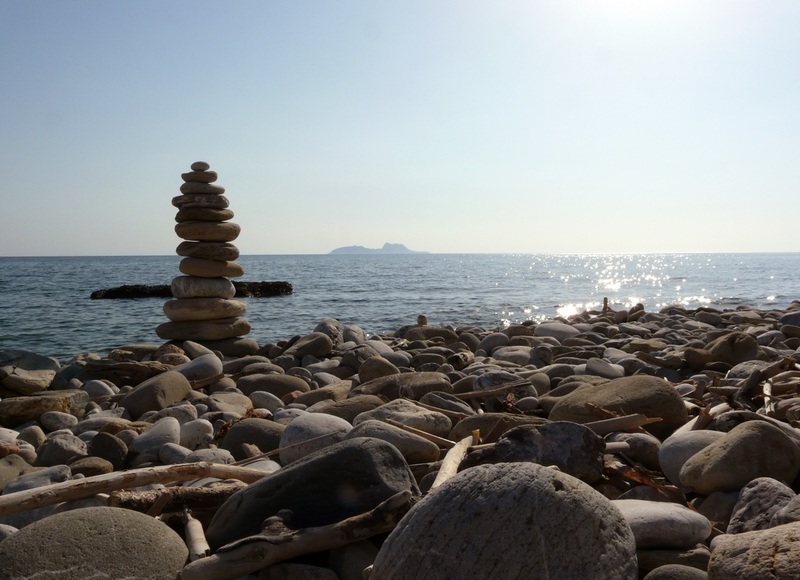 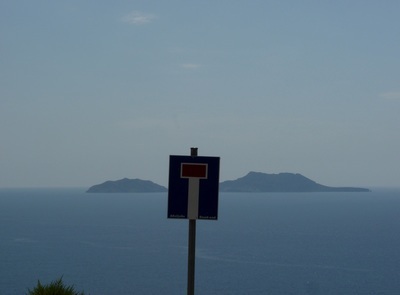 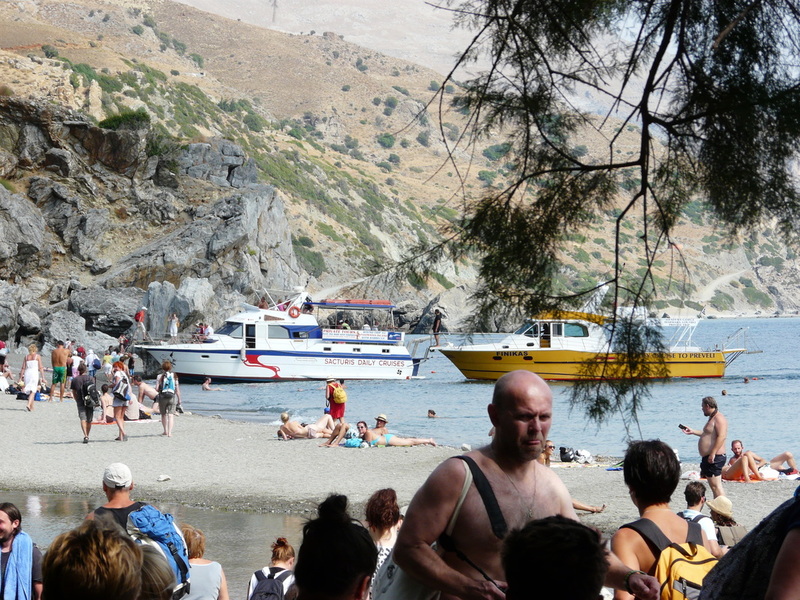 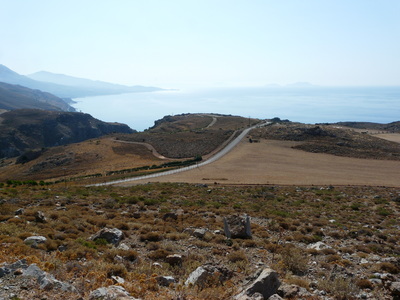 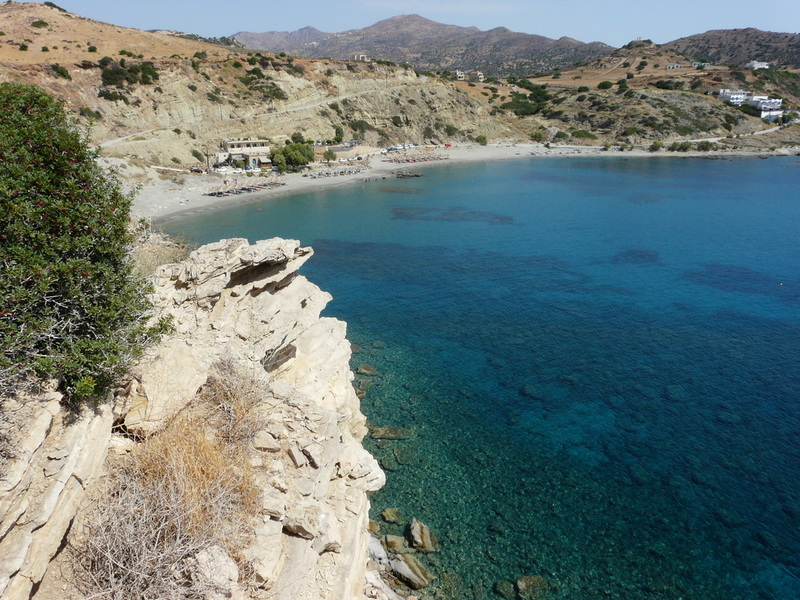 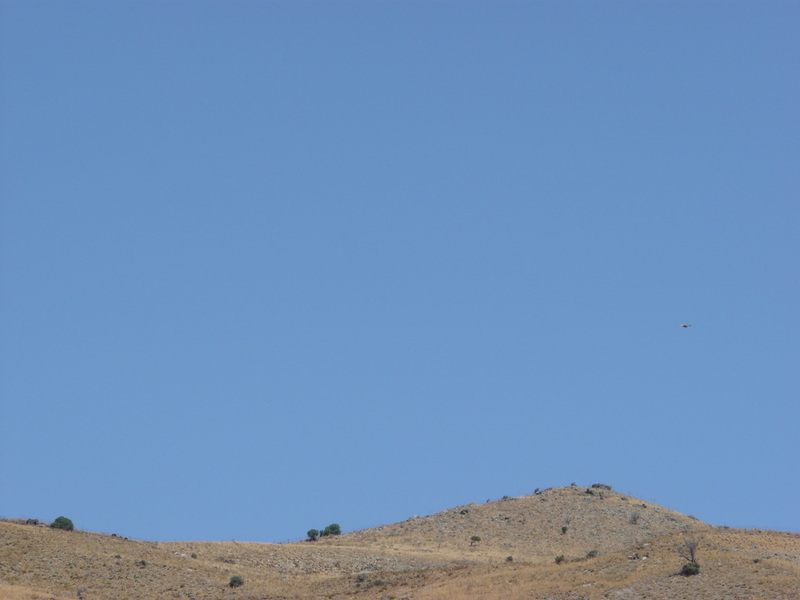 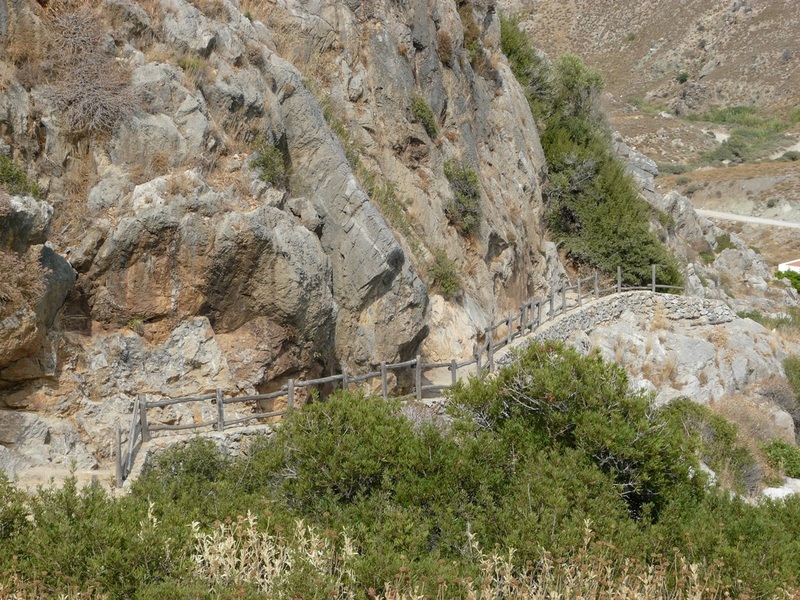 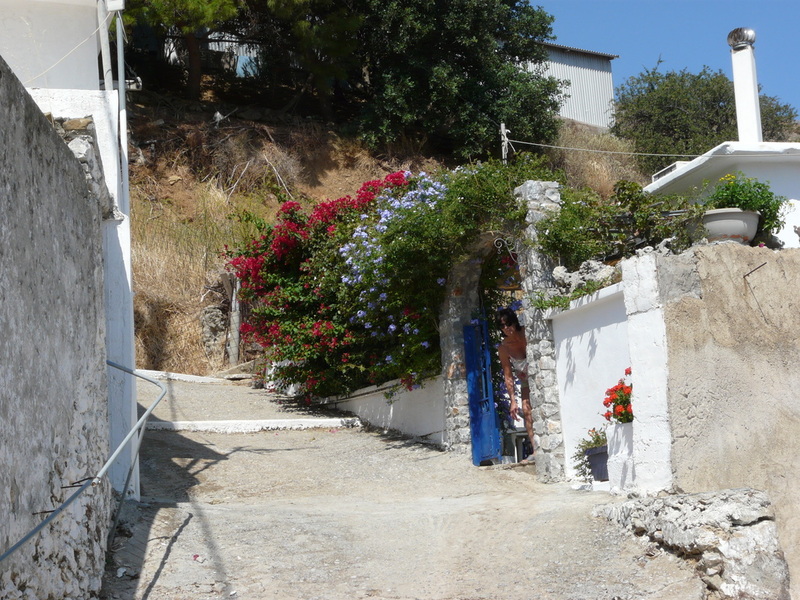 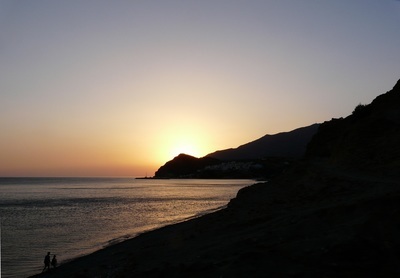 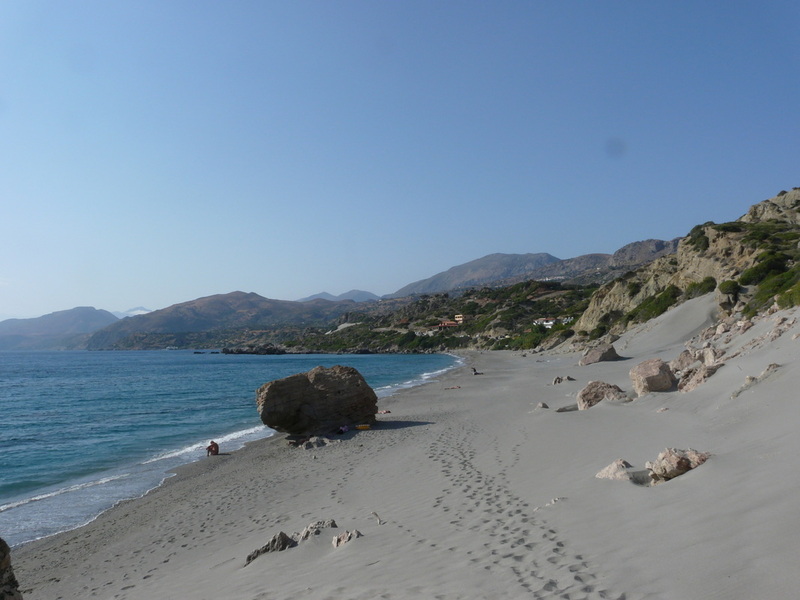 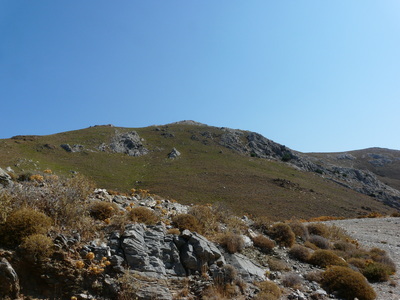 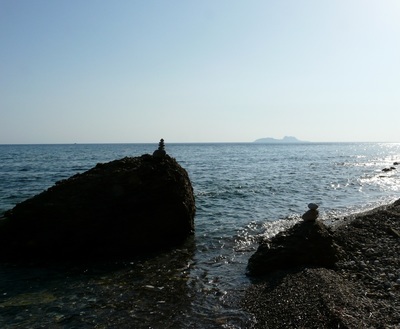 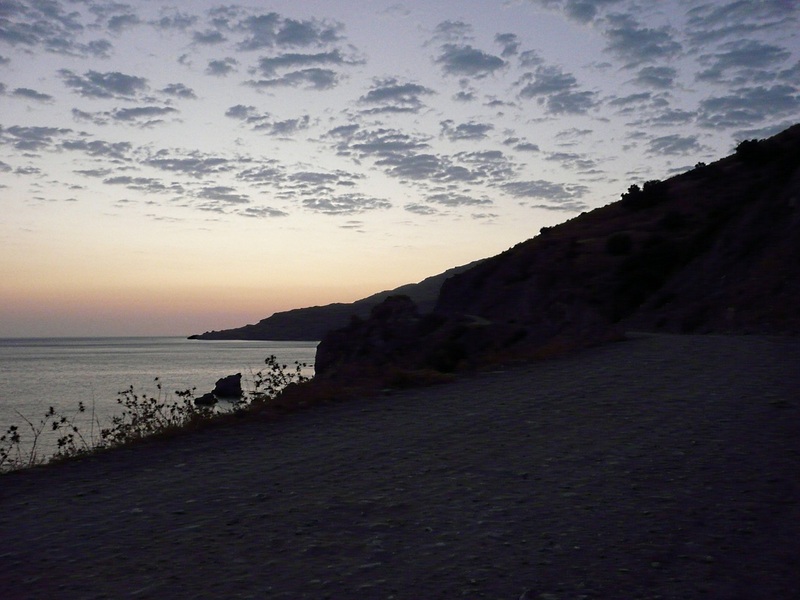 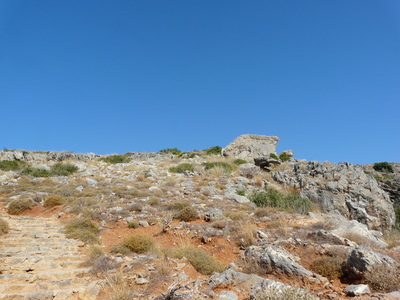 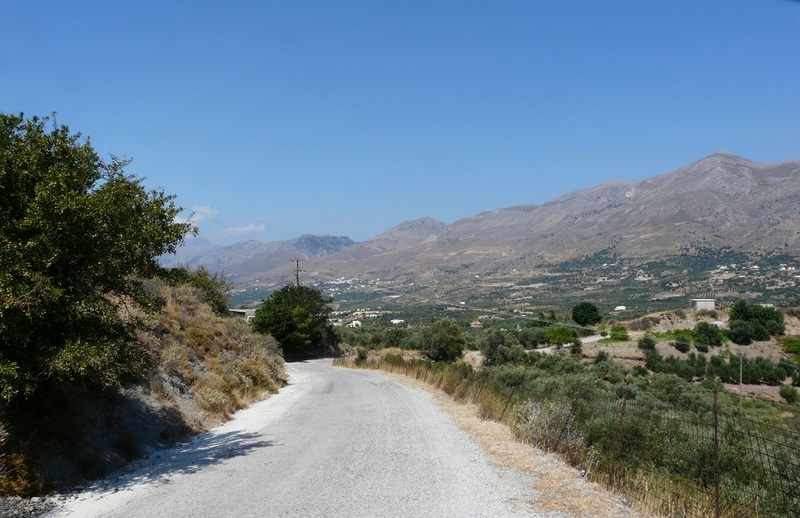 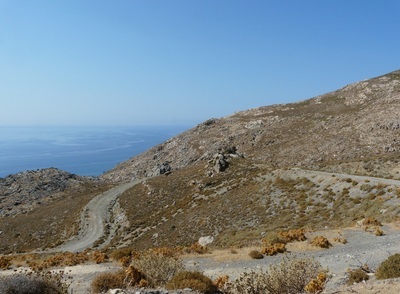 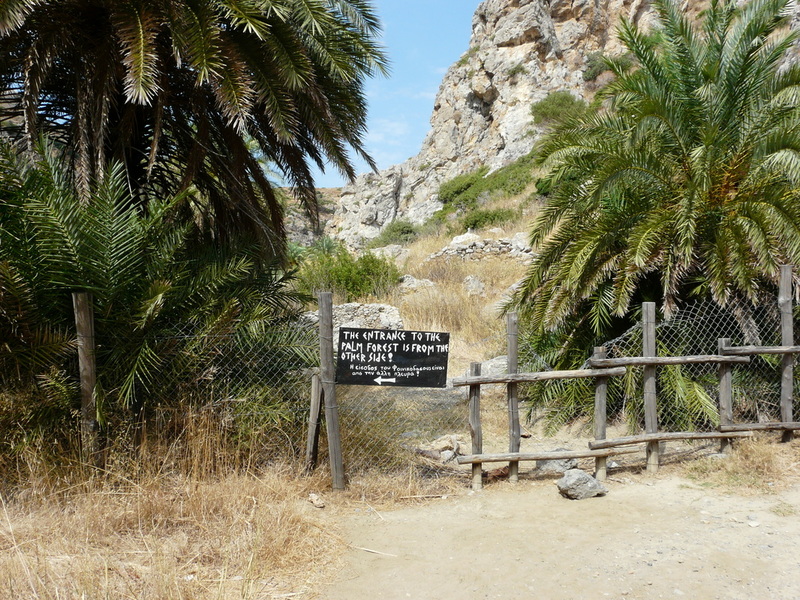 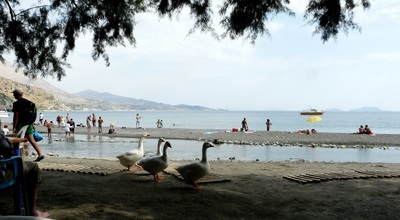 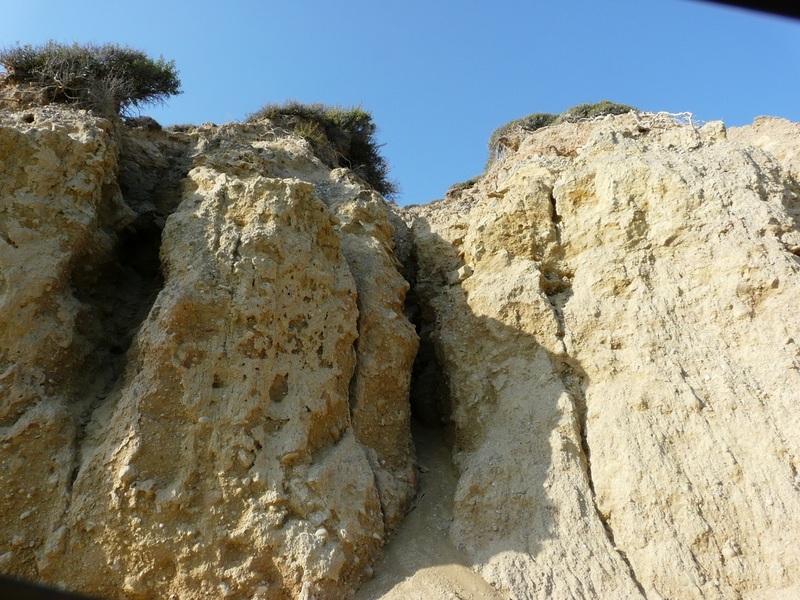 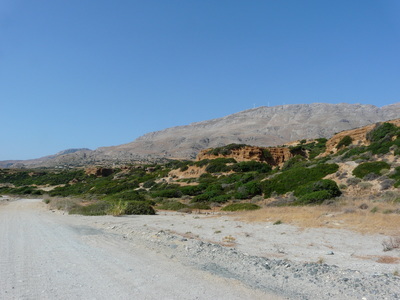 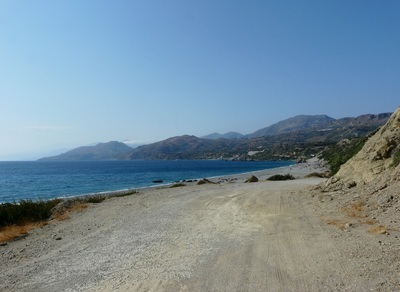 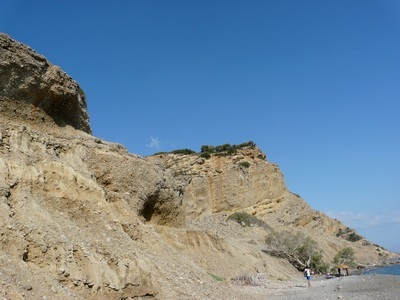 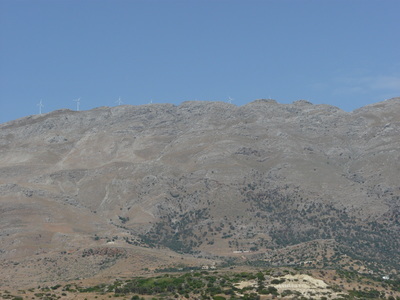 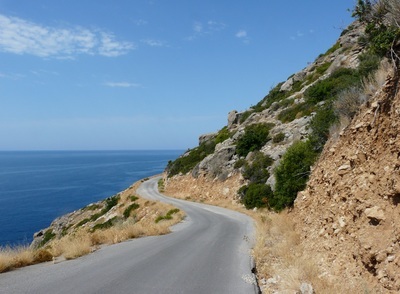 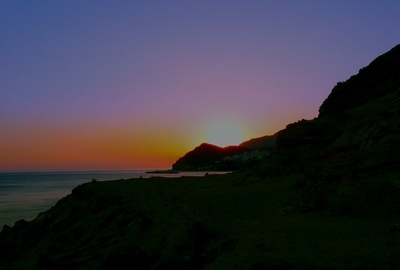 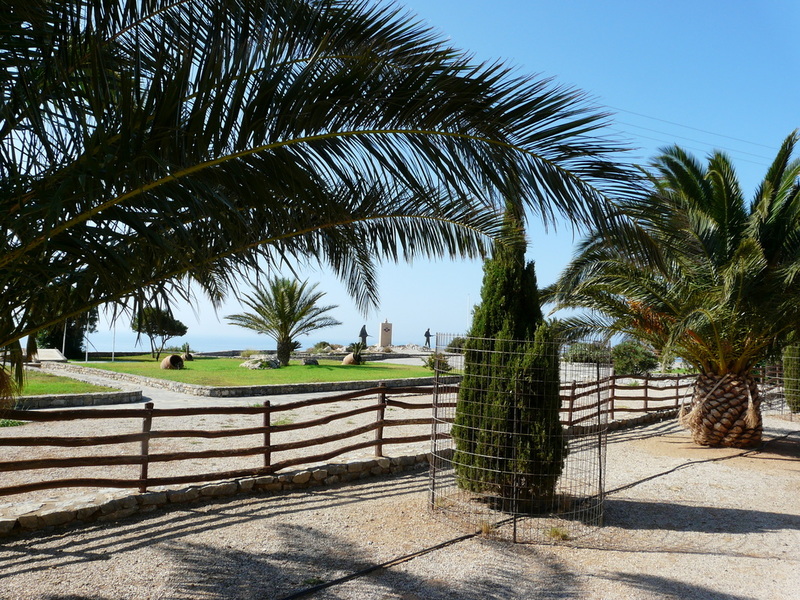 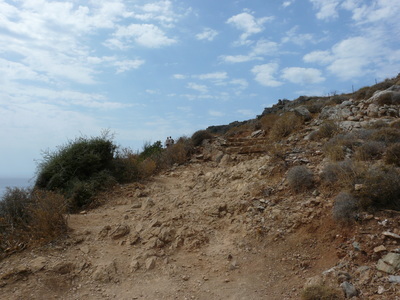 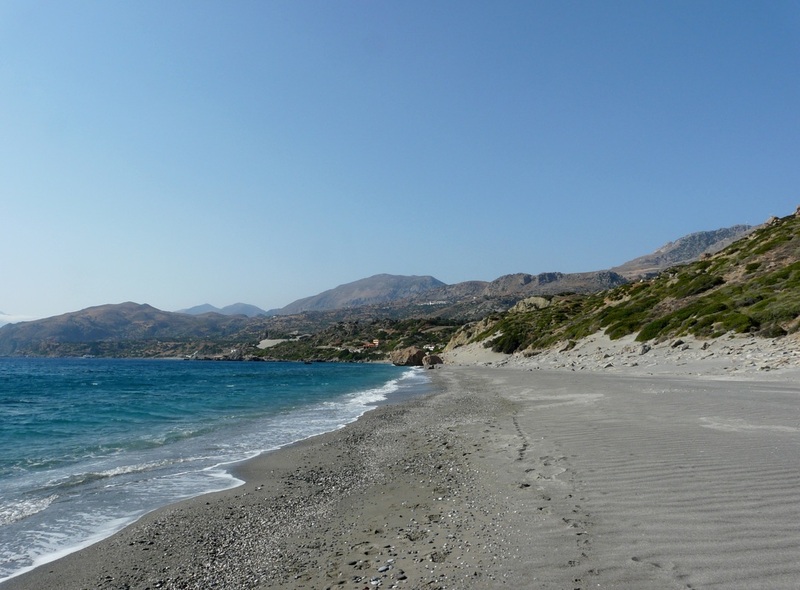 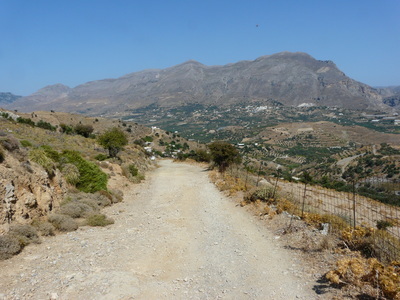 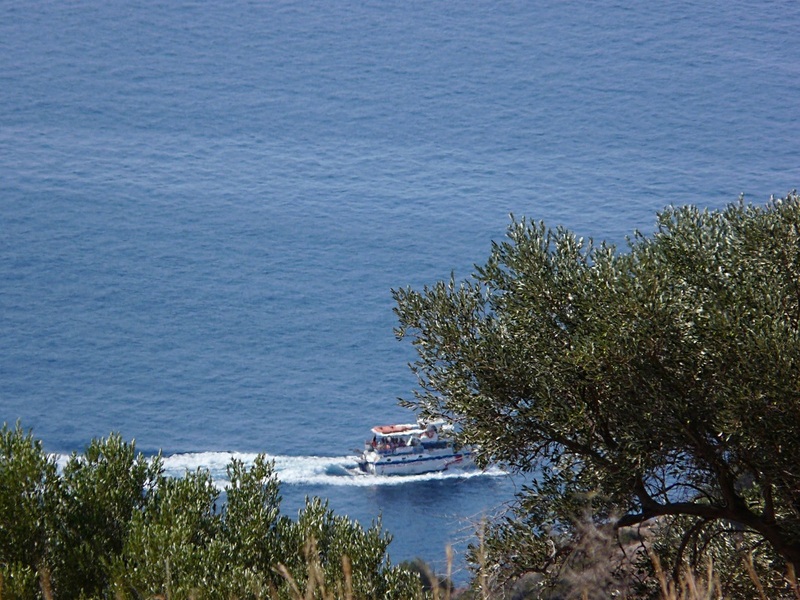 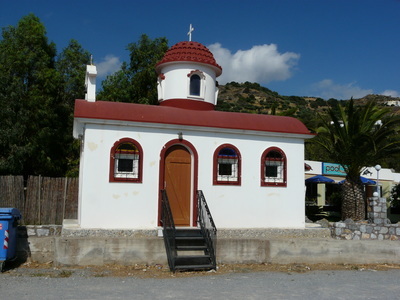 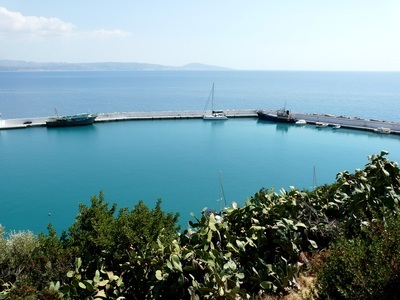 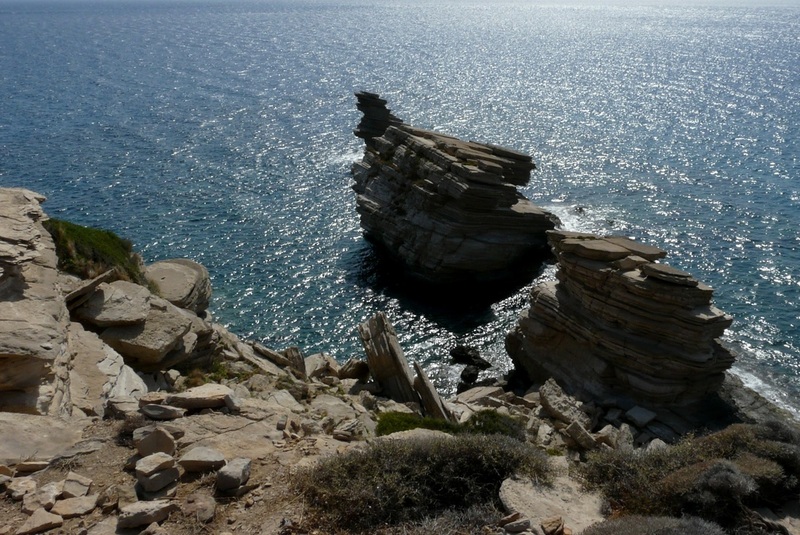 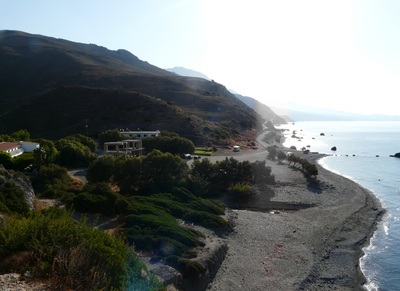 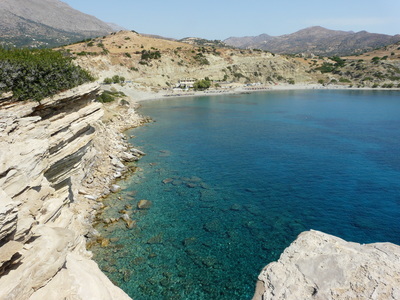 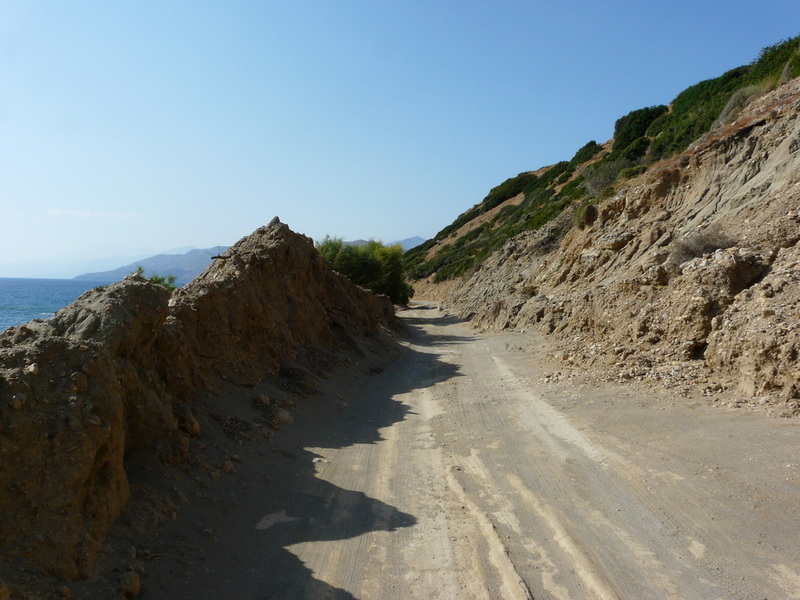 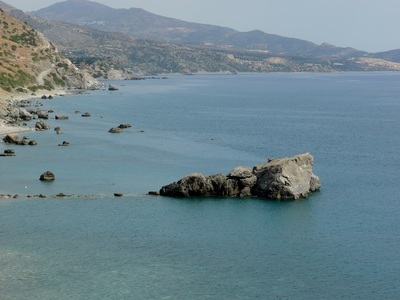 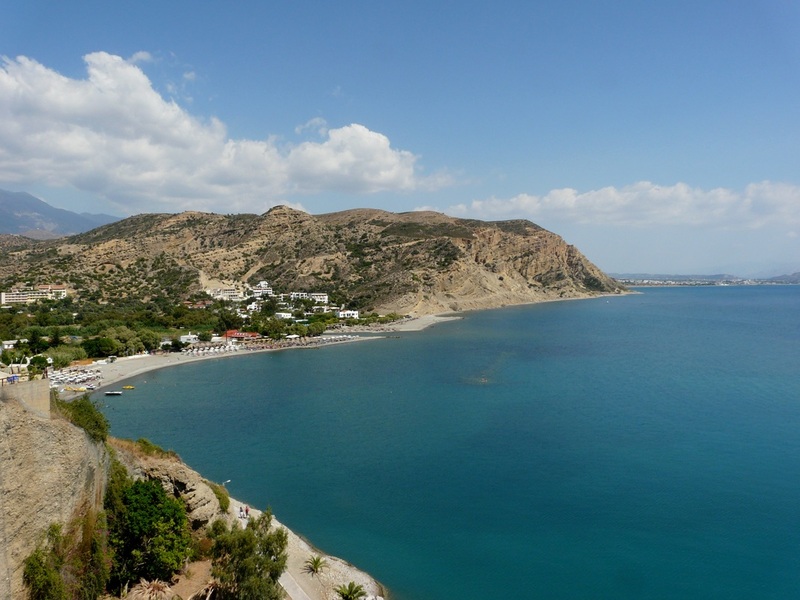 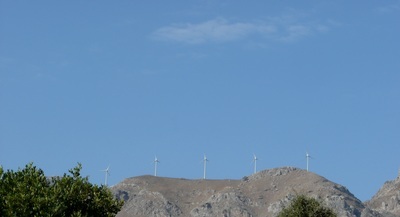 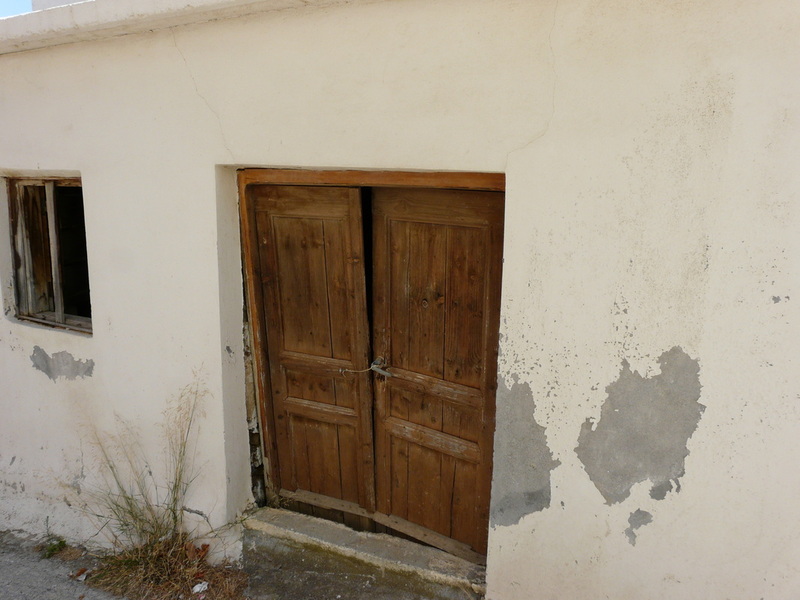 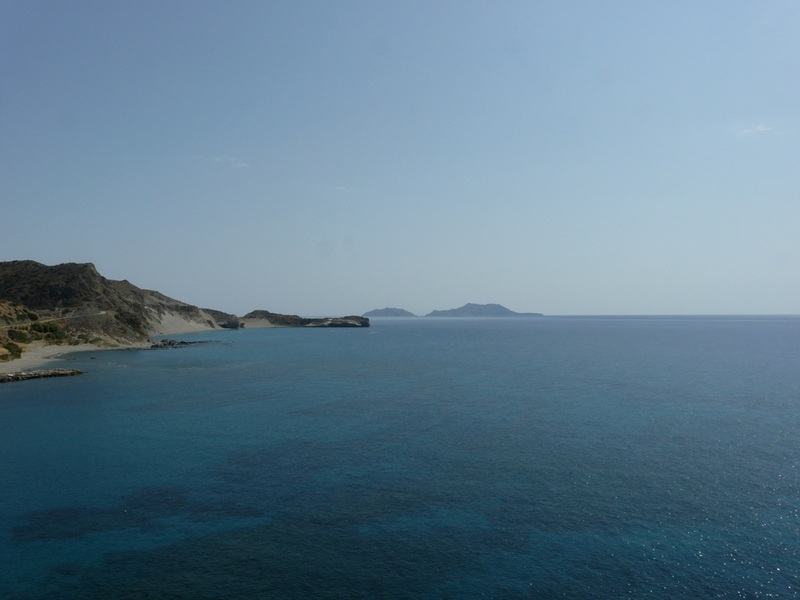 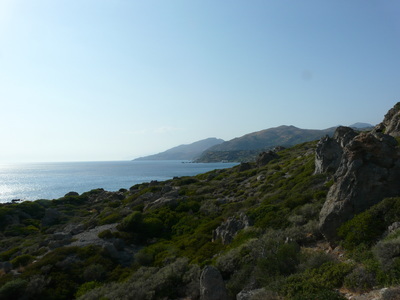 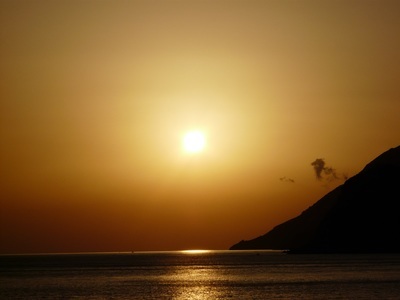 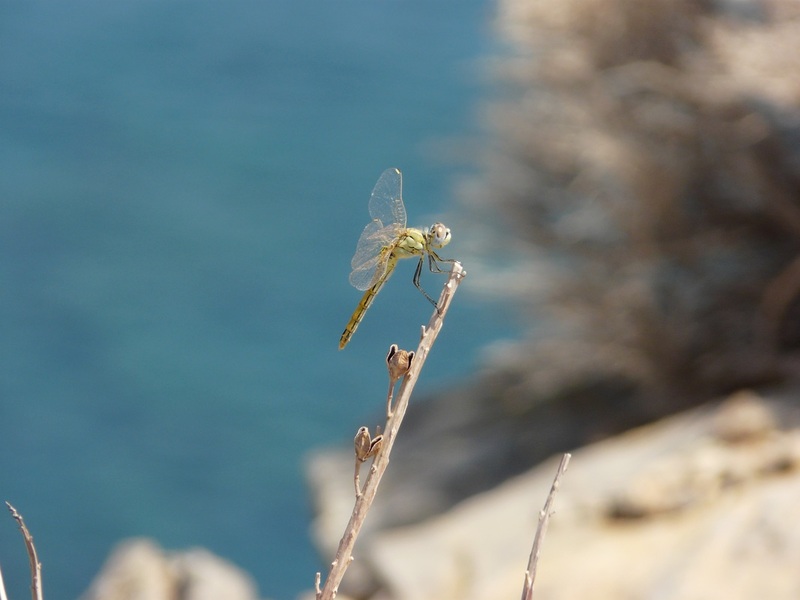 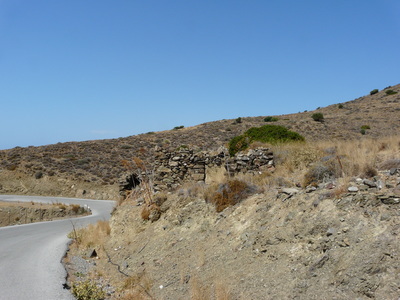 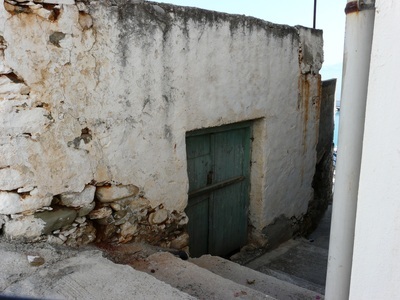 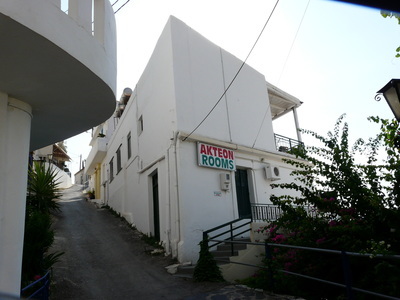 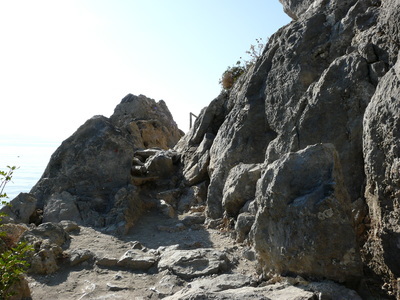 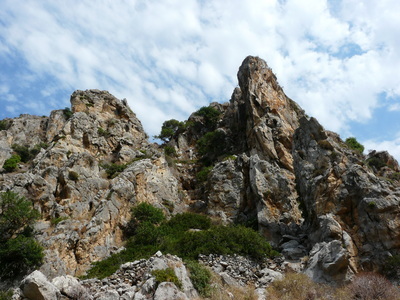 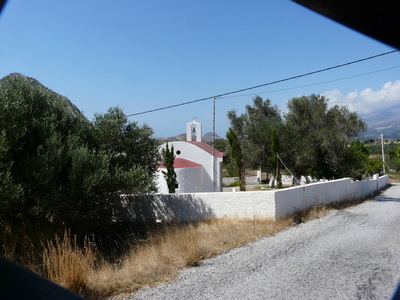 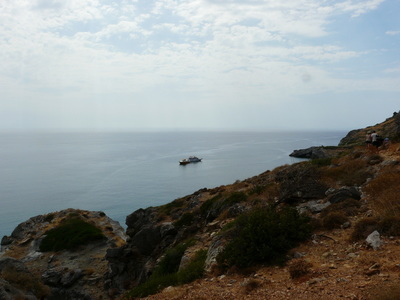 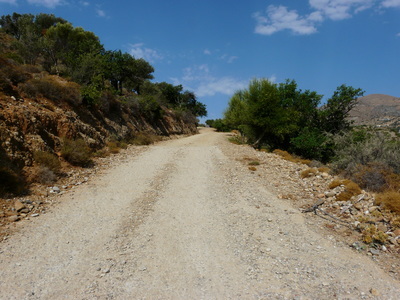 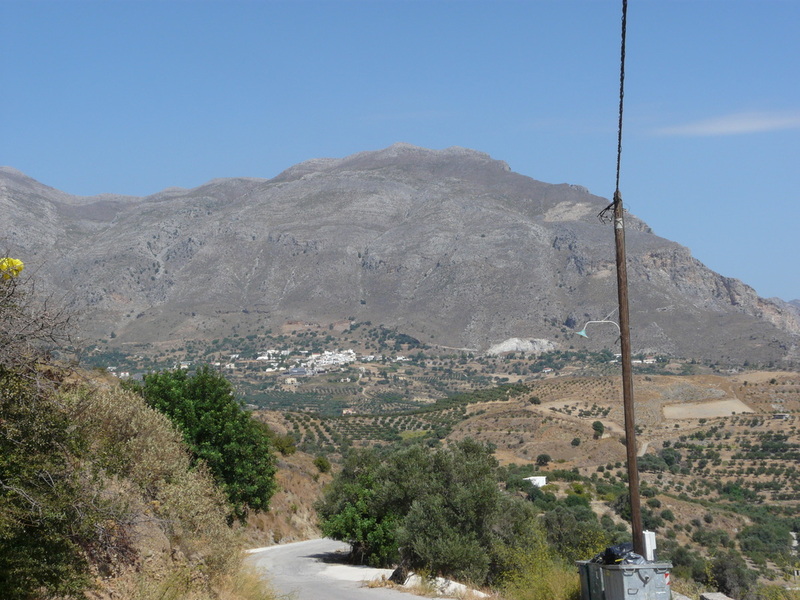 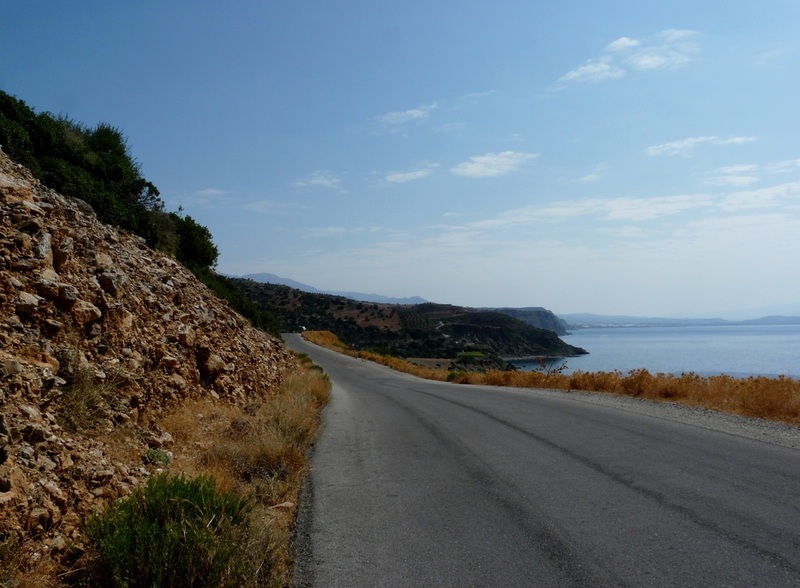 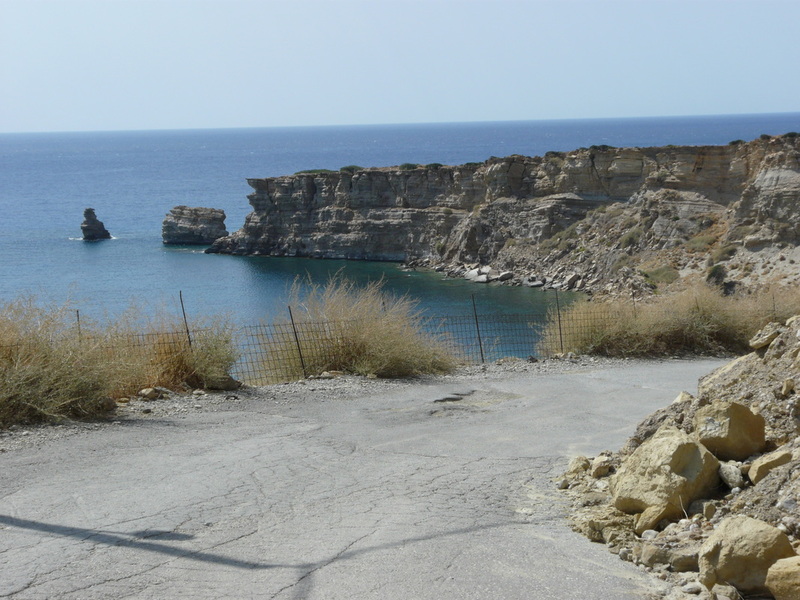 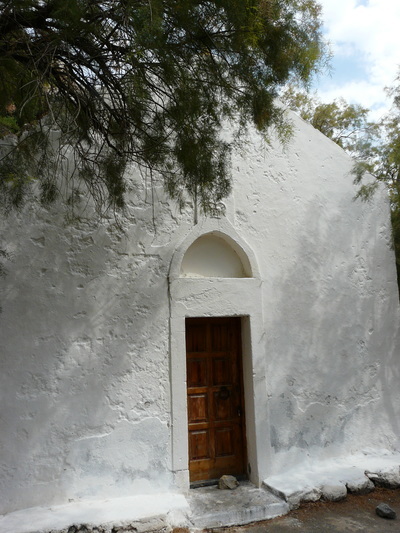 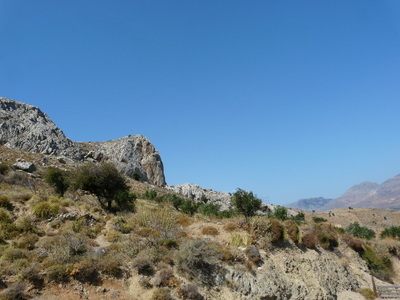 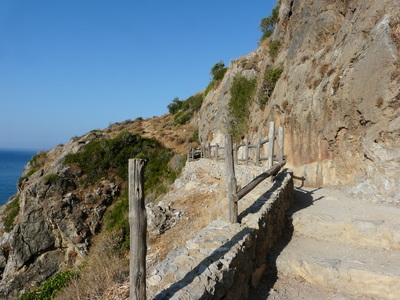 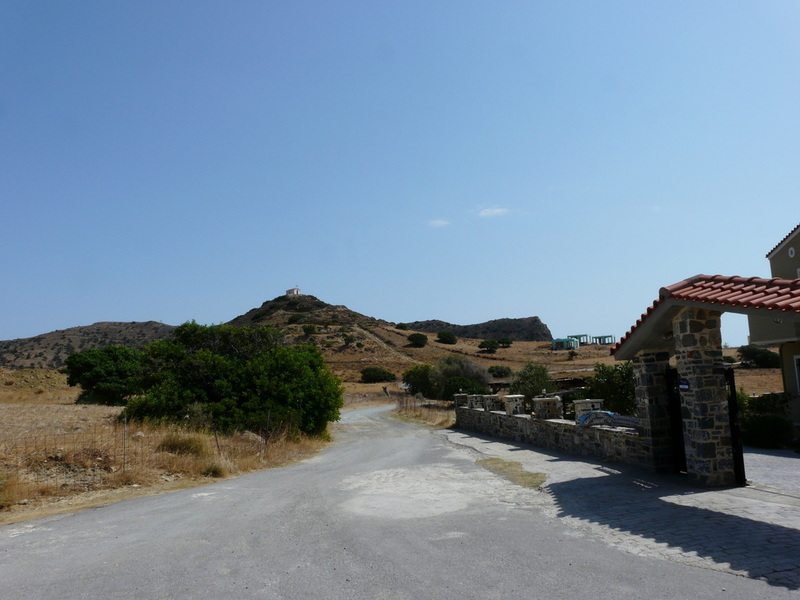 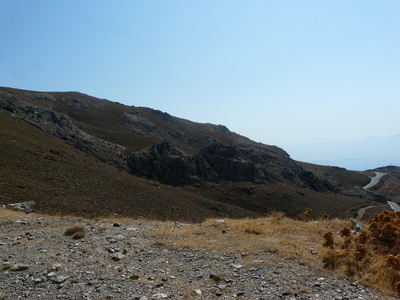 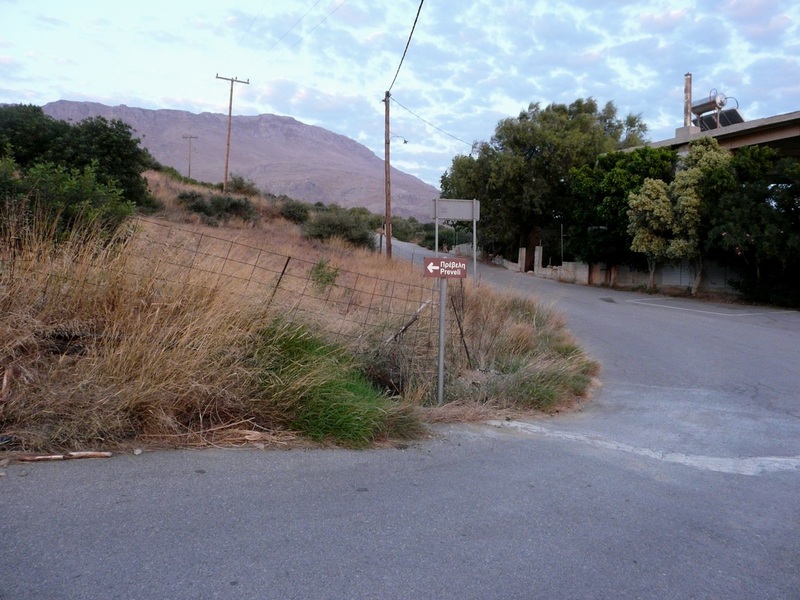 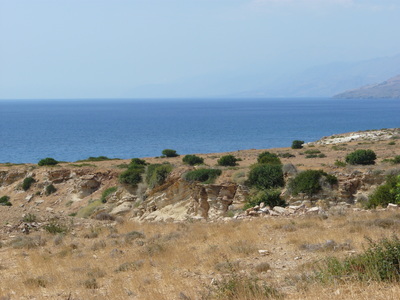 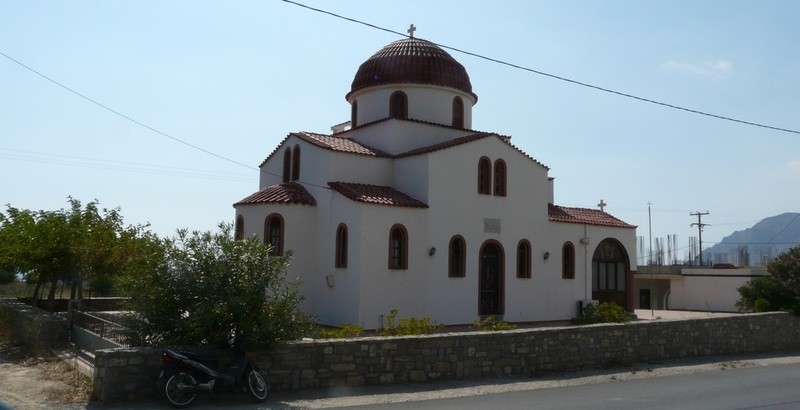 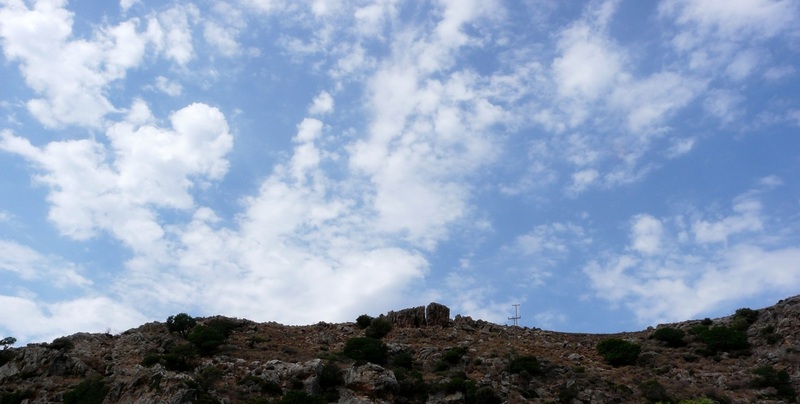 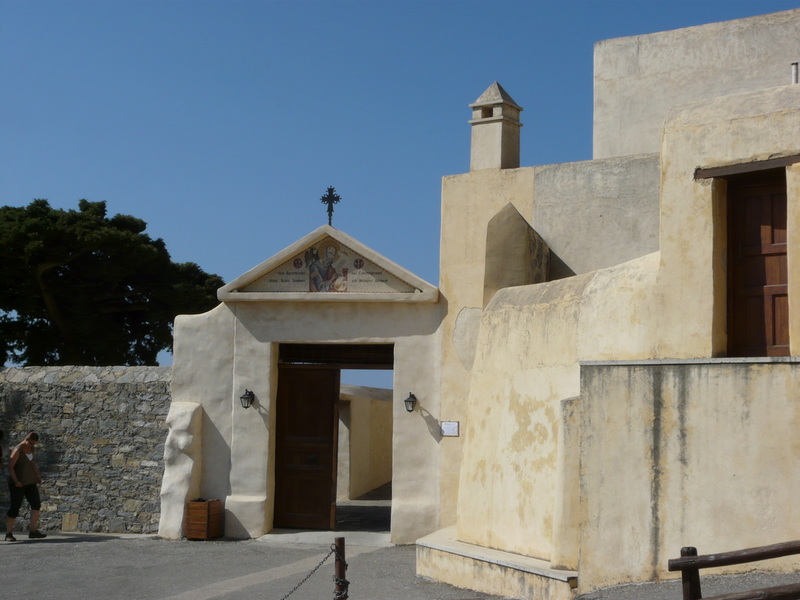 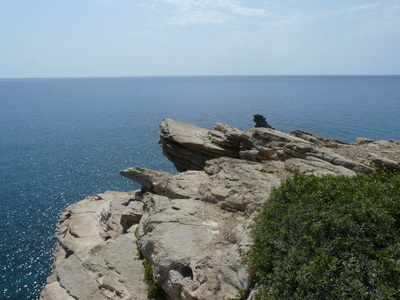 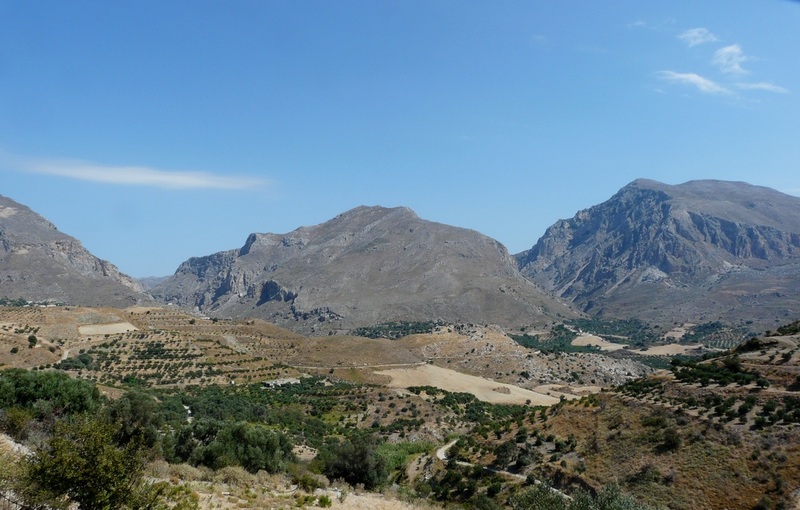 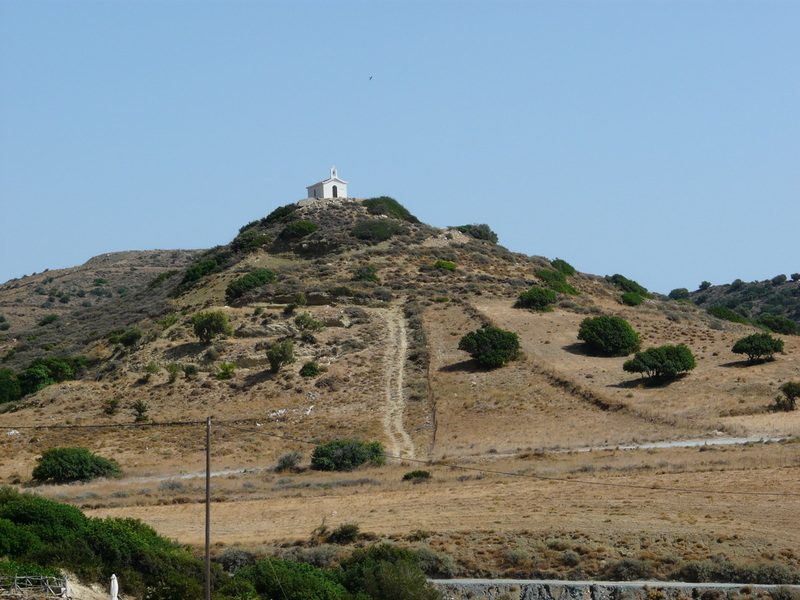 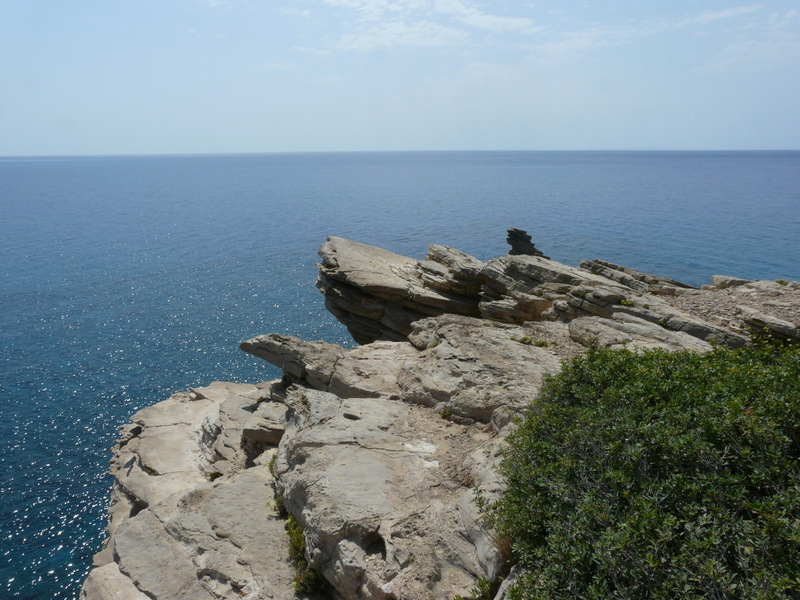 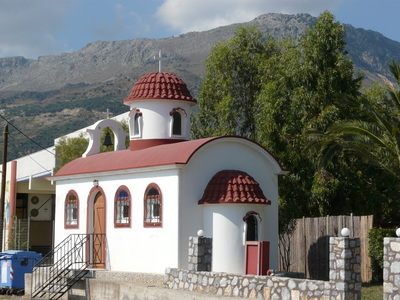 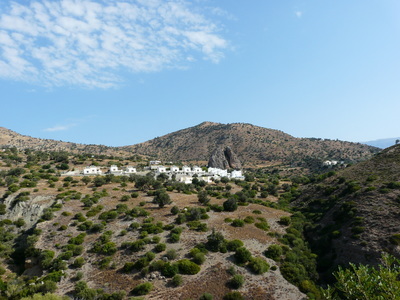 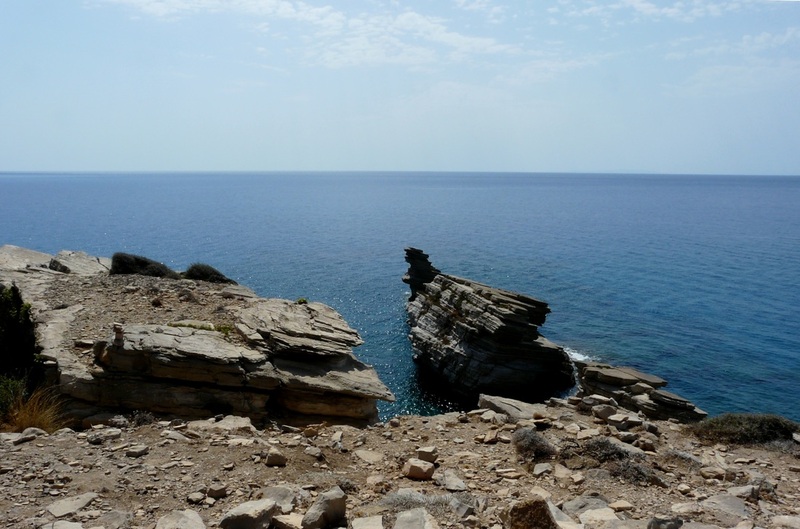 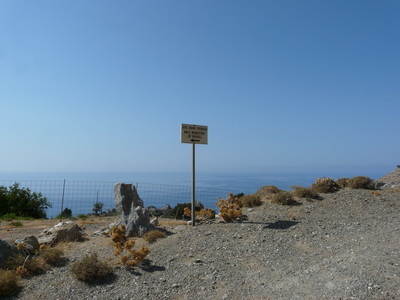 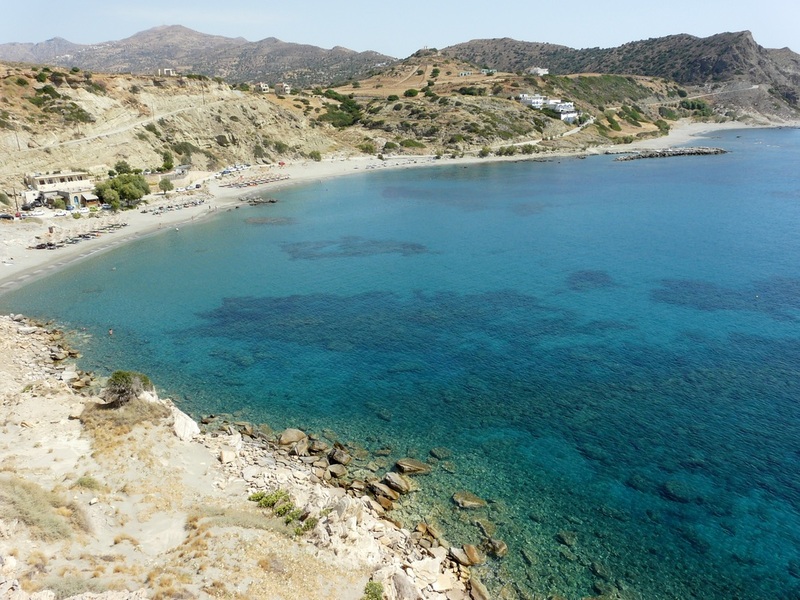 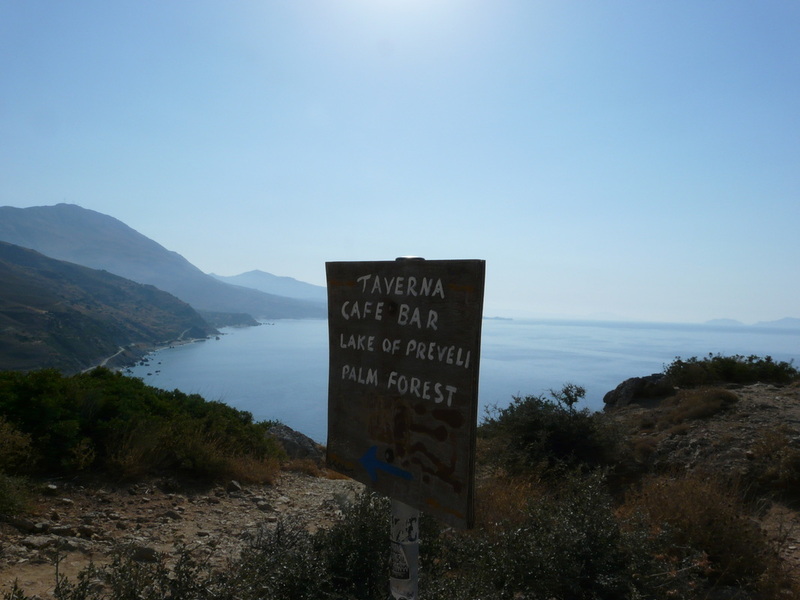 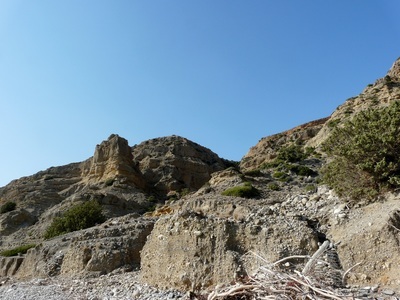 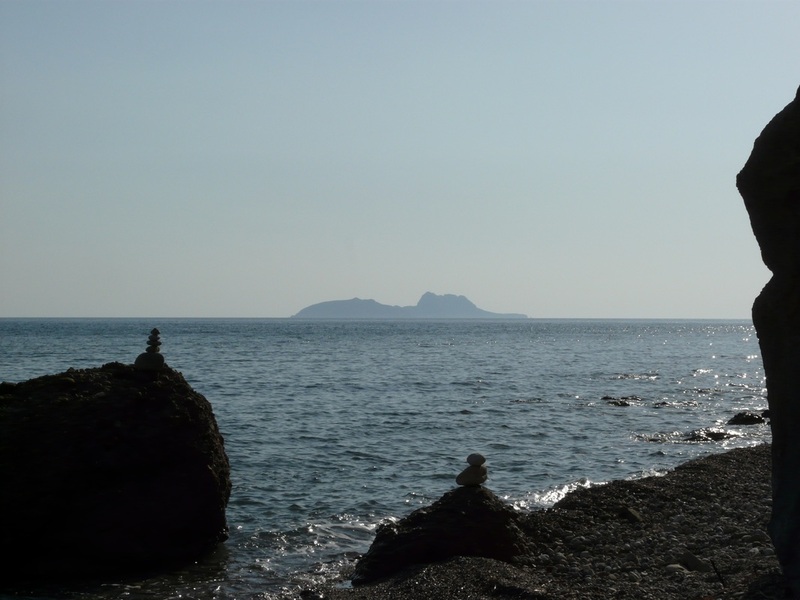 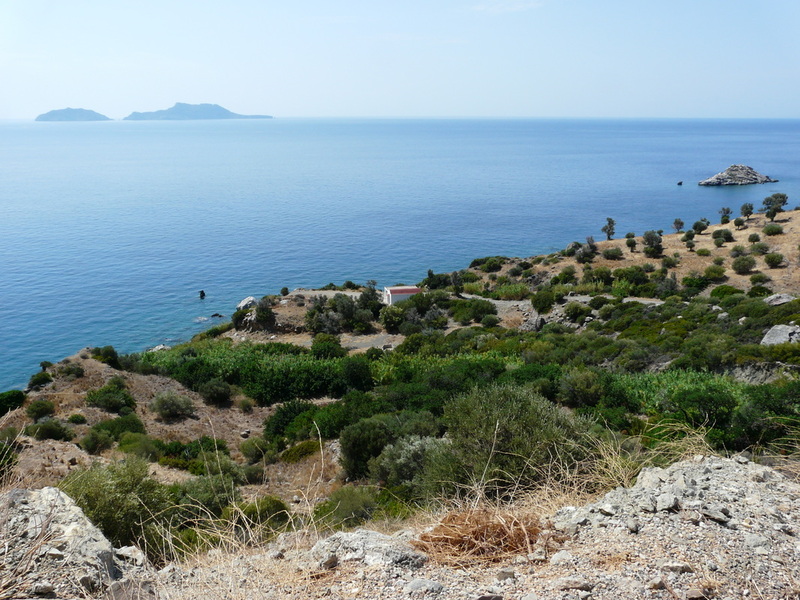 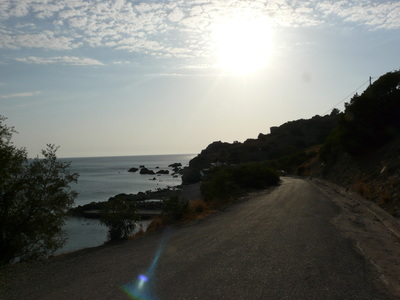 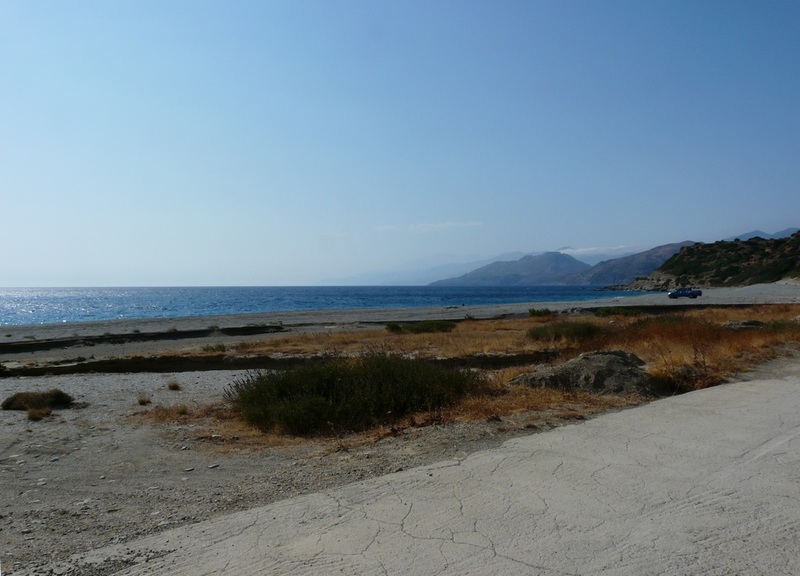 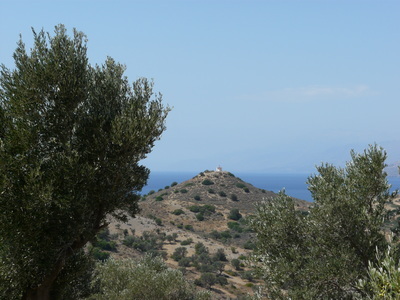 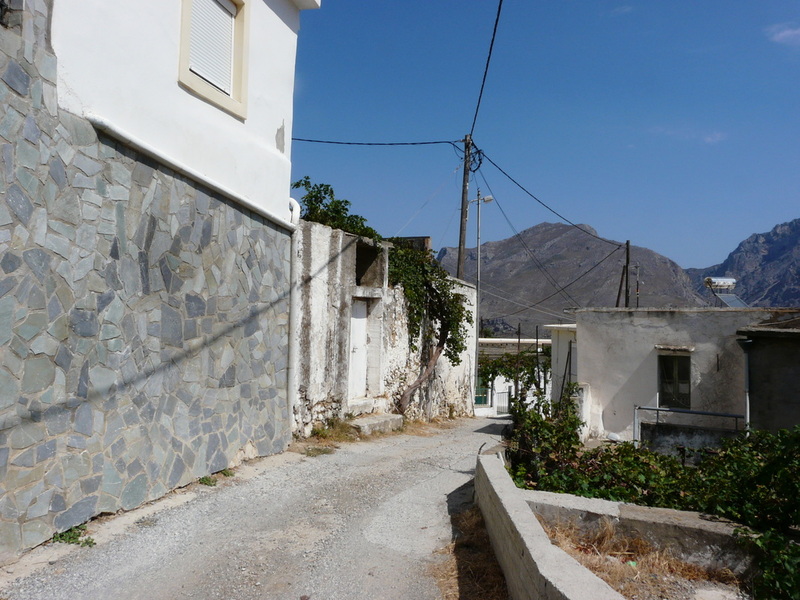 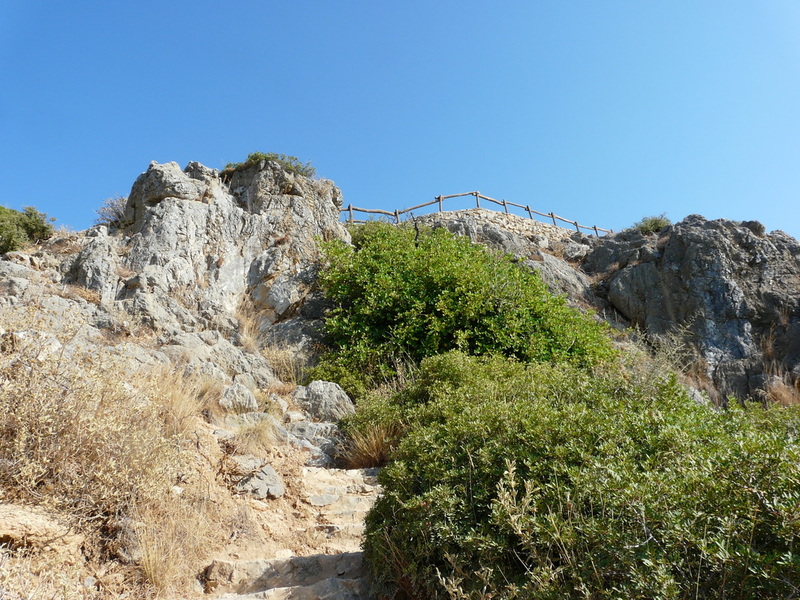 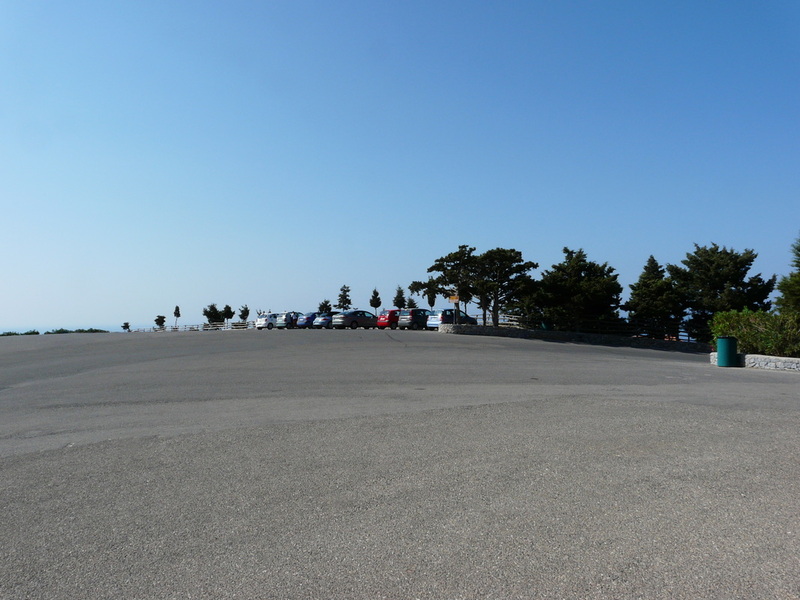 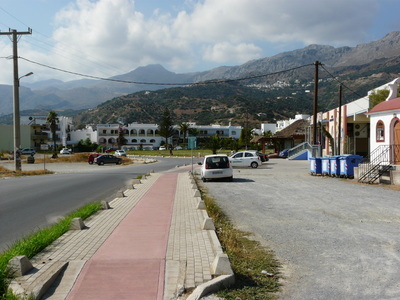 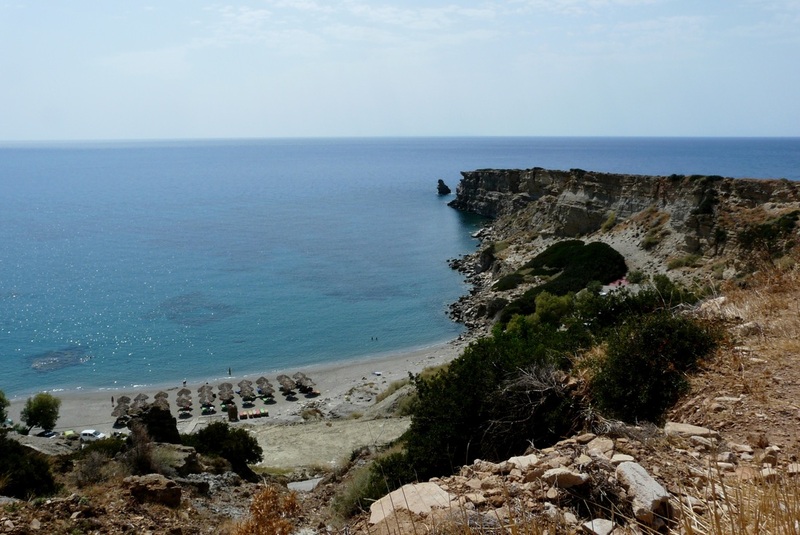 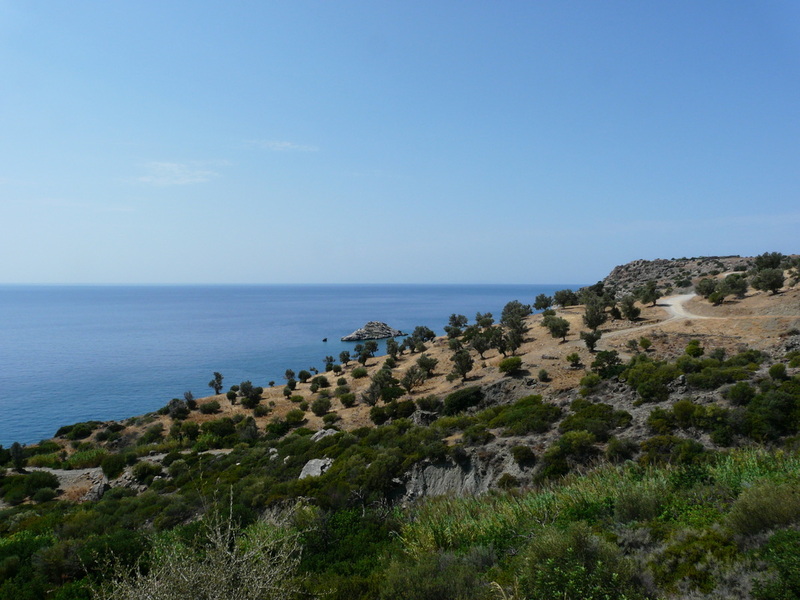 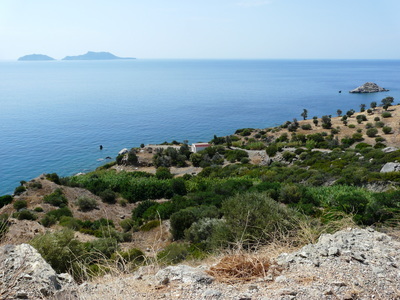 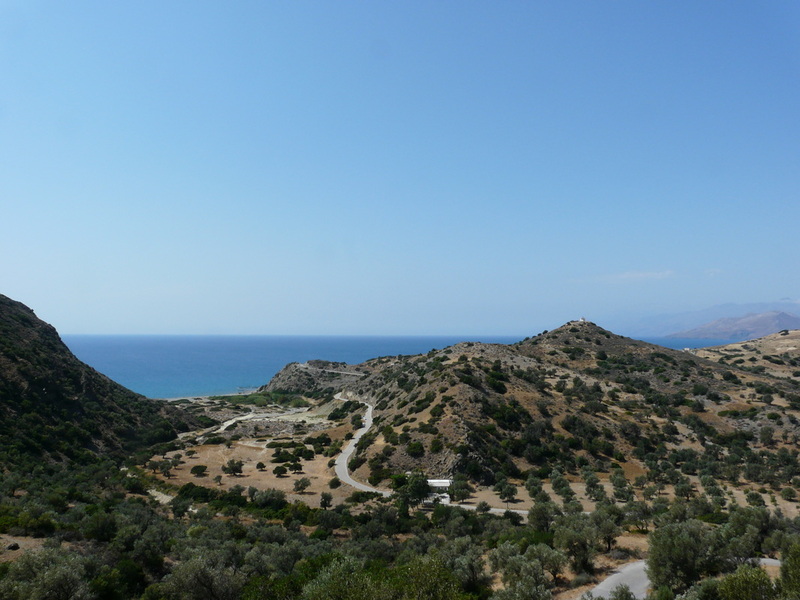 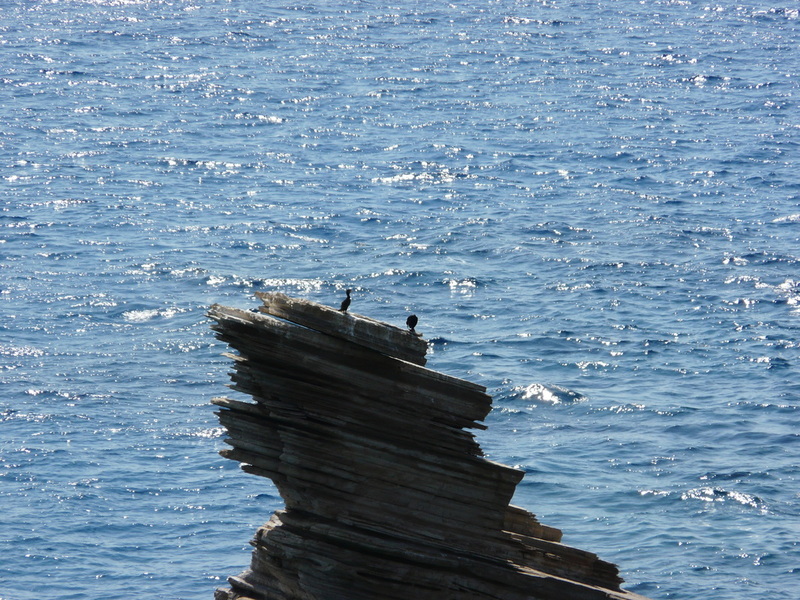 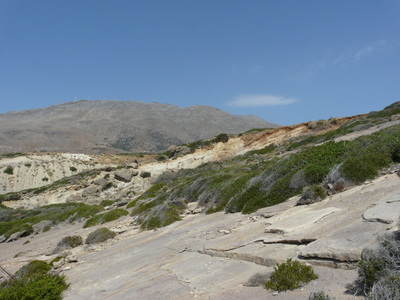 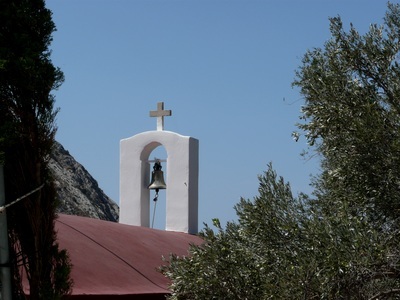 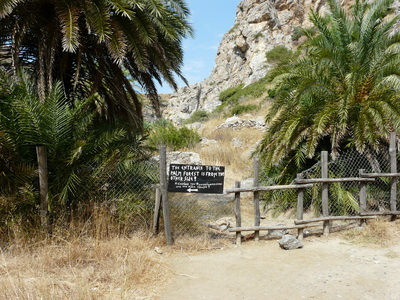 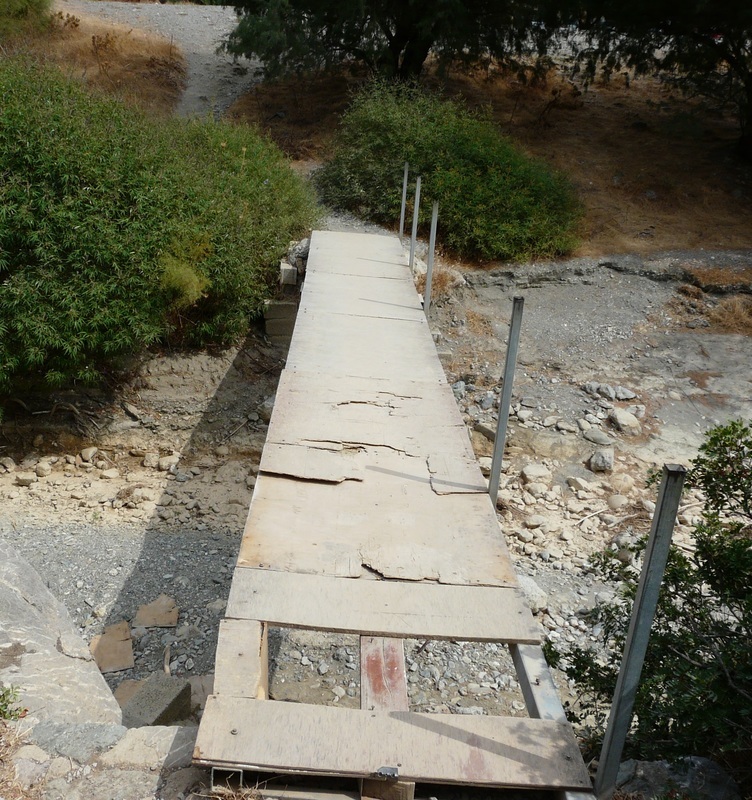 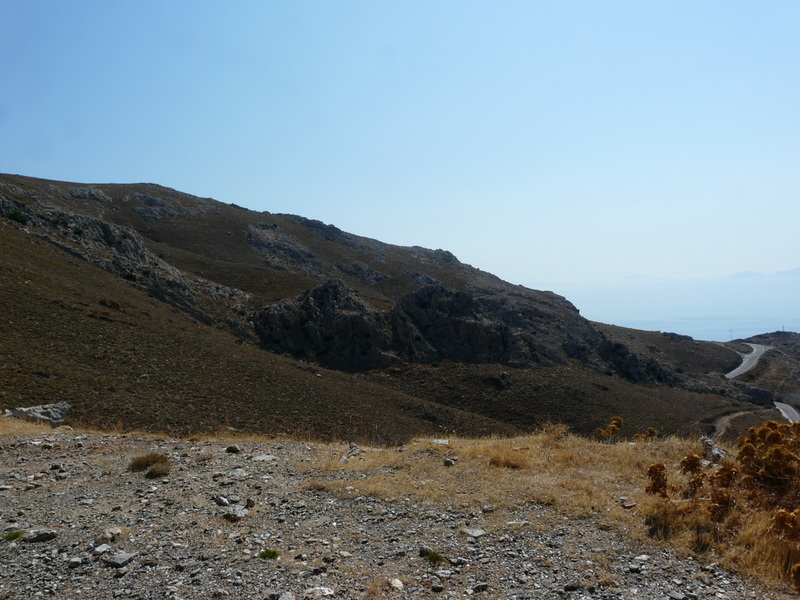 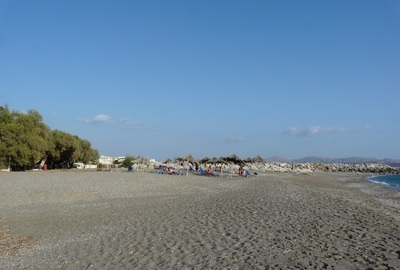 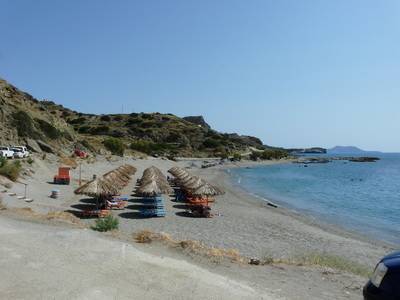 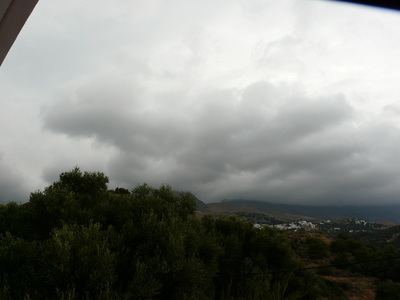 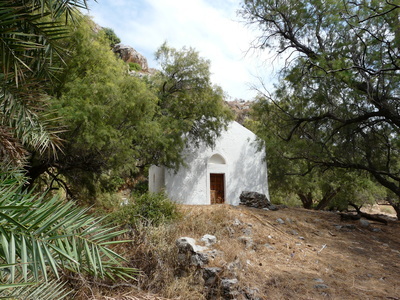 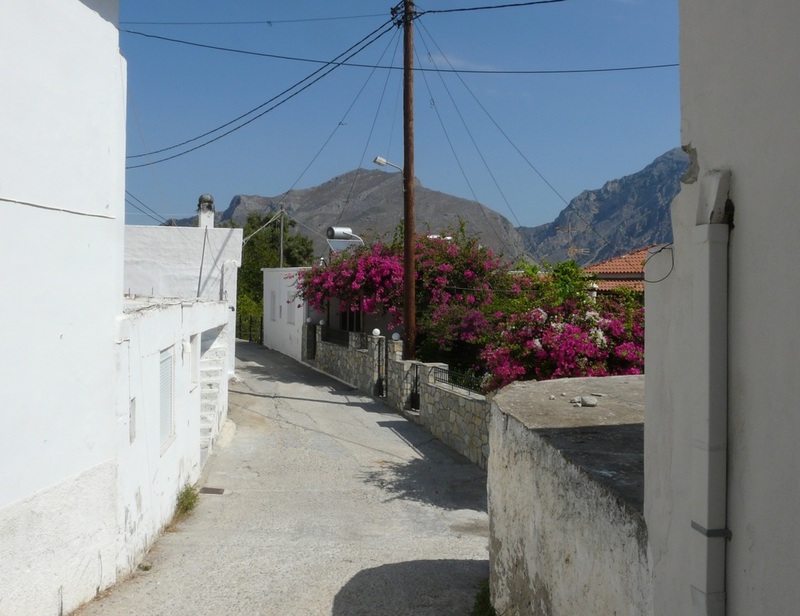 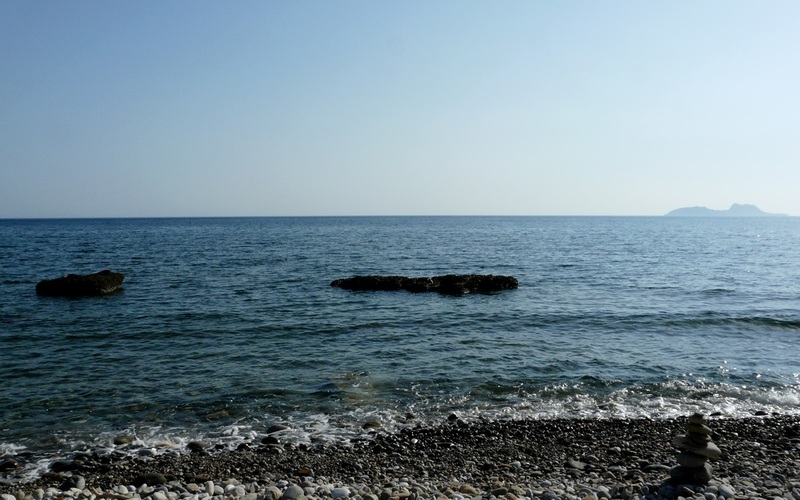 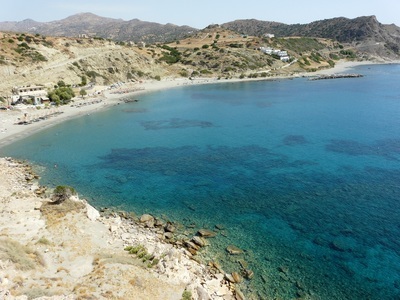 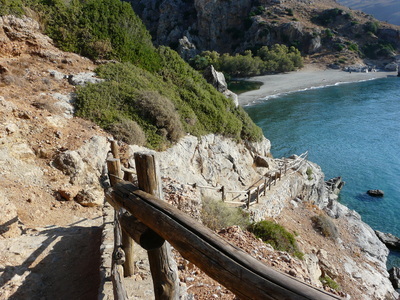 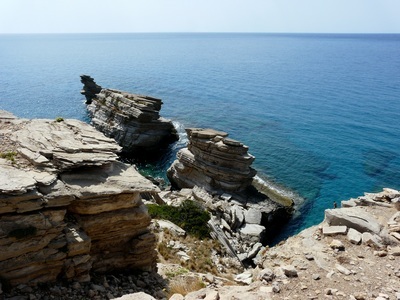 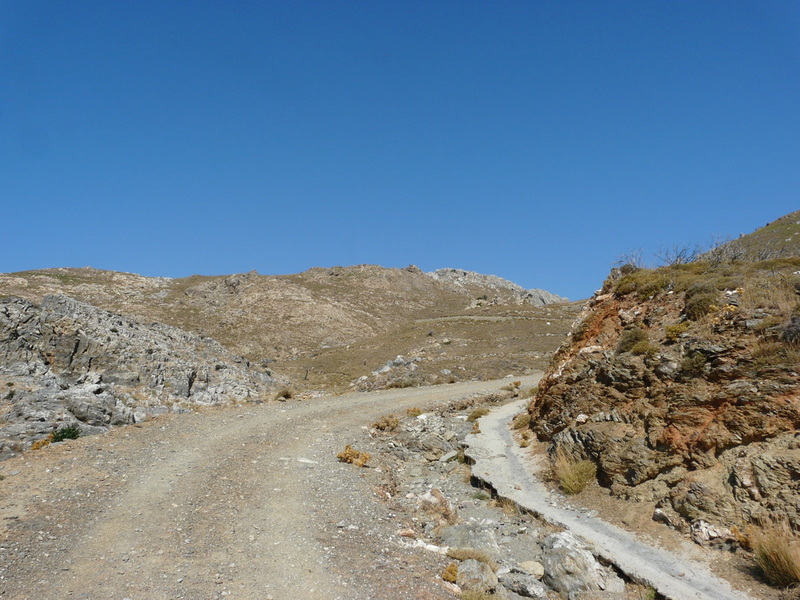 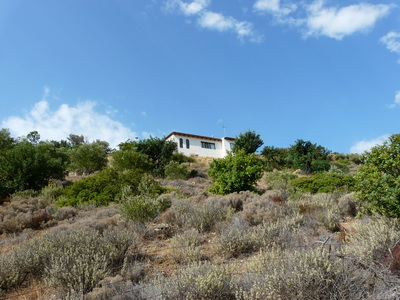 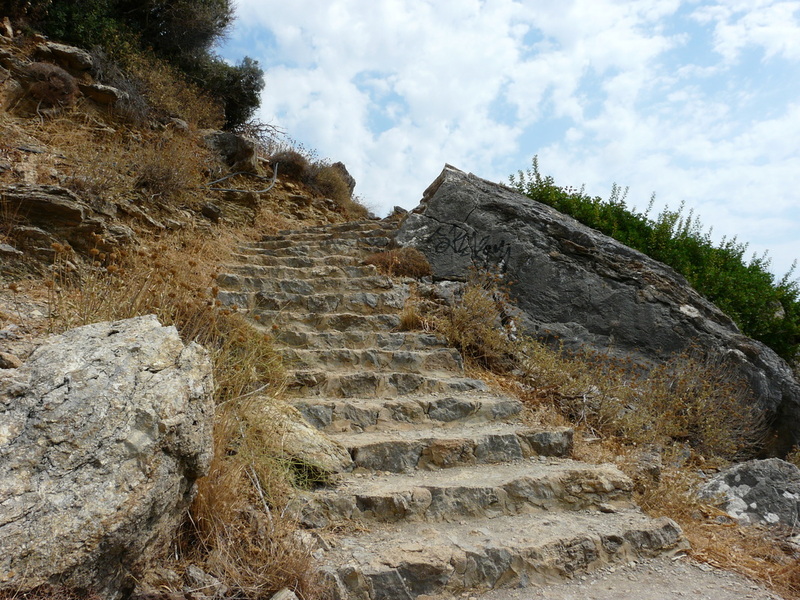 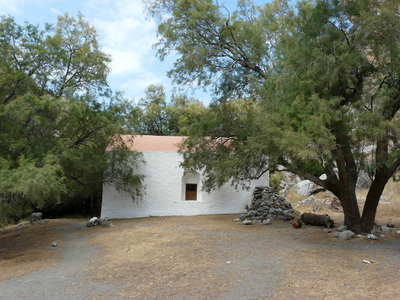 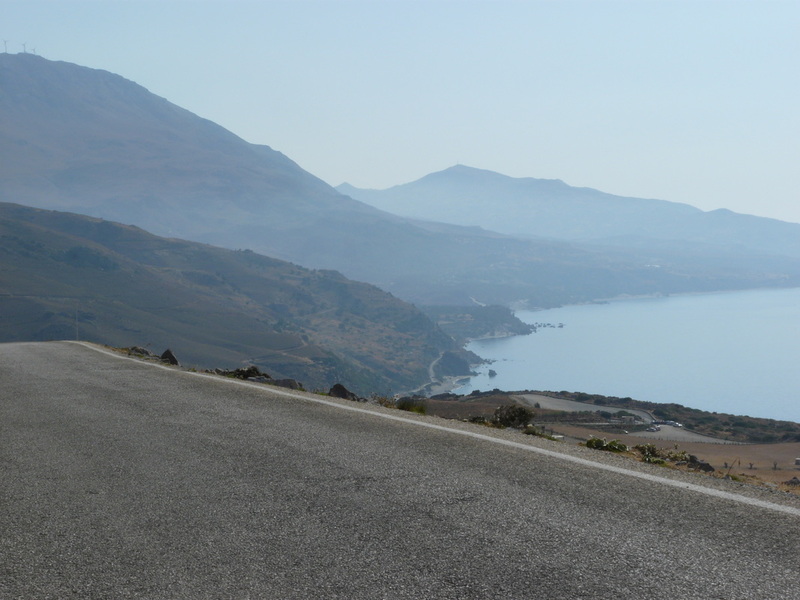 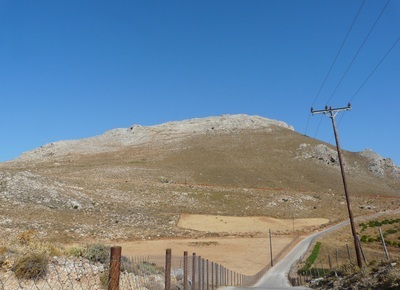 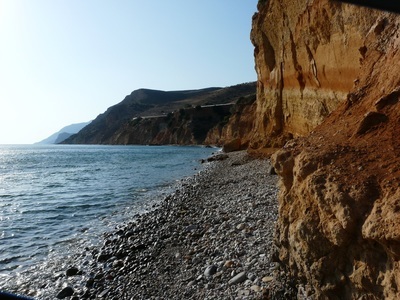 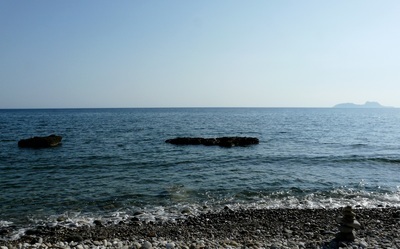 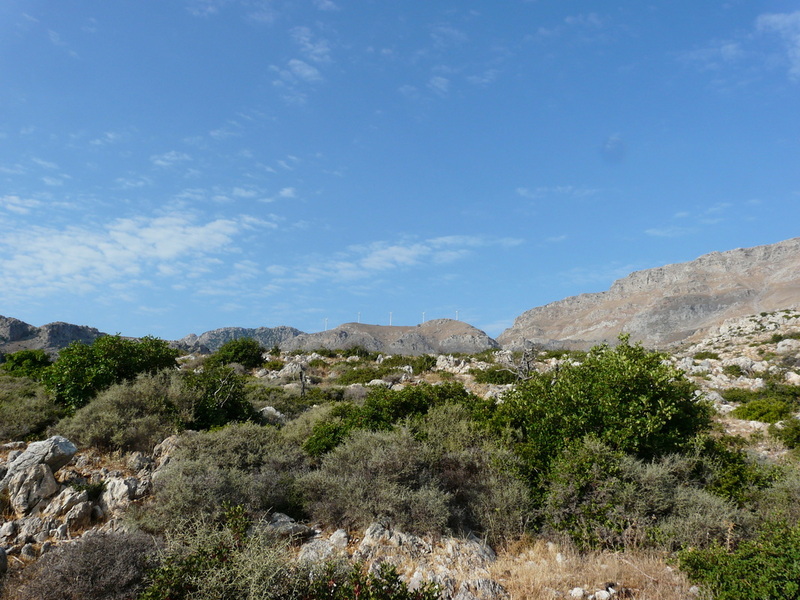 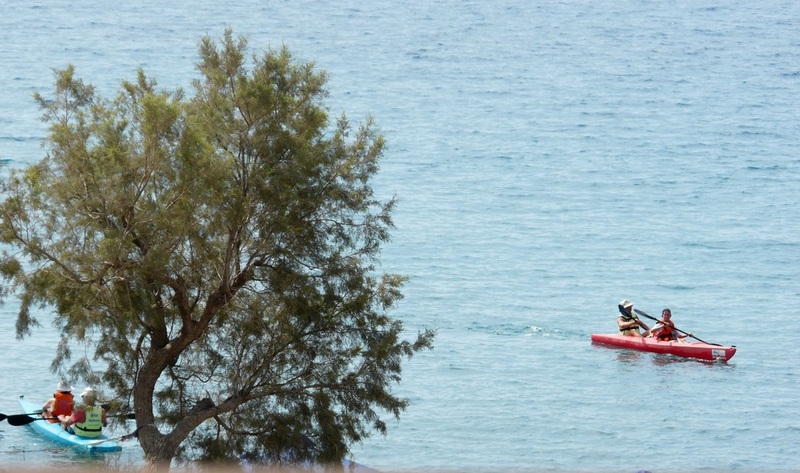 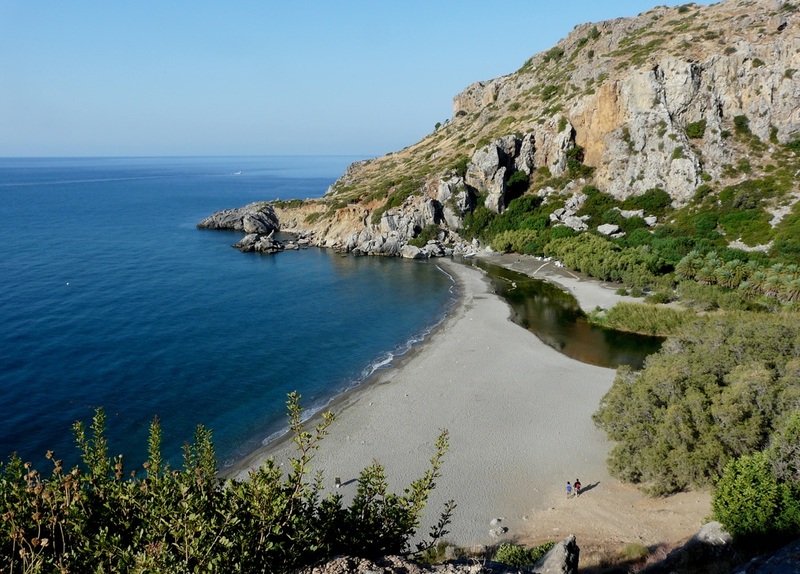 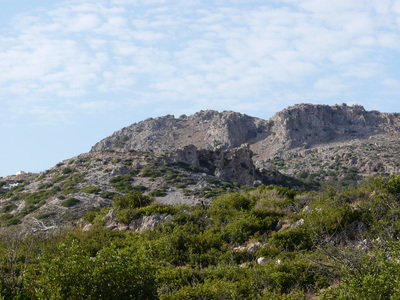 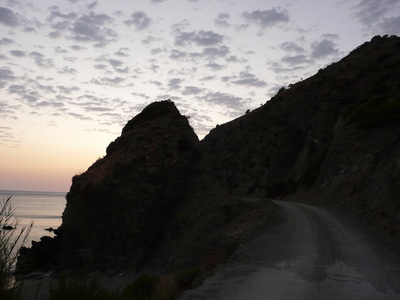 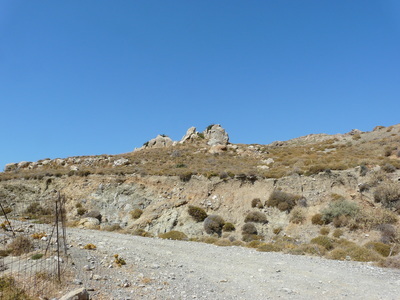 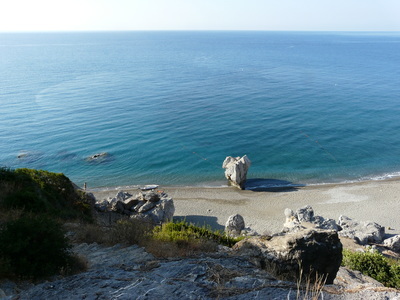 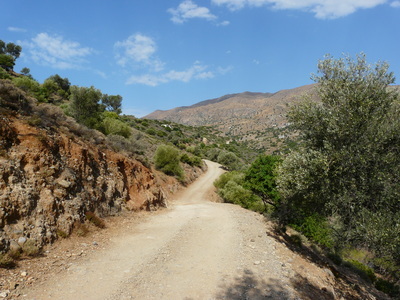 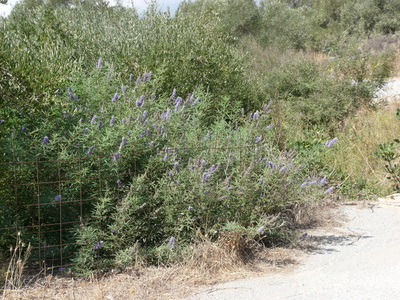 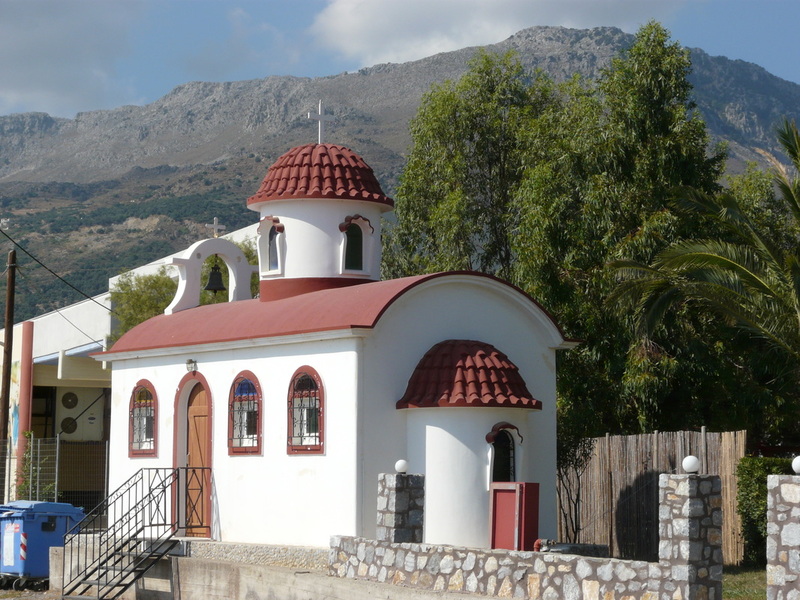 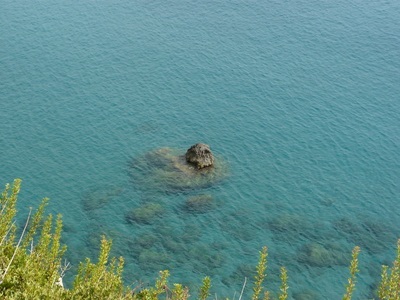 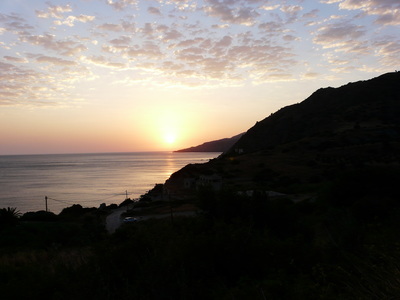 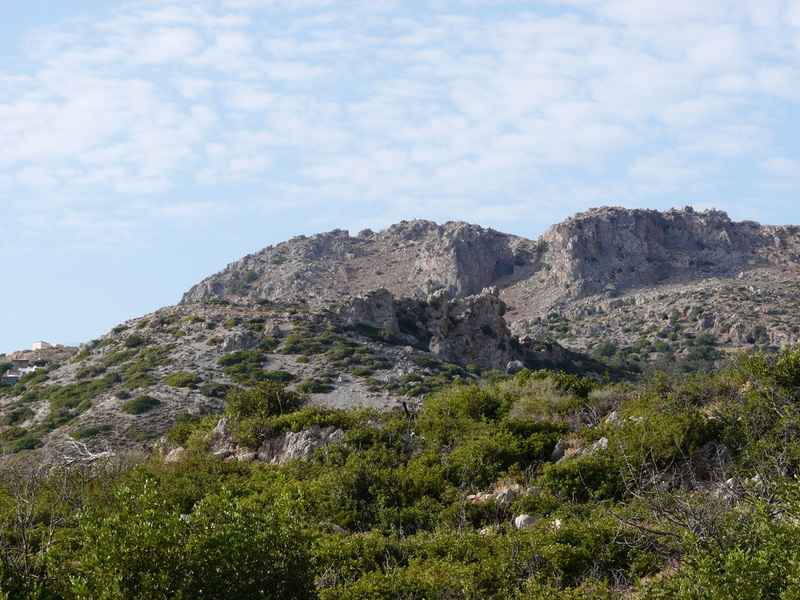 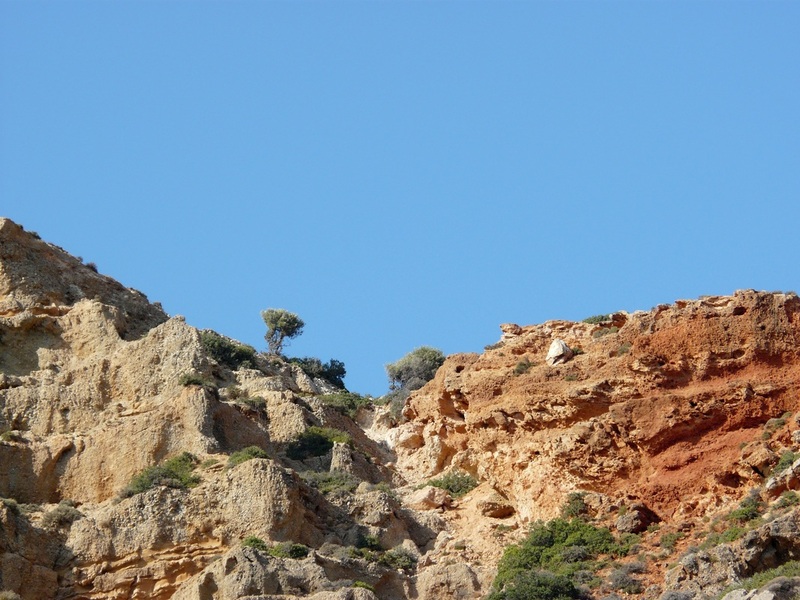 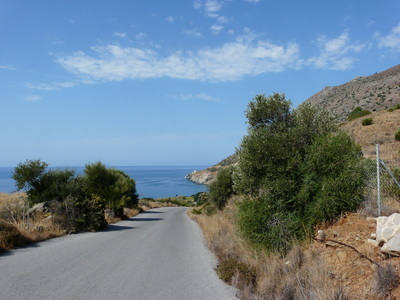 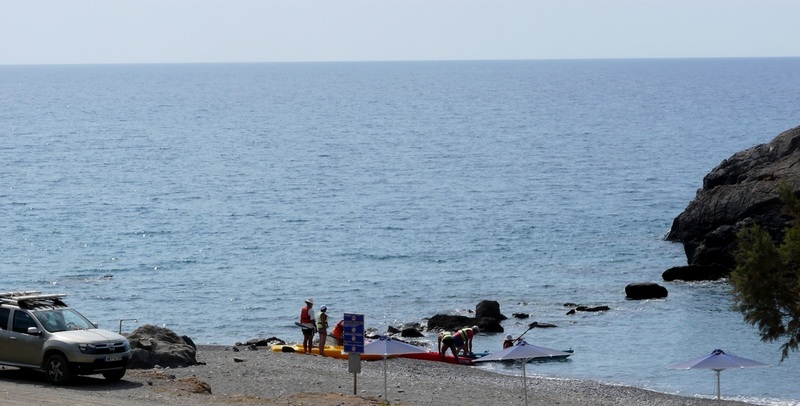 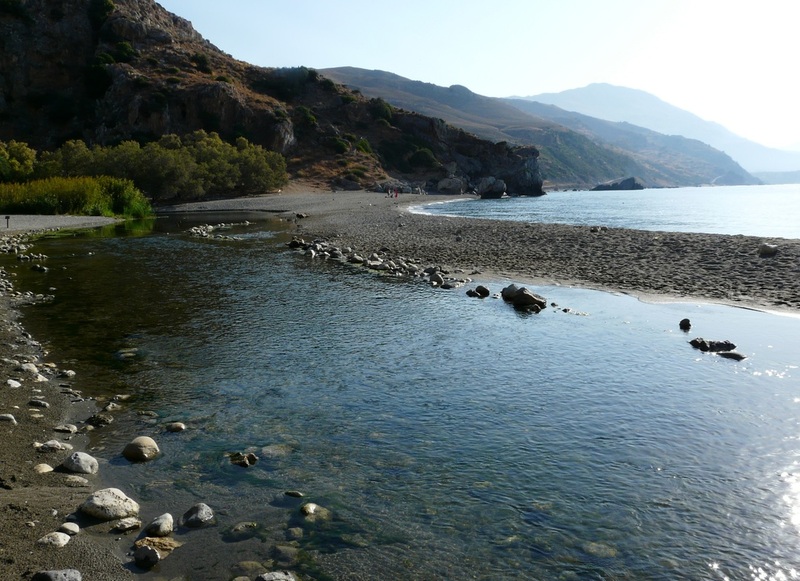 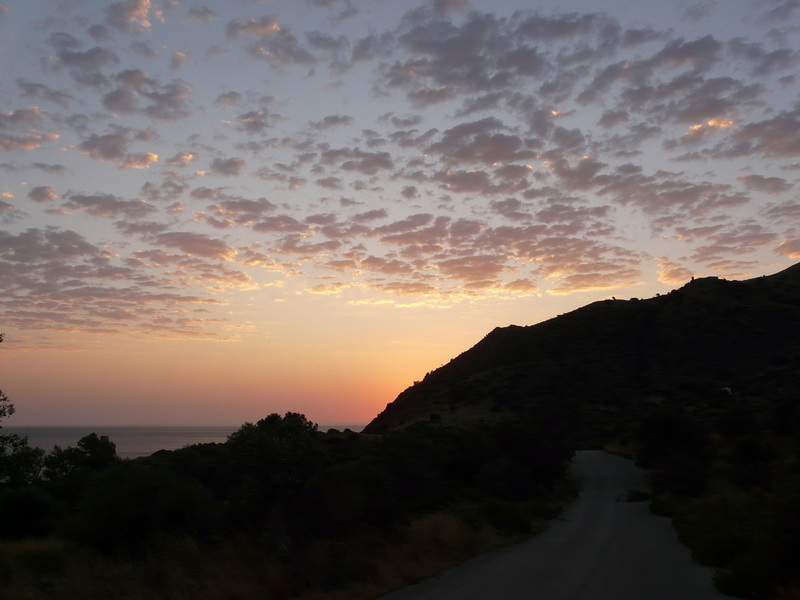 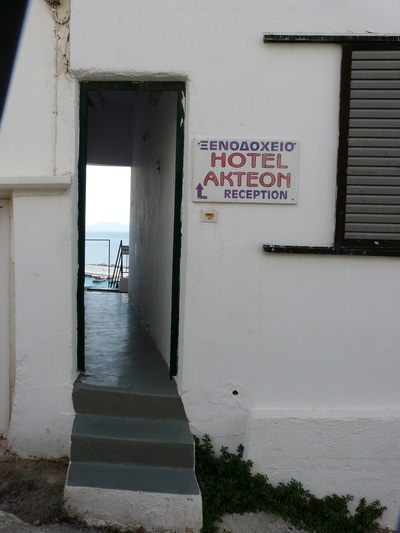 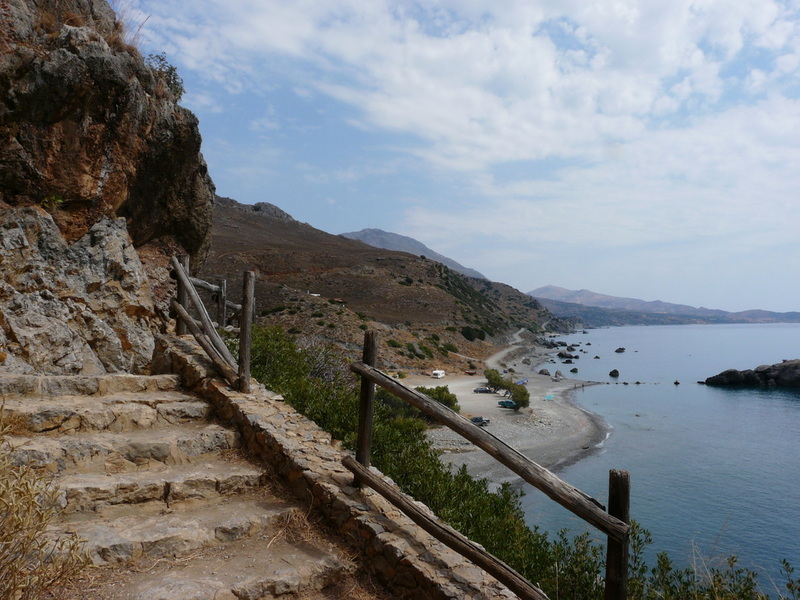 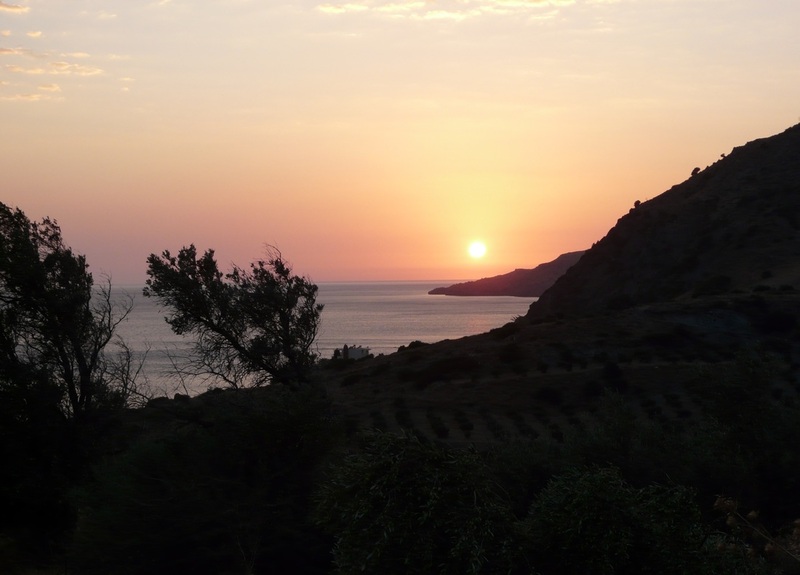 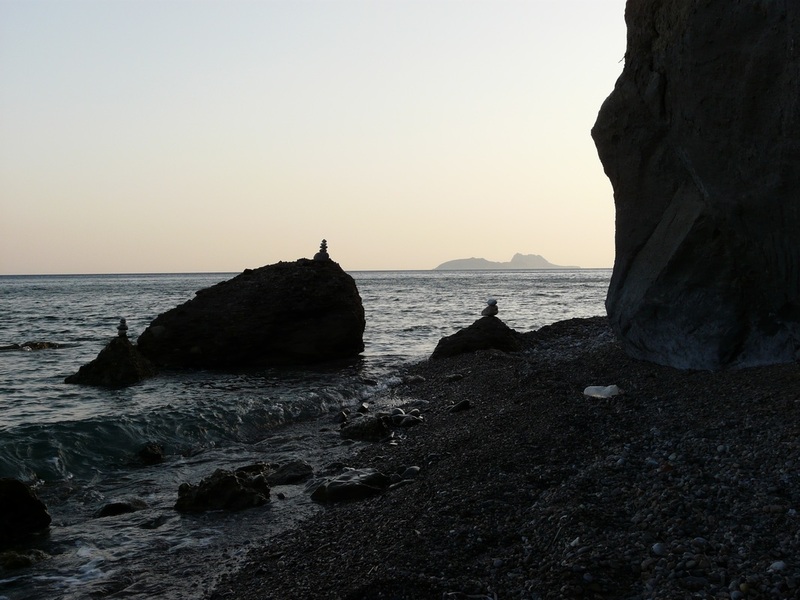 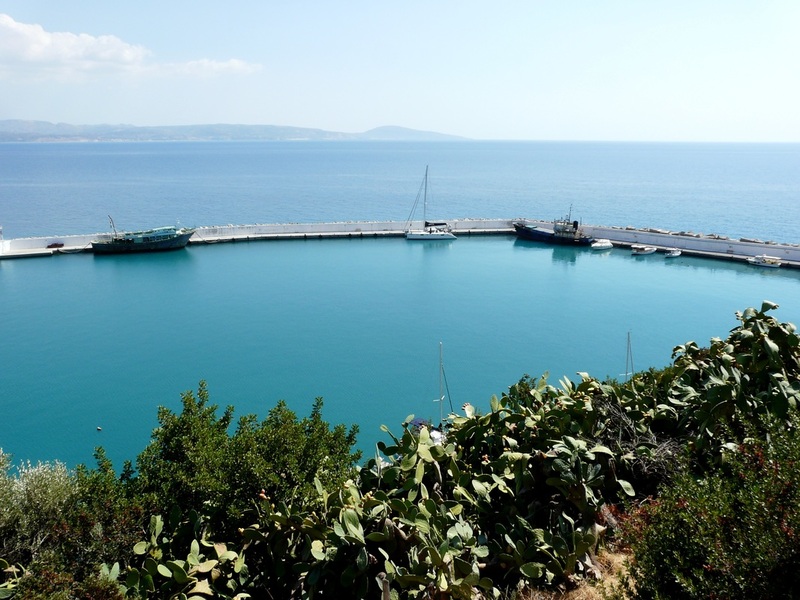 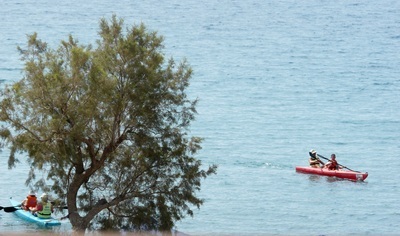 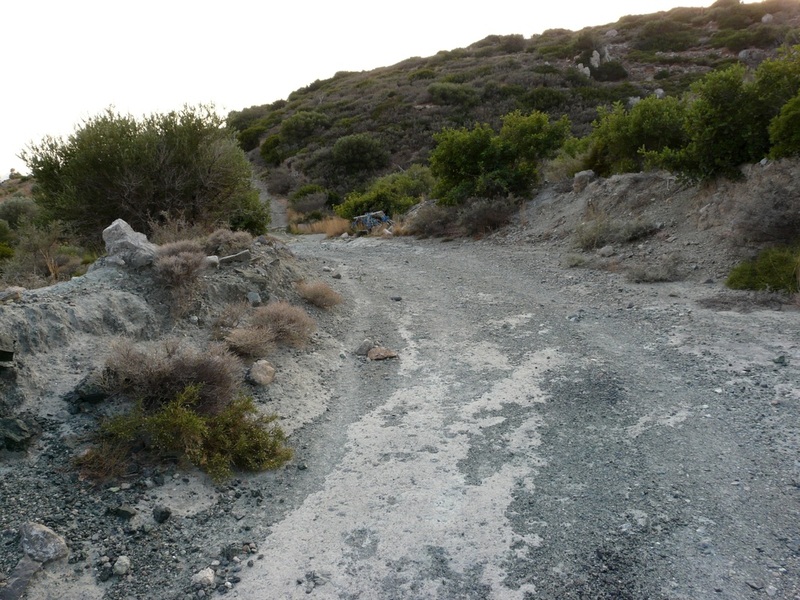 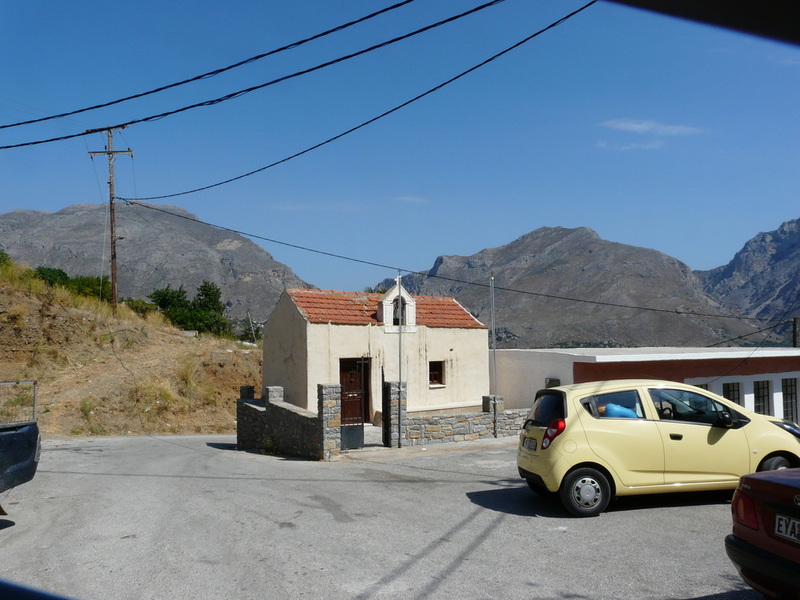 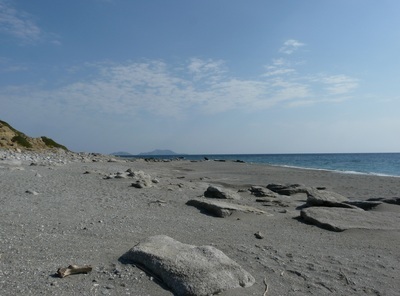 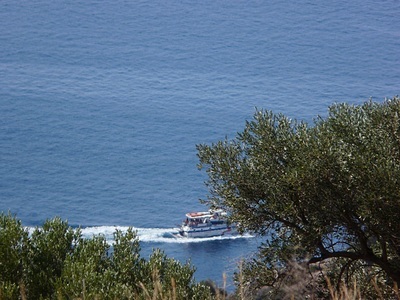 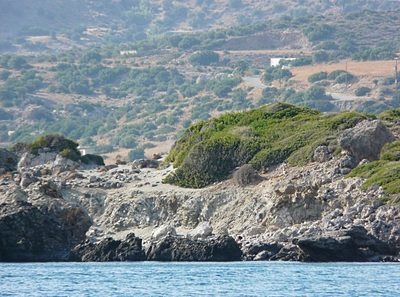 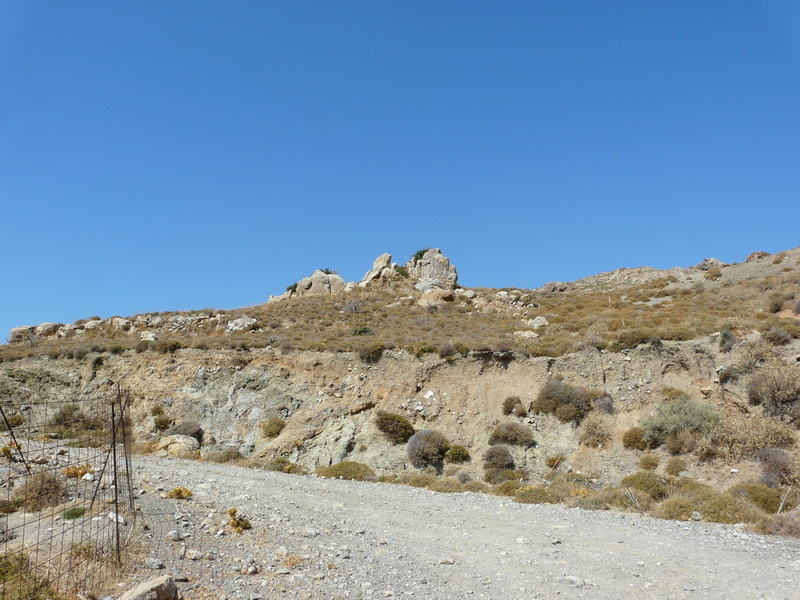 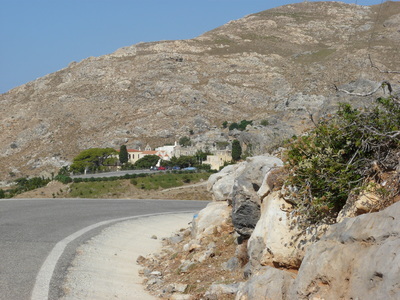 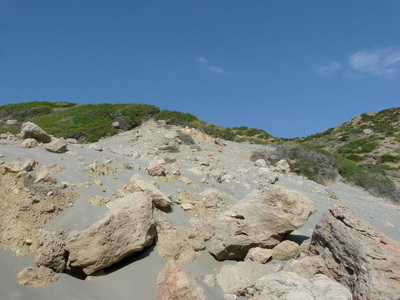 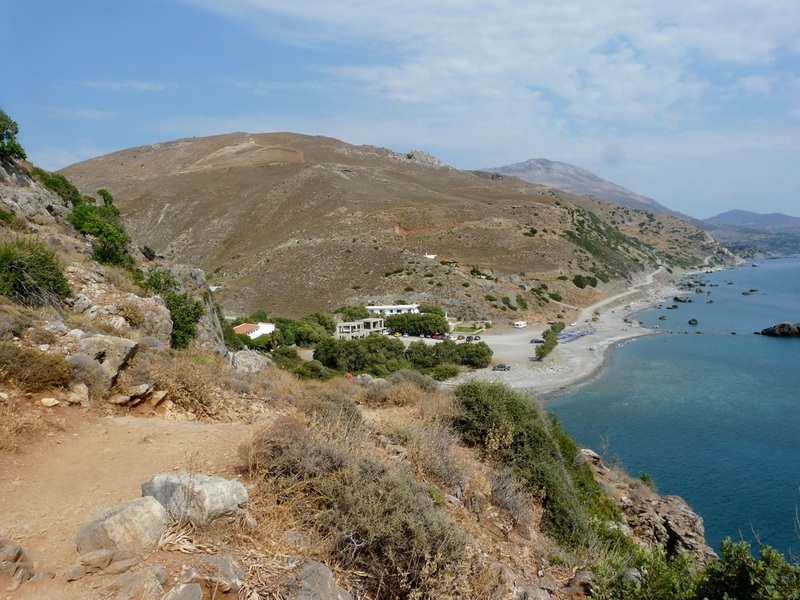 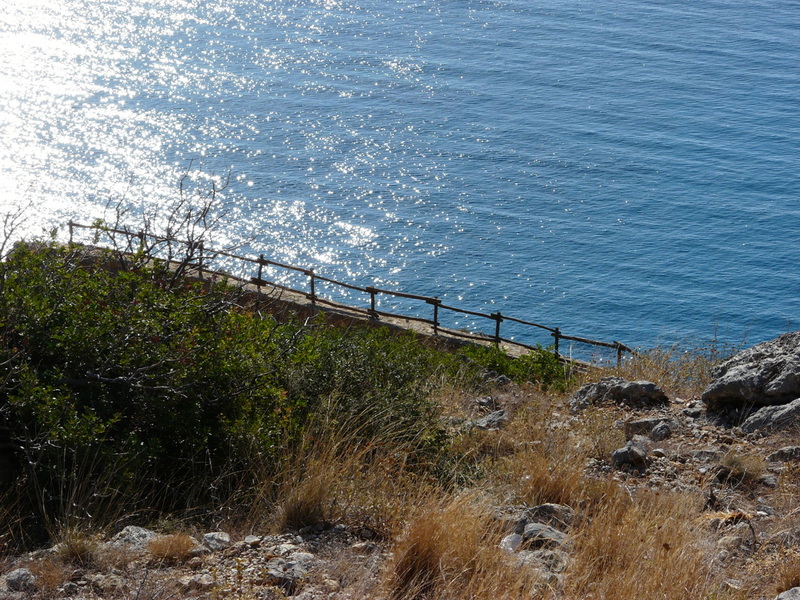 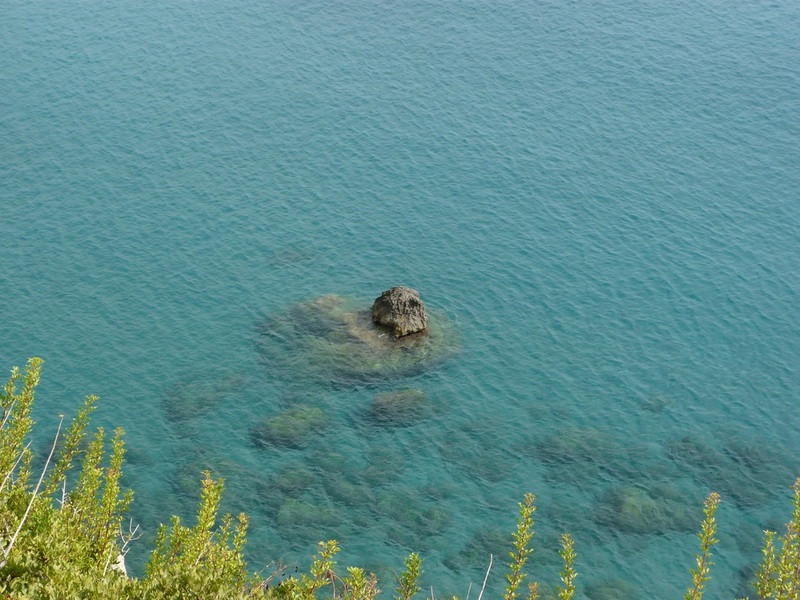 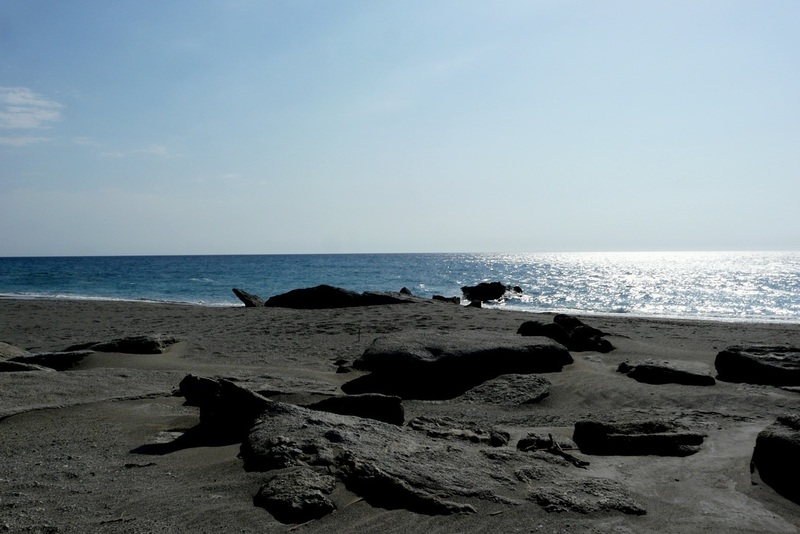 Walk from Agia Galini to Kokkinos Pirgos (Red Tower). 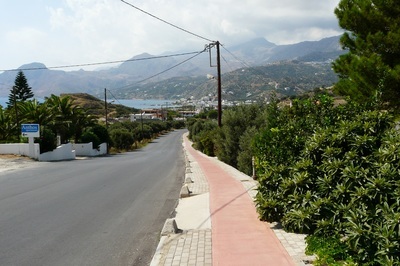 I have made this walk several times now. 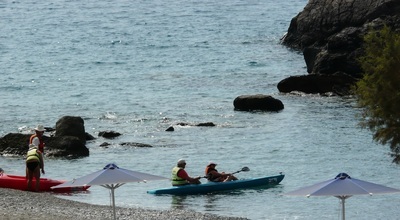 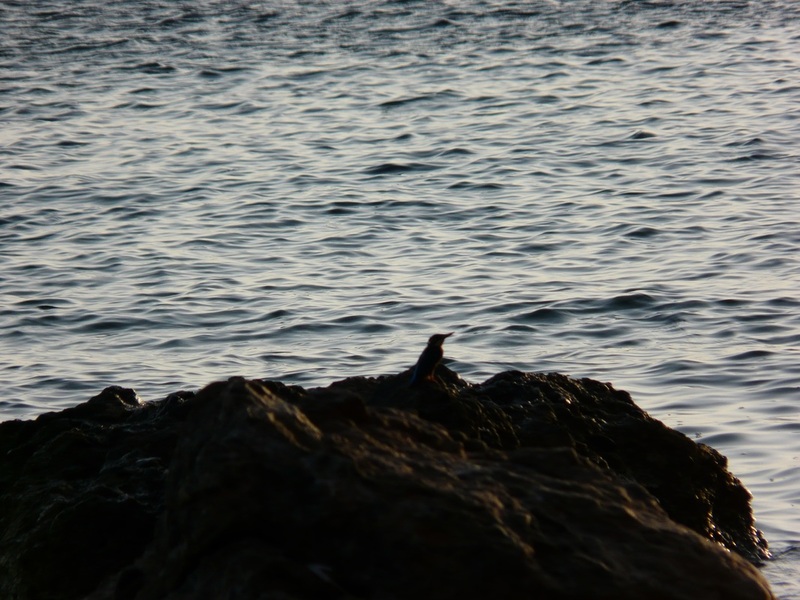 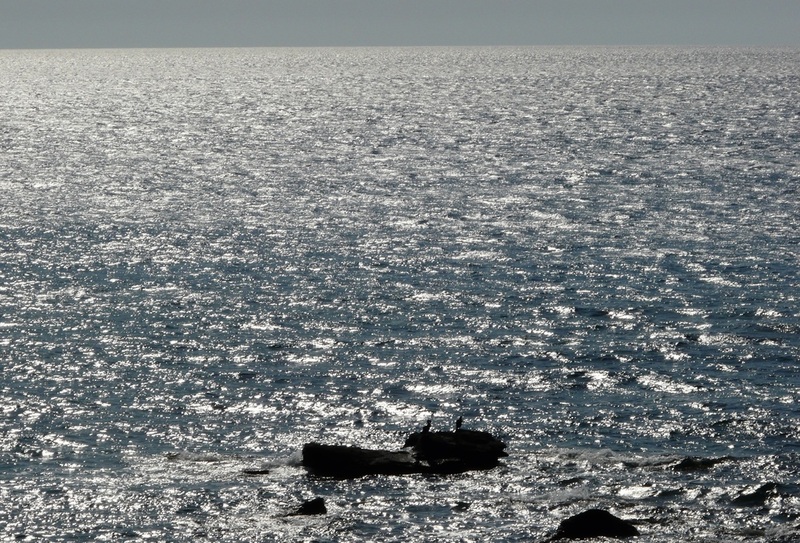 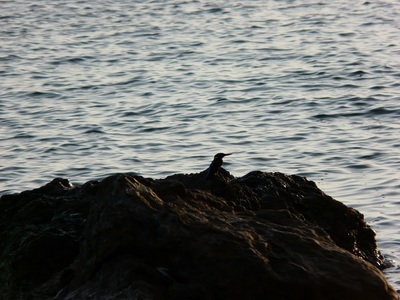 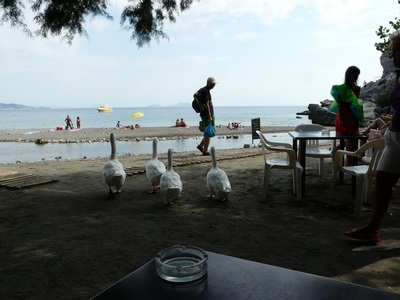 I find it very peaceful and get as much from it as others tourist get from a day lazing on the beach. 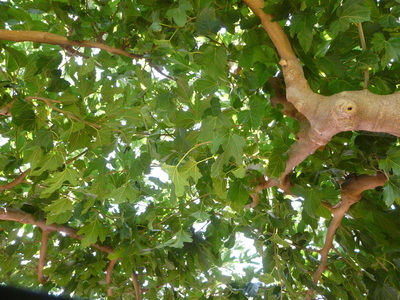 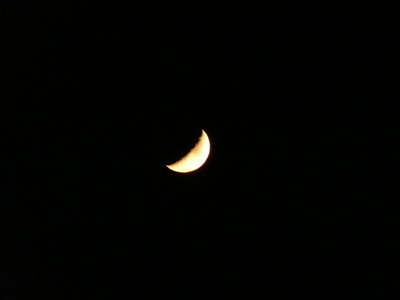 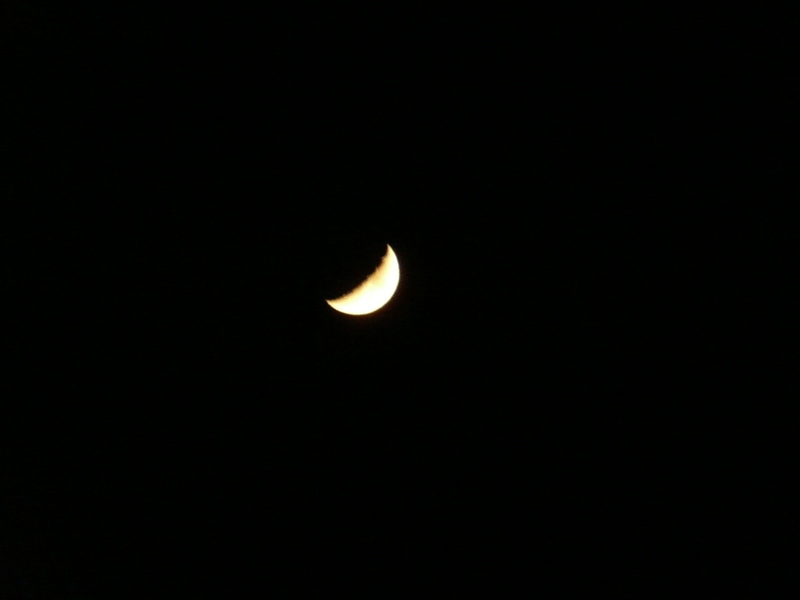 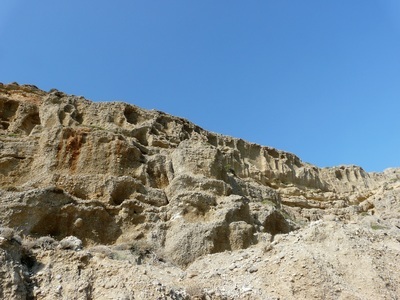 As you can see from the images it was a beautiful day. 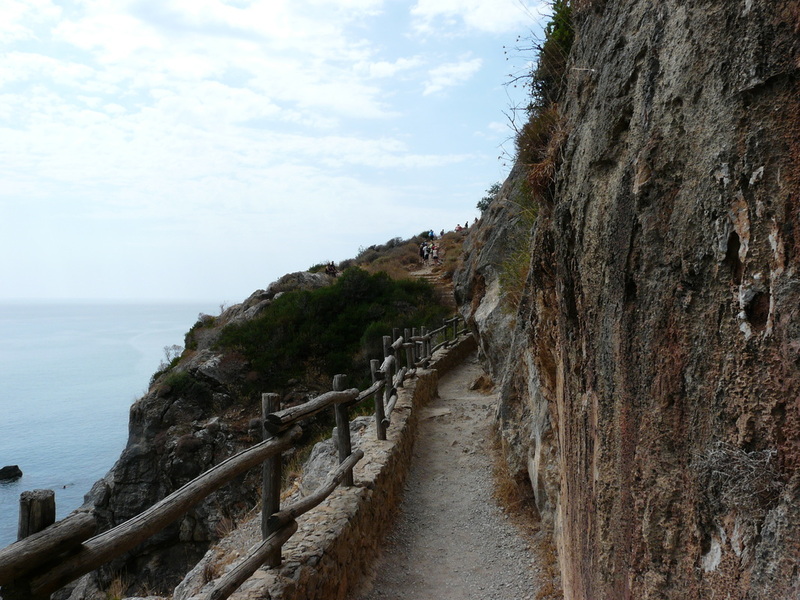 The walk is just under the 5km (so less than 3ml). 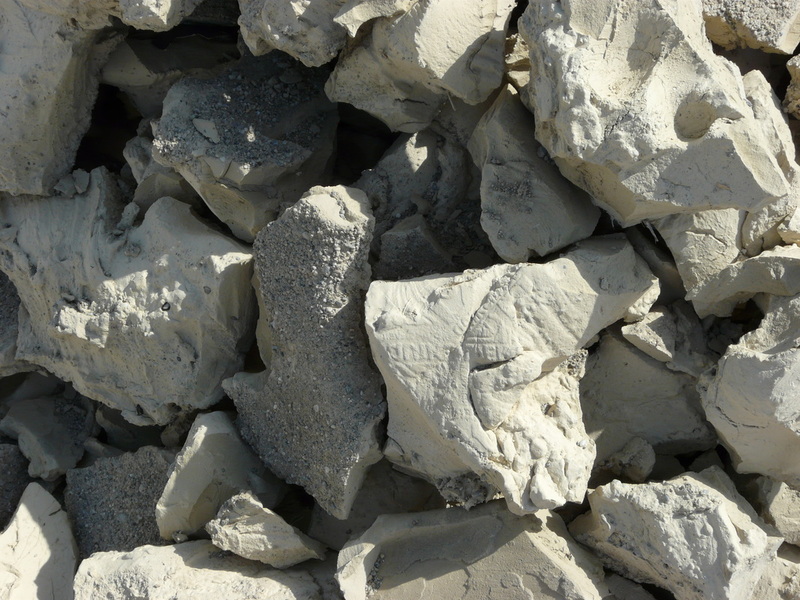 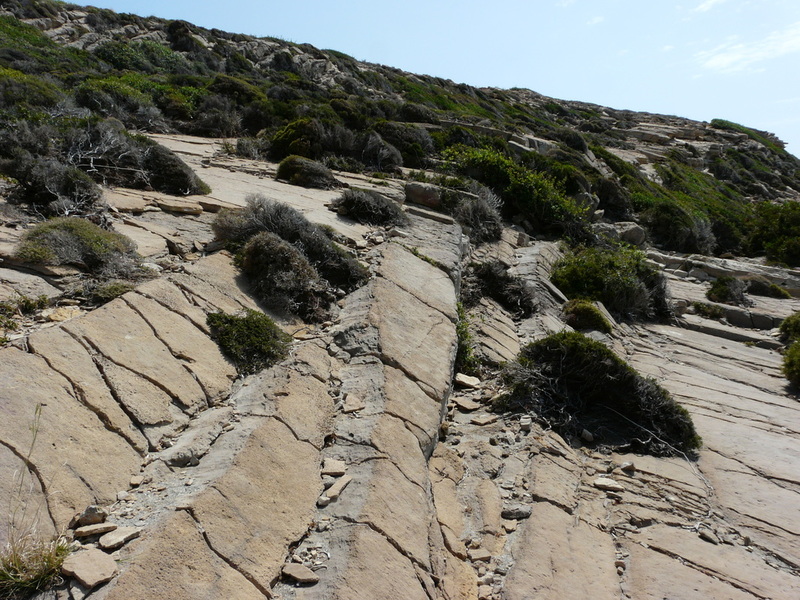 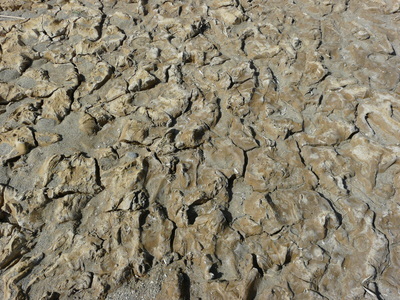 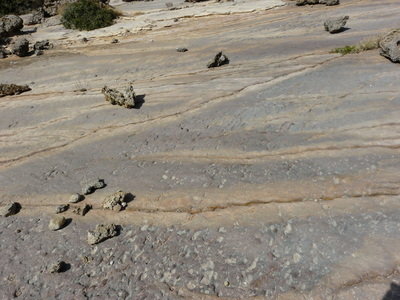 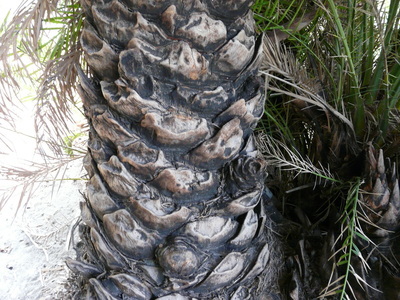 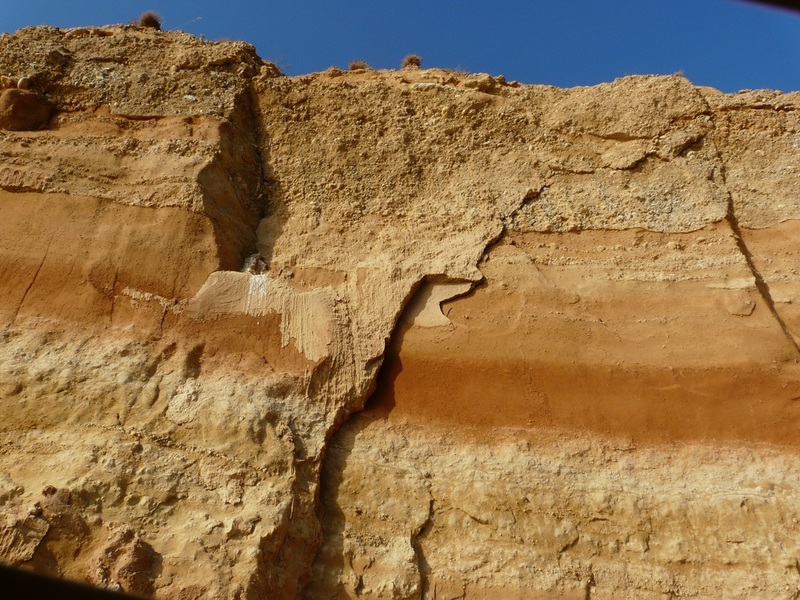 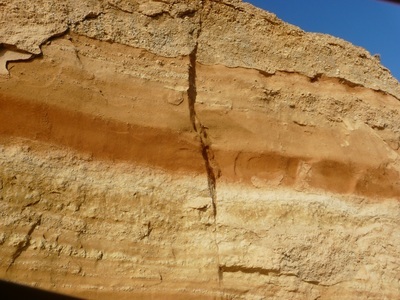 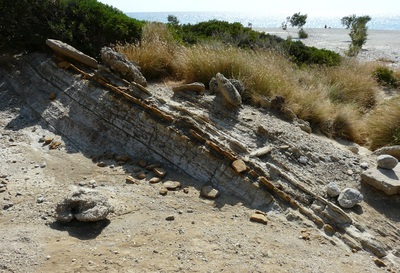 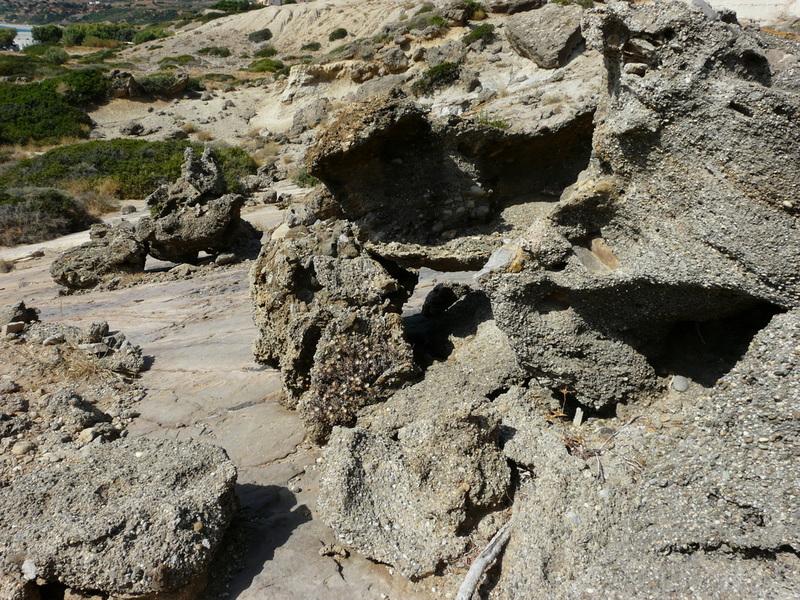 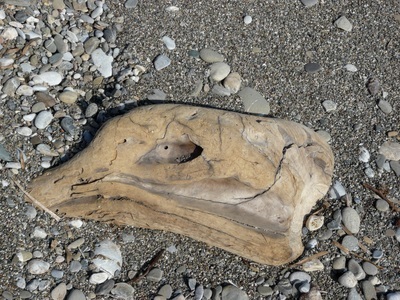 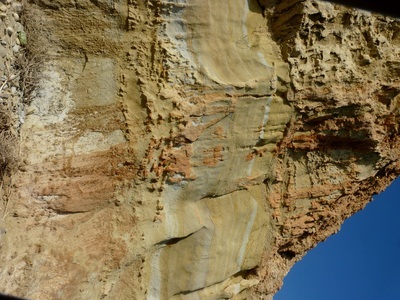 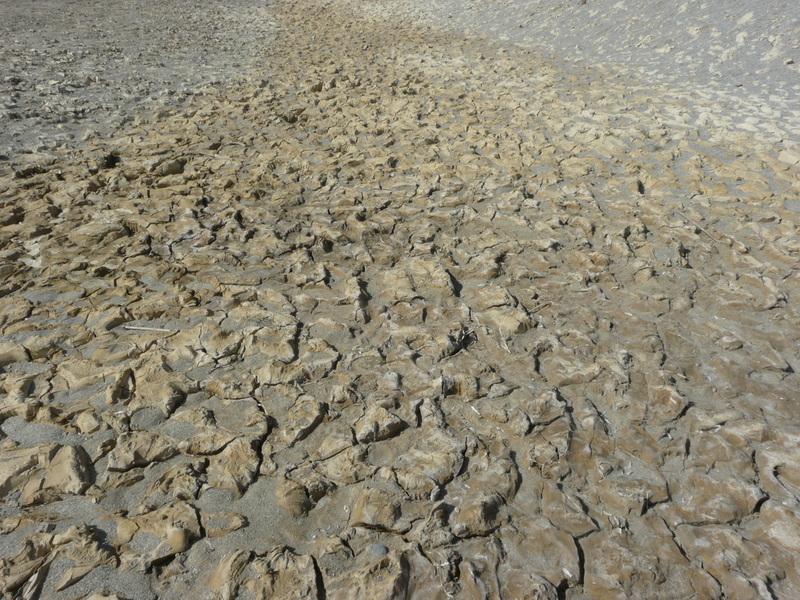 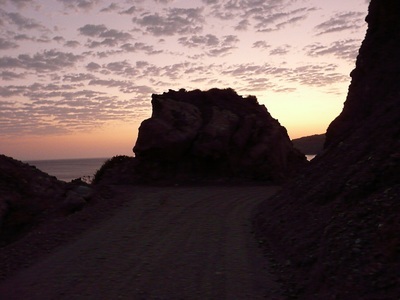 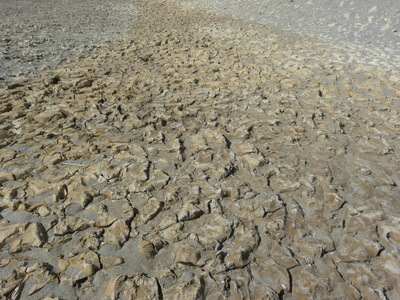 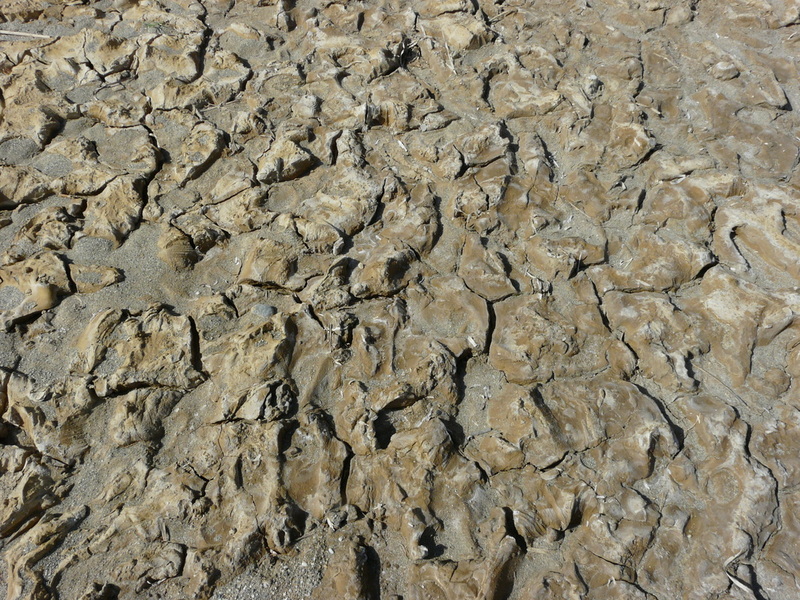 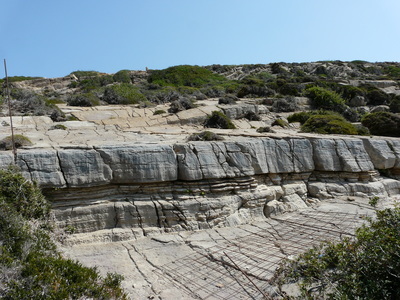 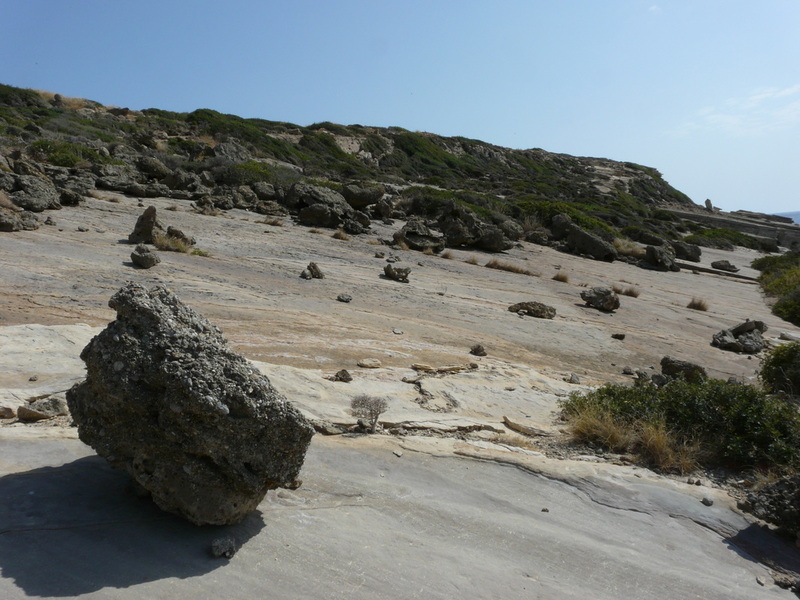 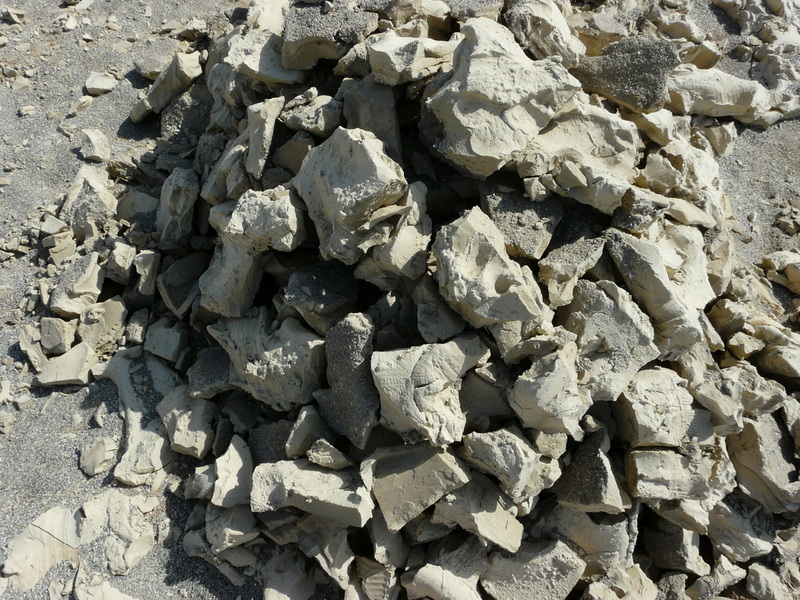 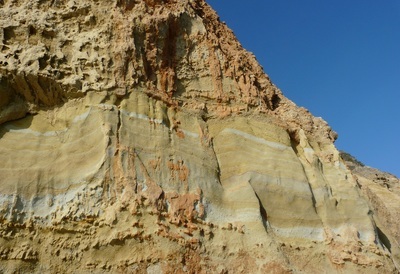 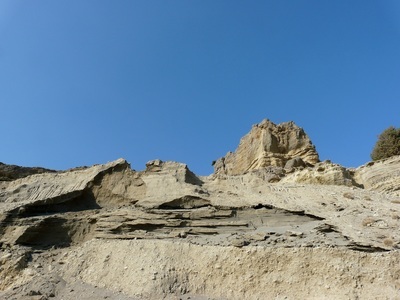 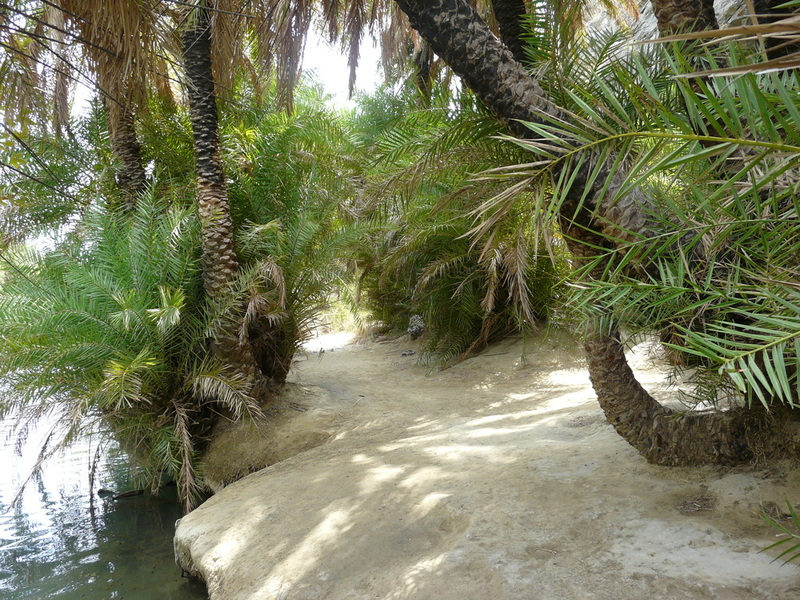 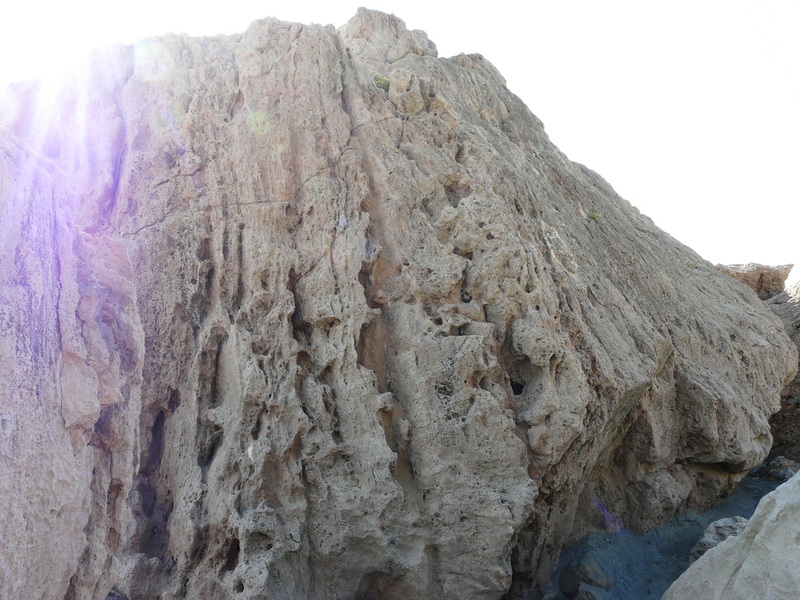 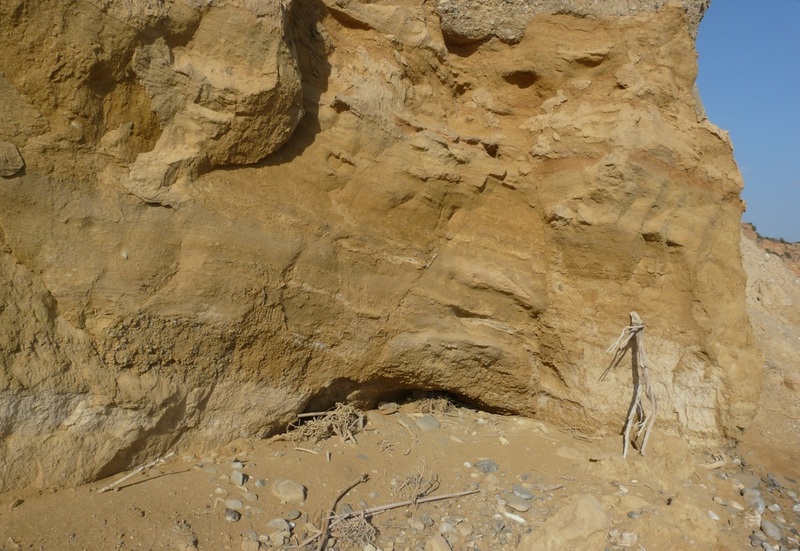 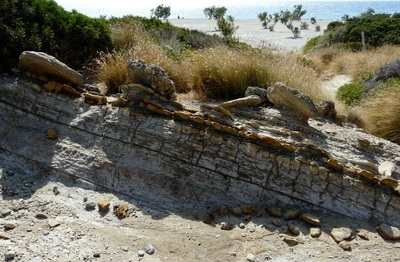 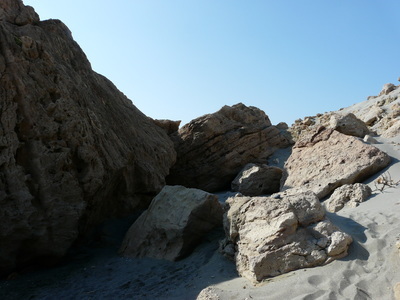 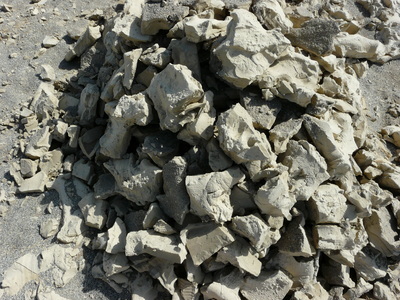 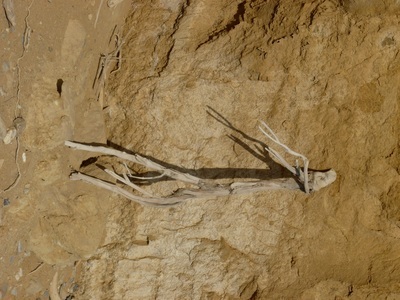 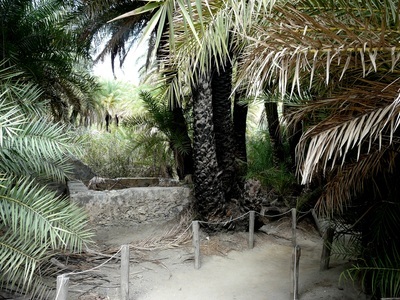 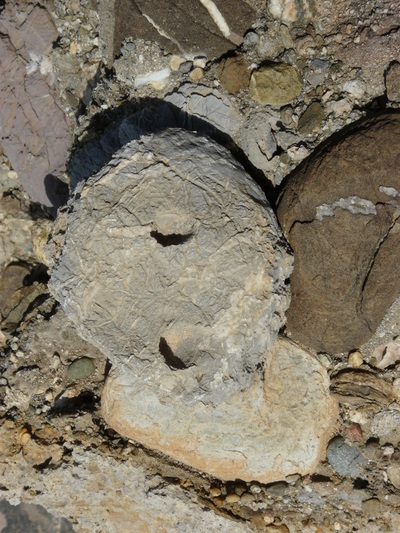 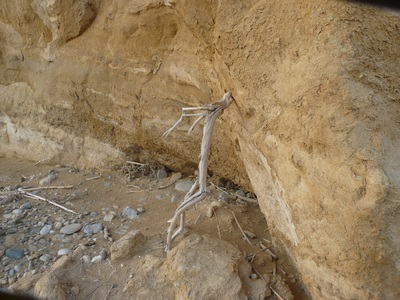 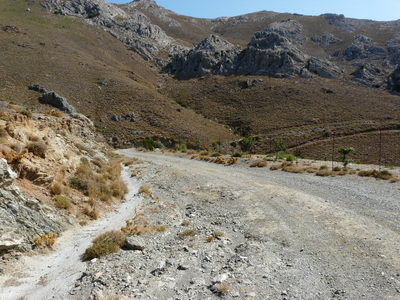 You have a choice of covering a little less than half of it on a dirt track while the remainder is on stone and beach. 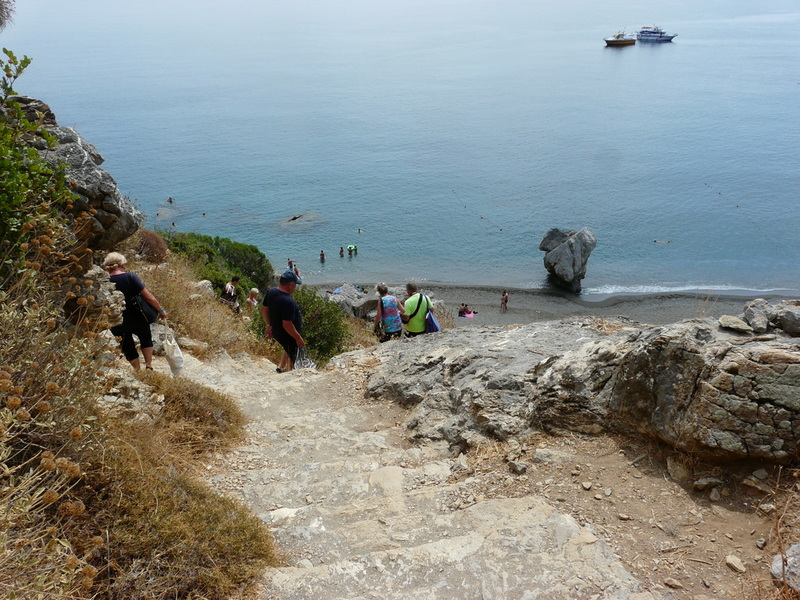 Definitely good footwear is recommended, I have done it on previous occasions with good heavy sandals (Columbia) but would not recommend. 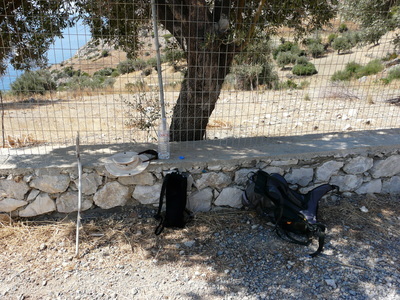 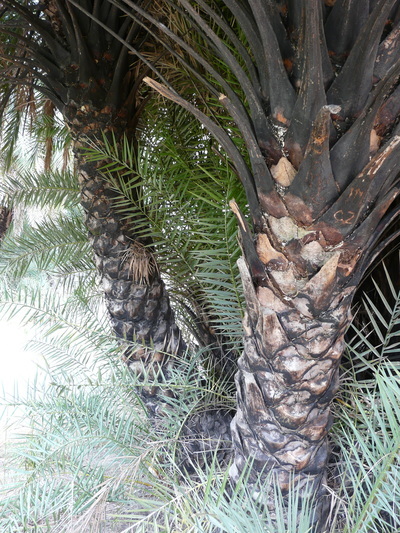 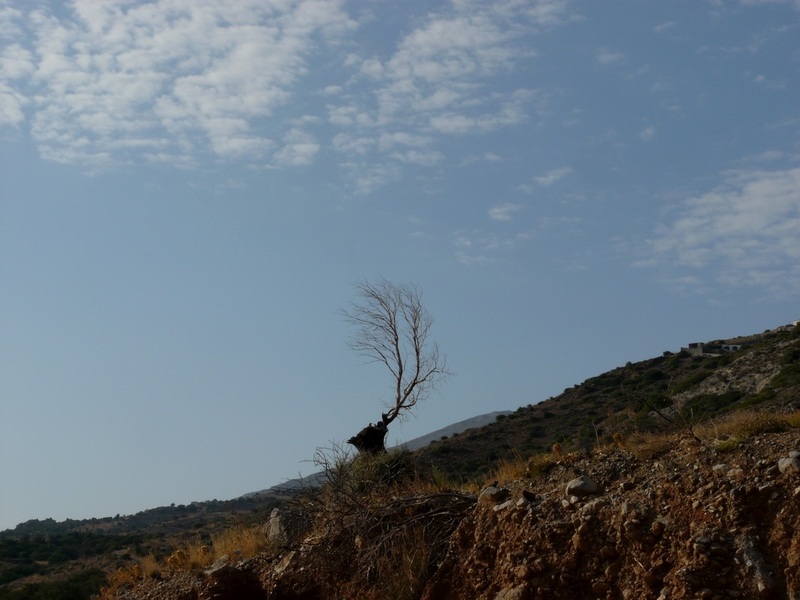 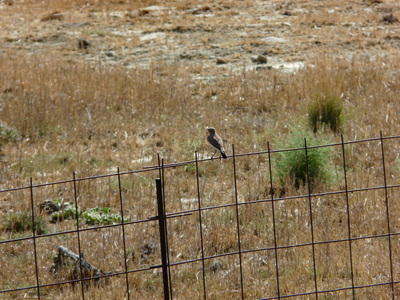 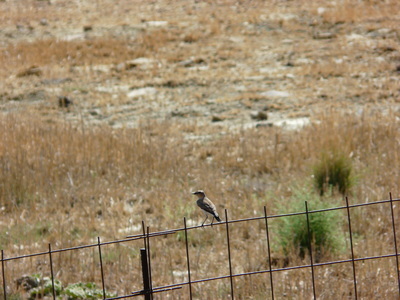 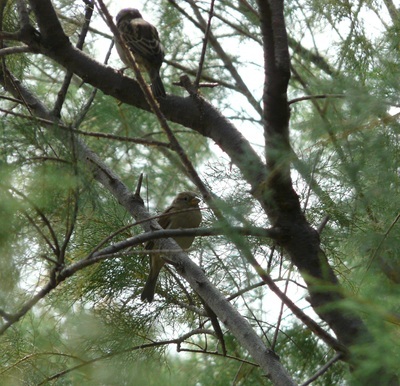 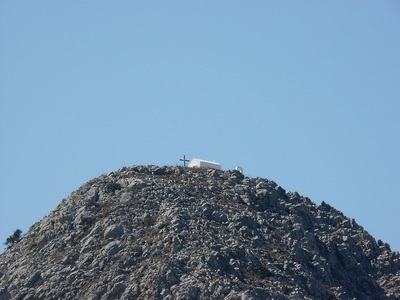 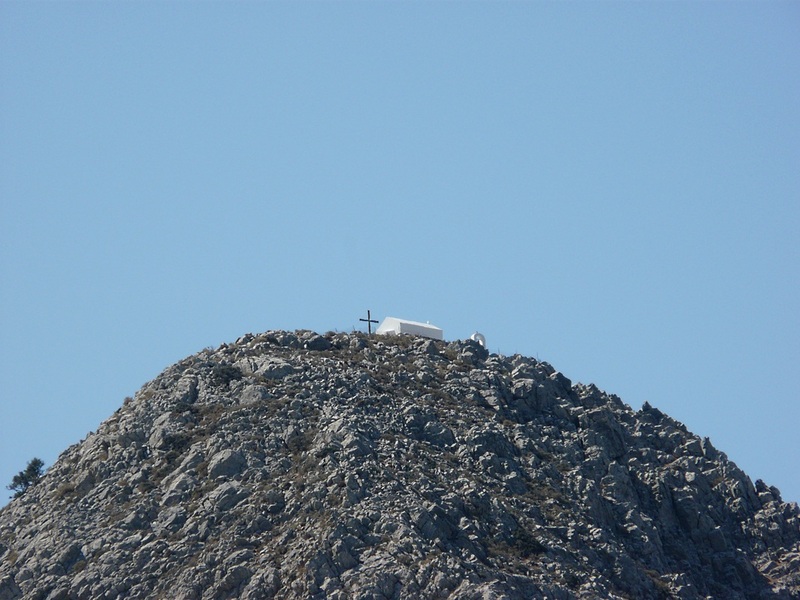 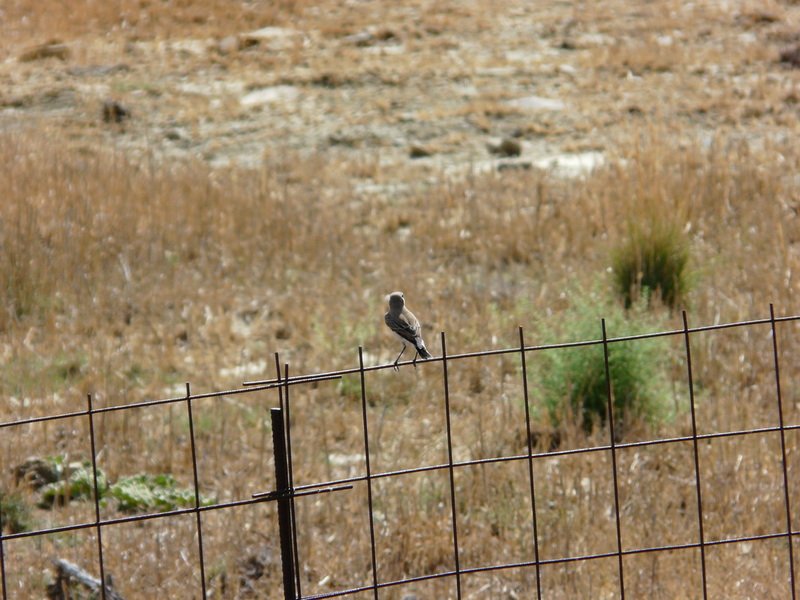 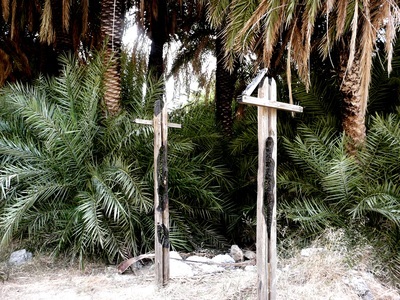 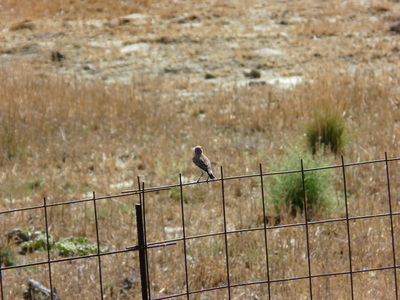 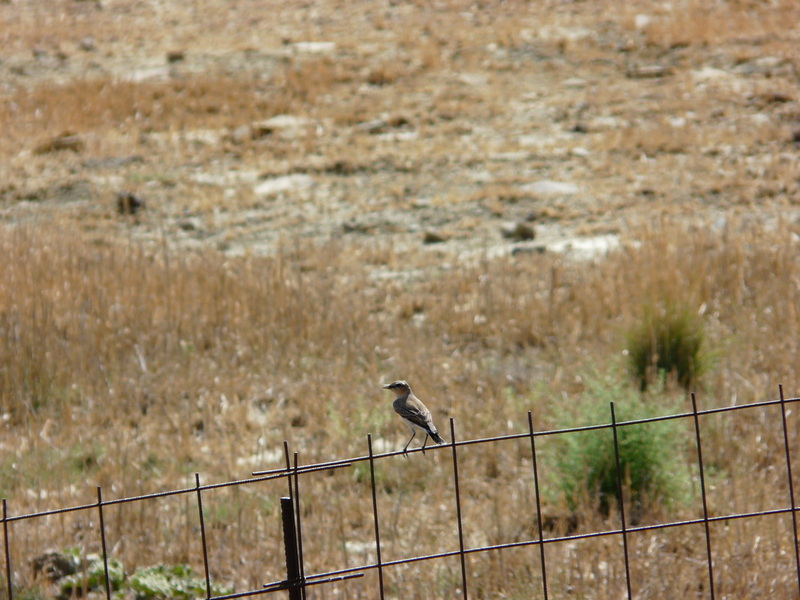 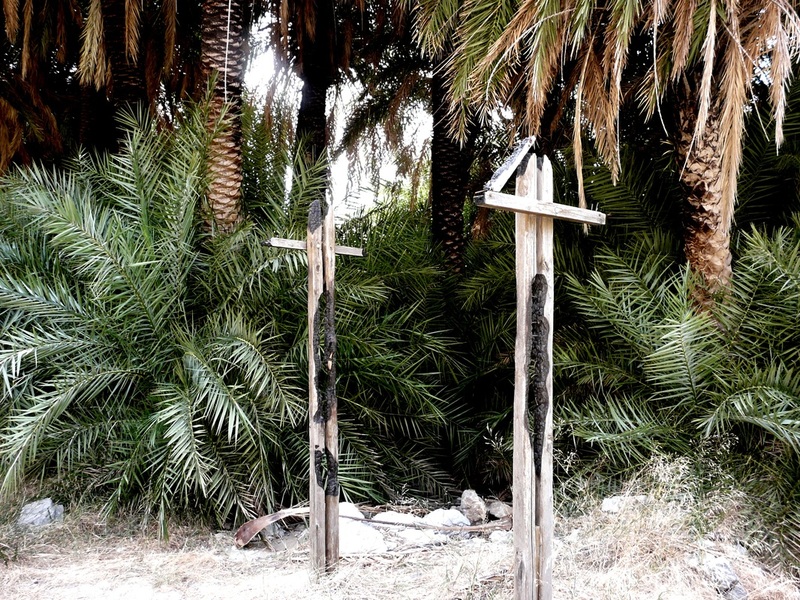 There is no shelter to speak of and as with walking anywhere on Crete; BRING WATER. 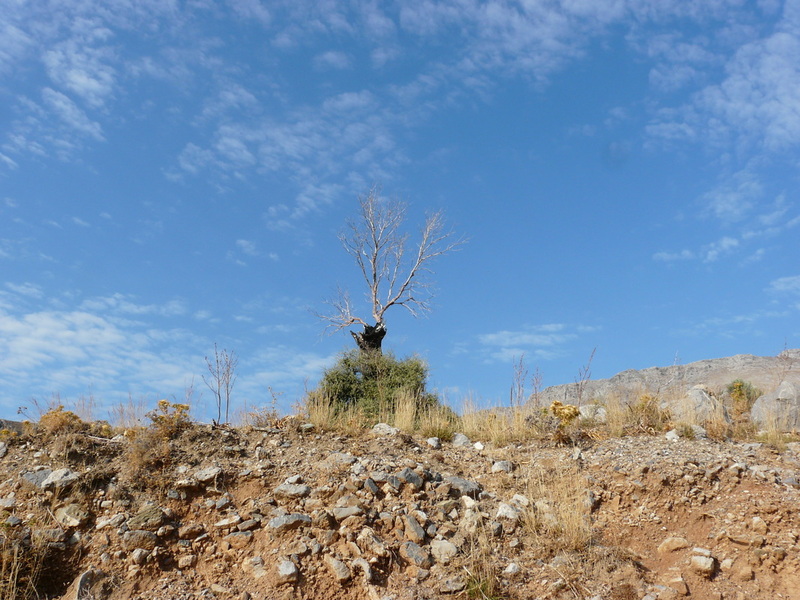 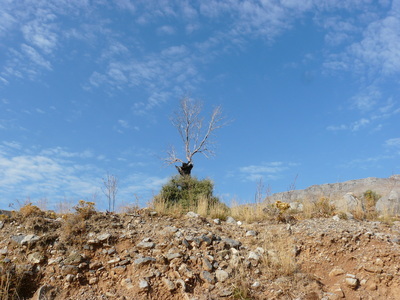 About half way between the two villages I met the Dancing Stickman or Mr Galini Pirgos (Peaceful Tower). 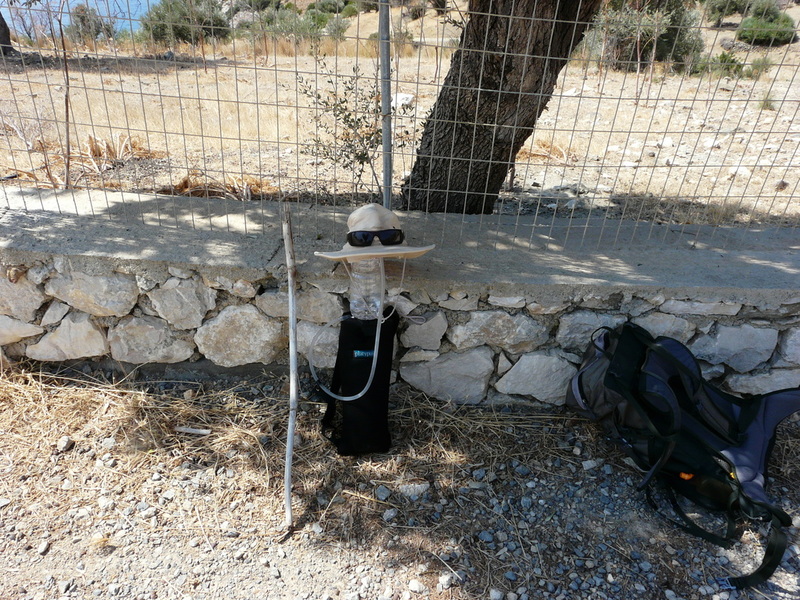 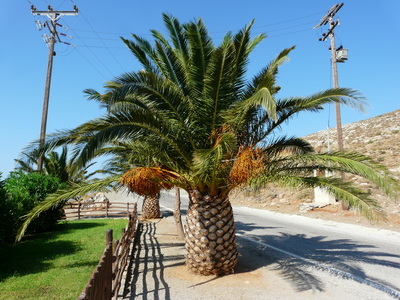 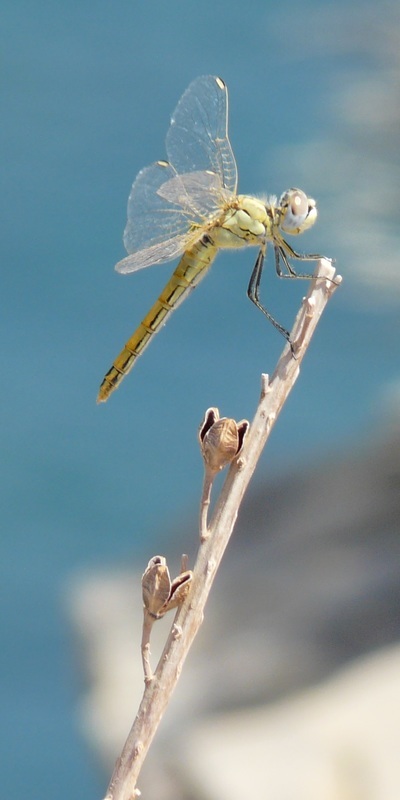 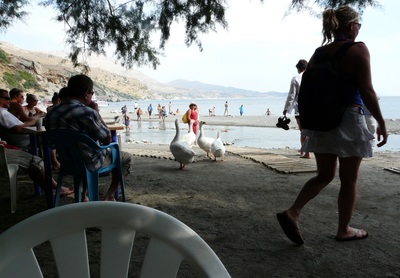 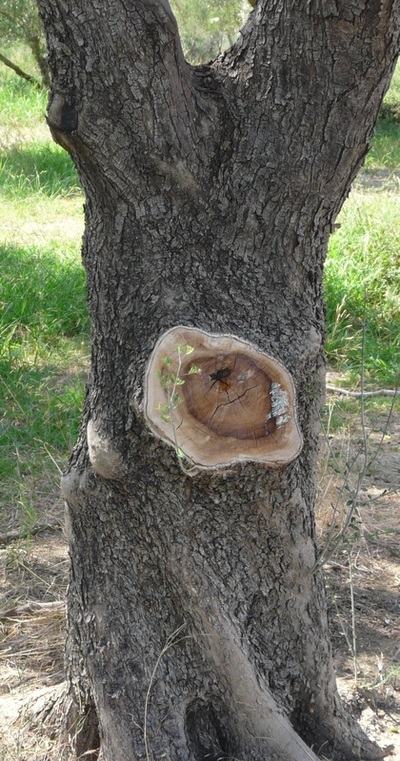 If you want to see him move you have to see him on a hot day, say around 30+, don't drink any water instead have a few beers following by 2 - 3 metaxa's sit near him around midday being careful to avoid any shade and keeping your head uncovered at all times. 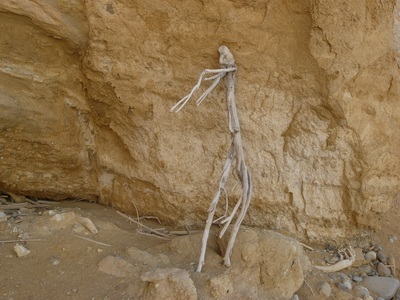 Boy can he move then. He reminds me of a thirsty Irishman (or any nationality that suits the occasion) at a wedding who half way to the bar gets lost on the dance floor. 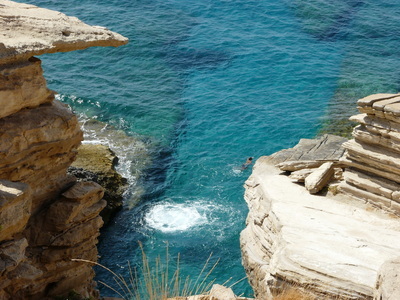 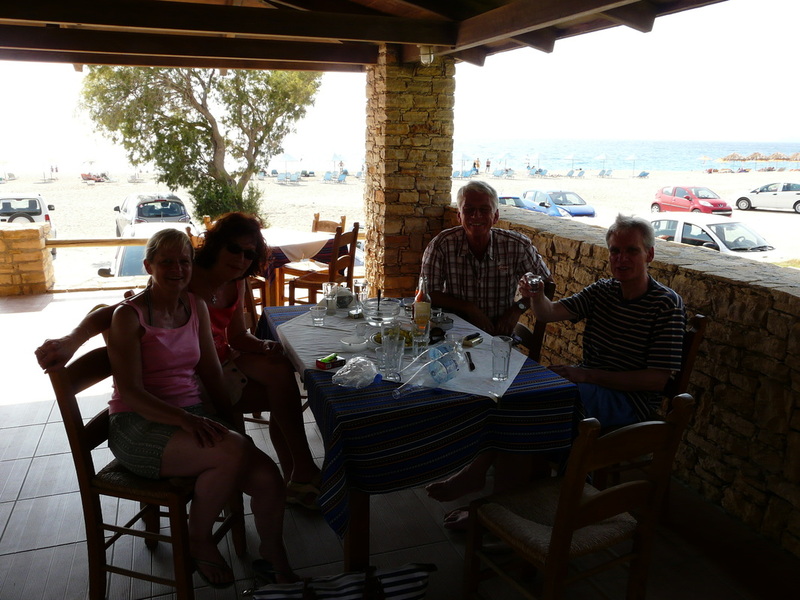 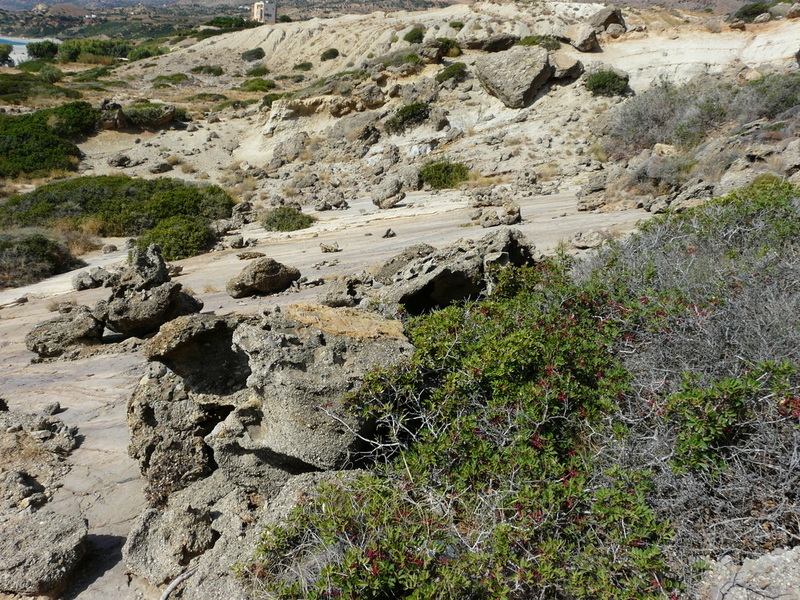 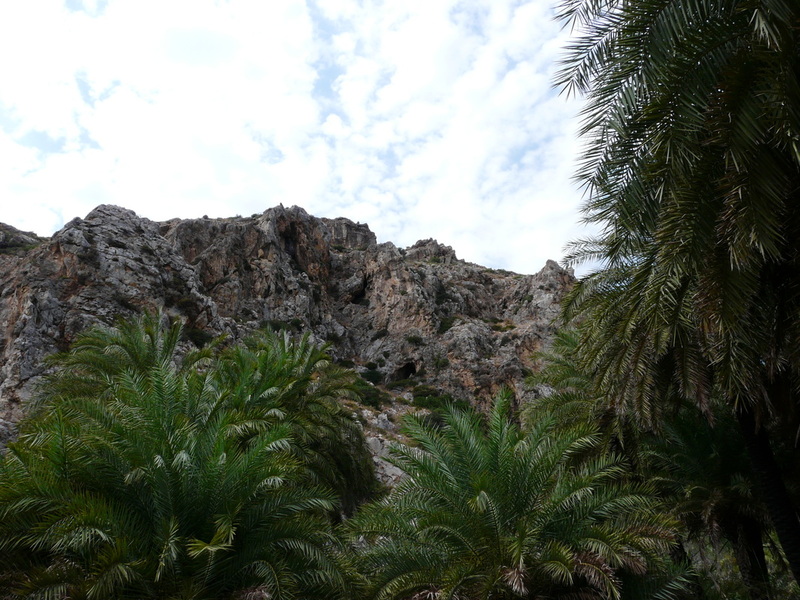 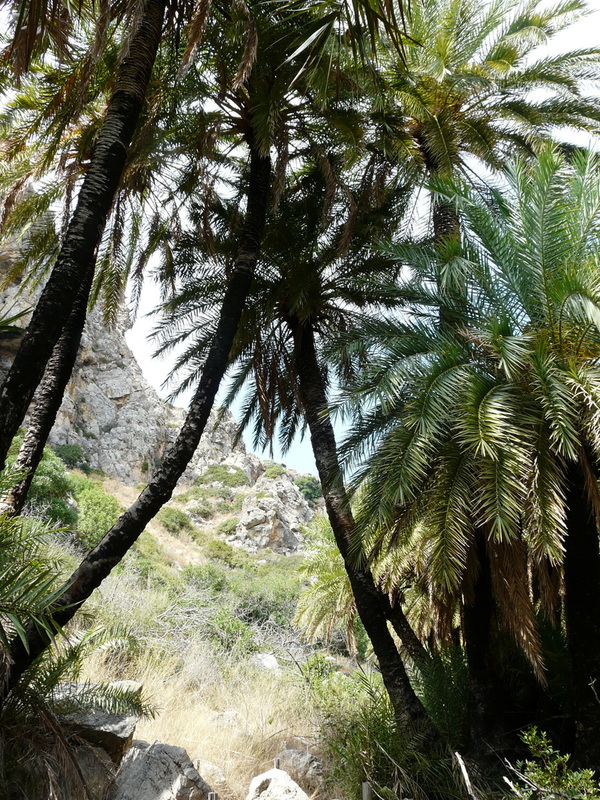 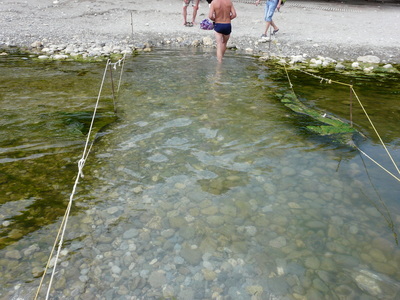 Went over to Triopetra for the day with Mike, Viv, Lydia & Wim. 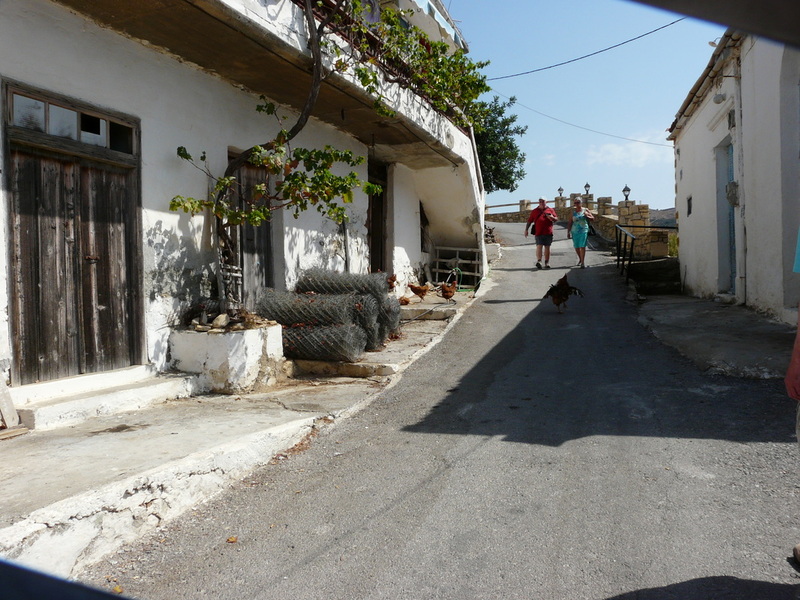 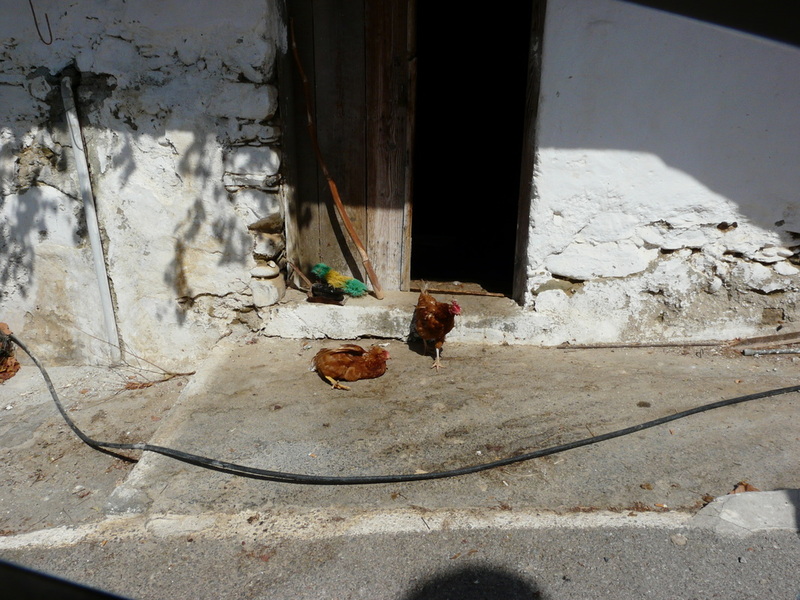 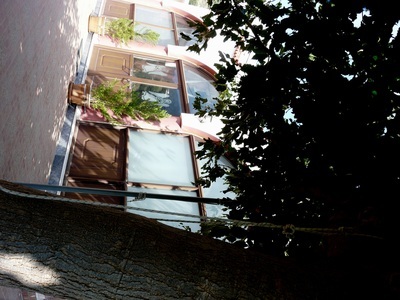 The first images are of Chicken Alley in Galini, I did not know it 's name until Mike & Viv told me who in turn had being give this fairly useless (unless of course you have a chicken phobia) information by Marlyn and Bill the Shirt. 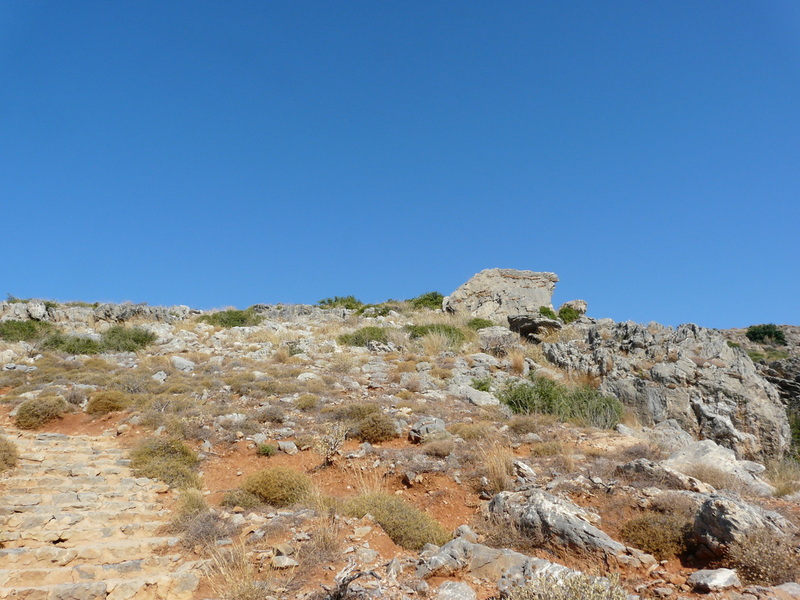 When in Triopetra large I took a wander over to its smaller namesake. Wow. 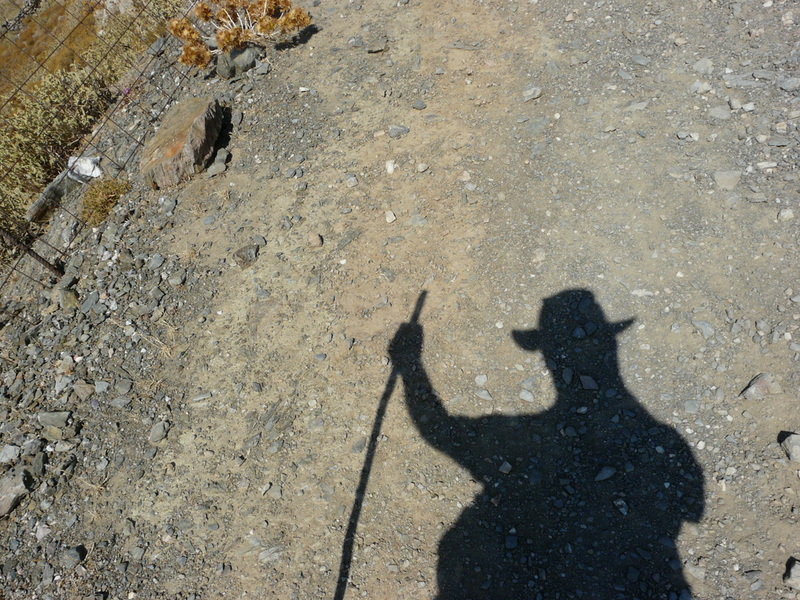 I was really looking forward to this day and boy did I bite off more than I could chew. 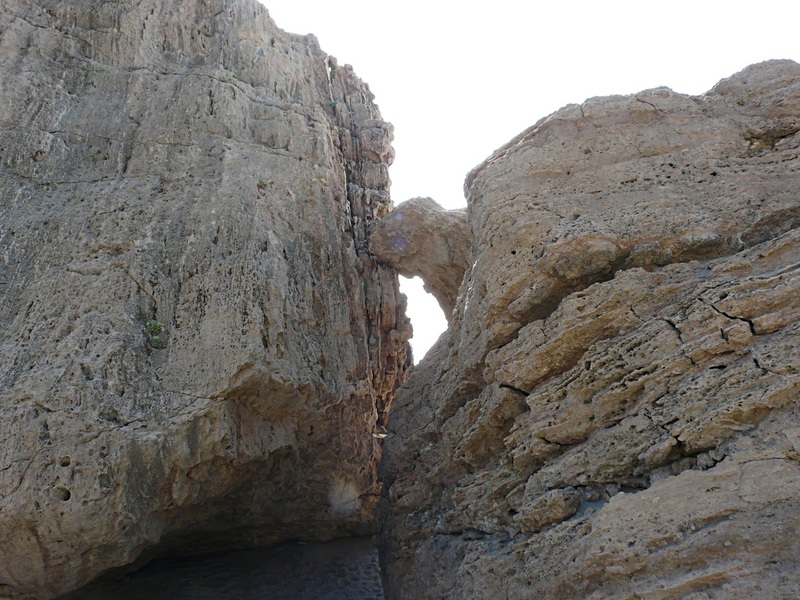 I had planned and prepared for this for about 3-4 months and still got it wrong. Started out by leaving my detailed maps in Sligo, Ireland, spent too long drinking the night before, set off at around 10.40 instead of 9.00. And while I knew the distance of 30km was doable with my fitness level I had not practised often enough with the weight I was carrying, 12 - 14 kg depending on the amount of water, the temperature was around 31 degrees and nary a cloud or breeze to be found. 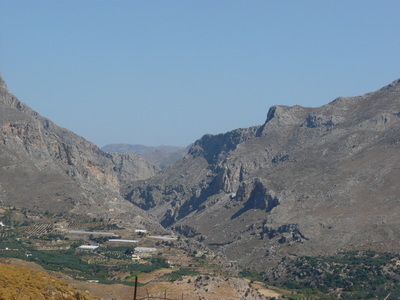 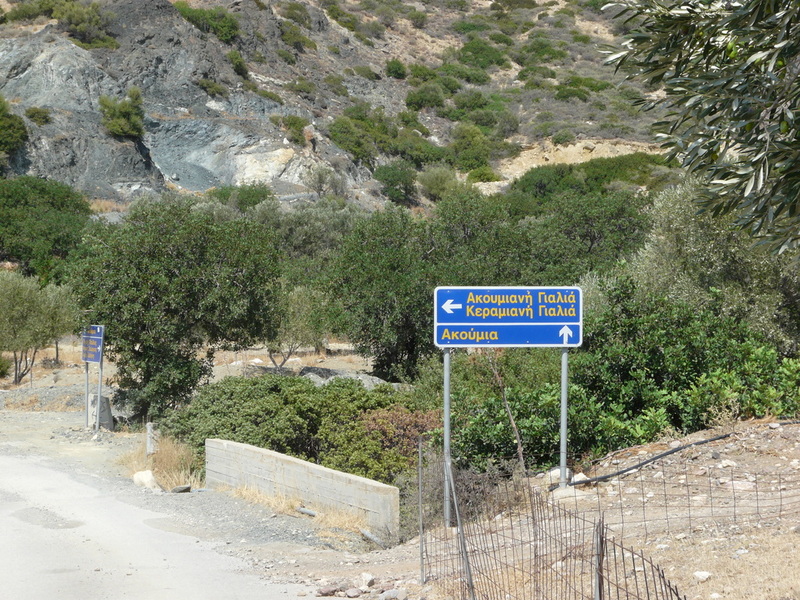 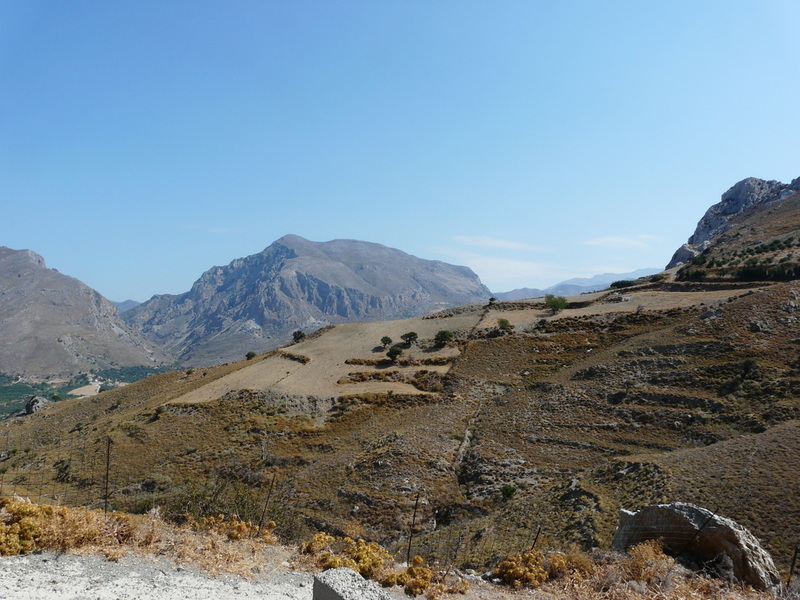 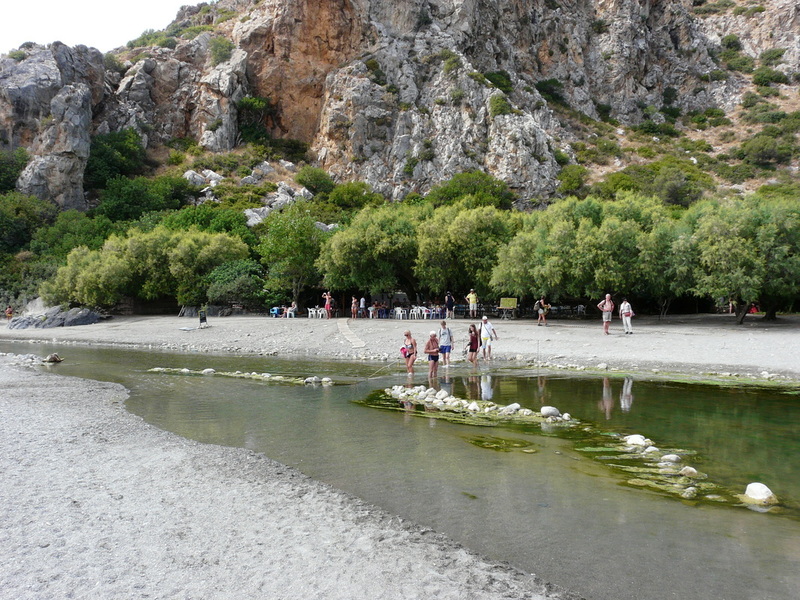 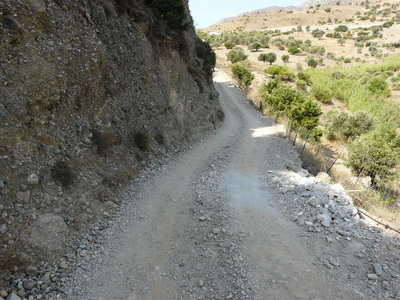 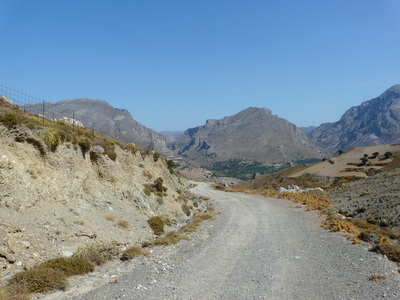 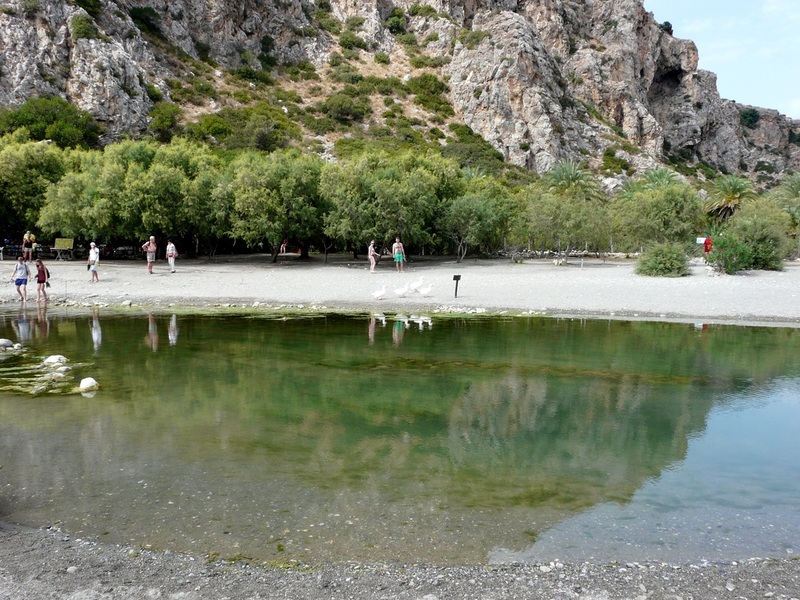 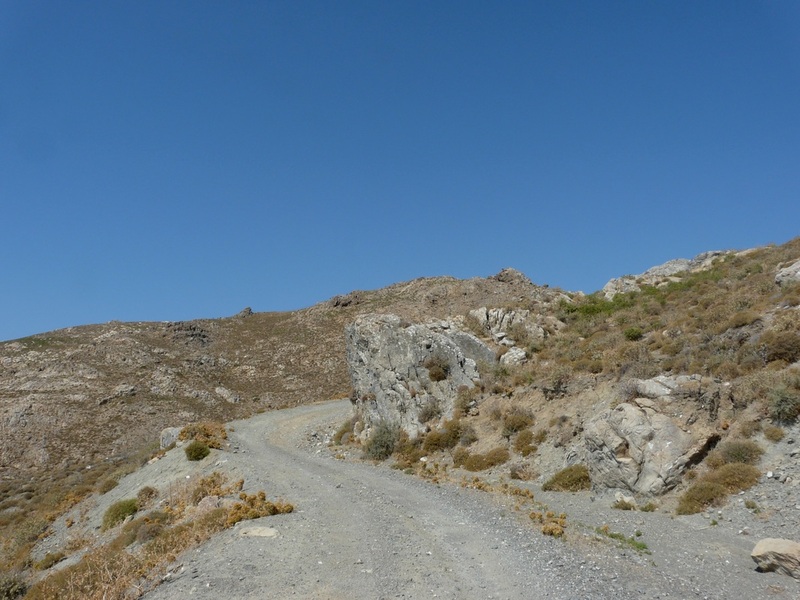 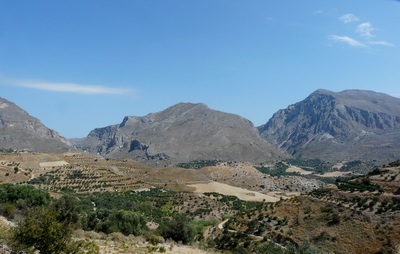 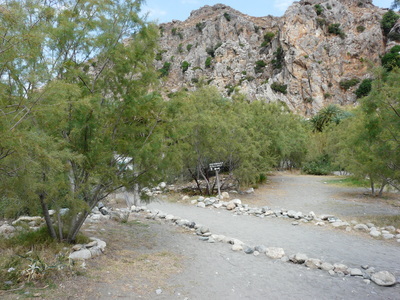 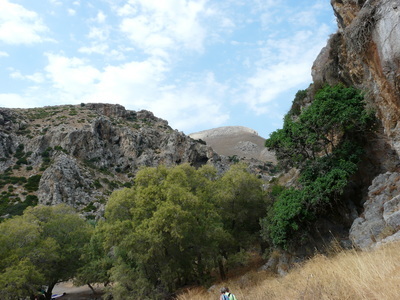 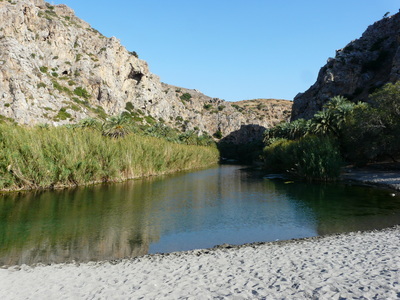 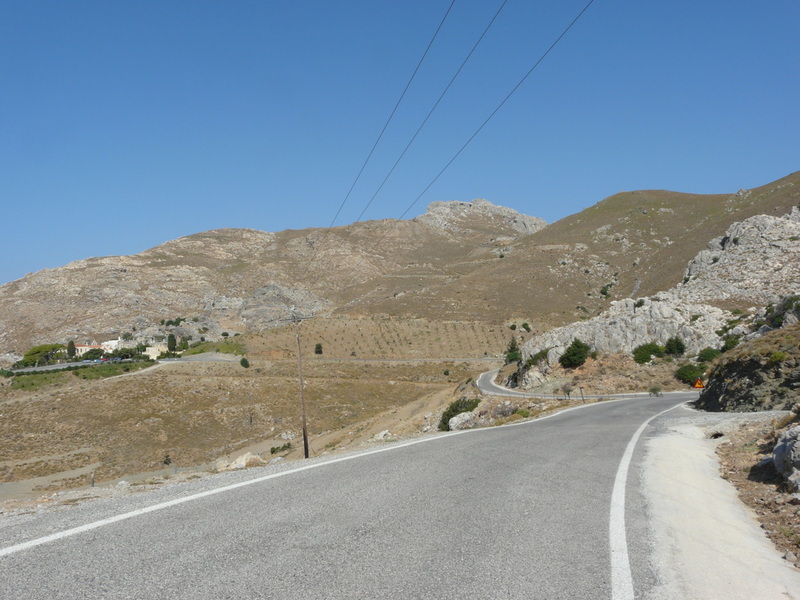 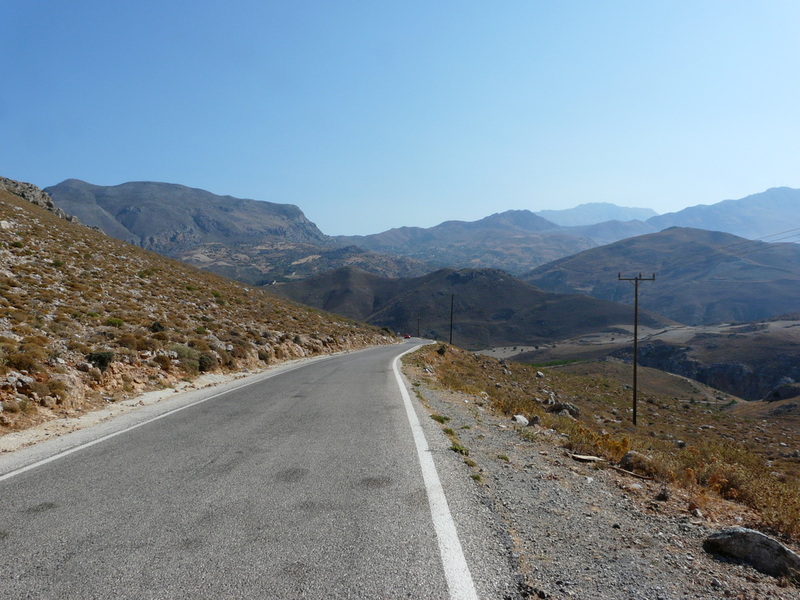 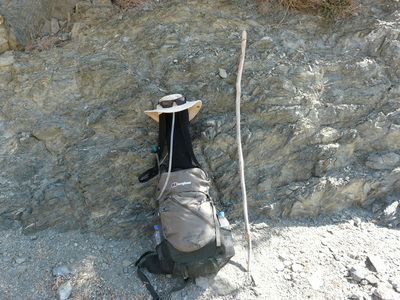 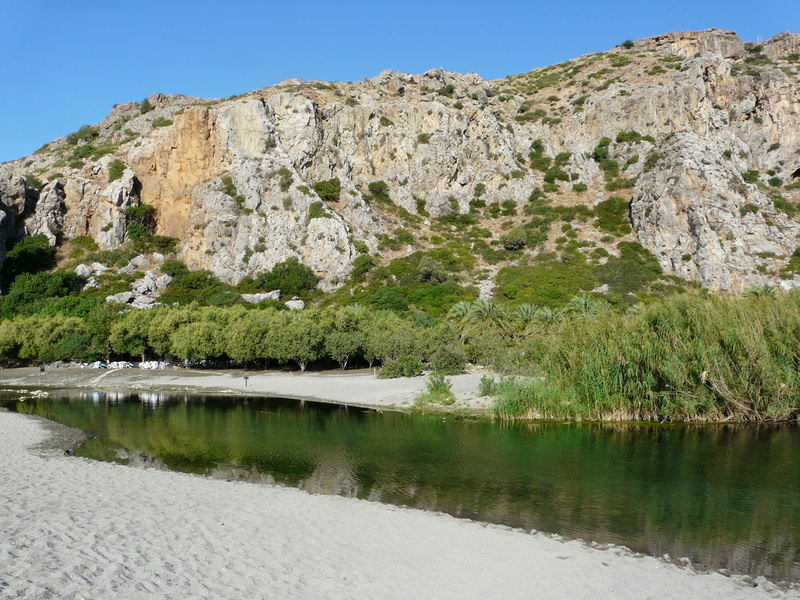 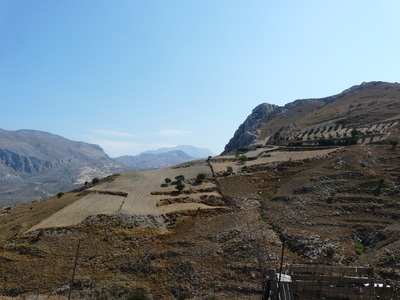 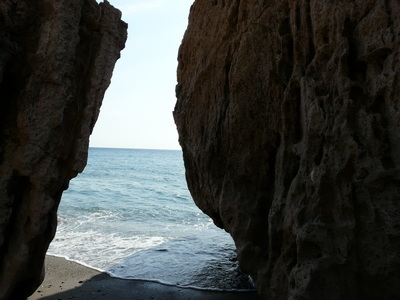 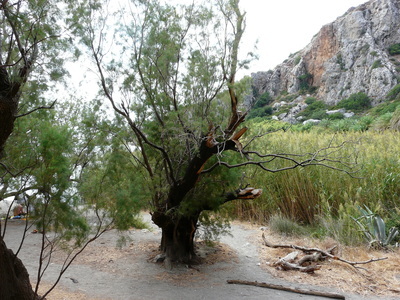 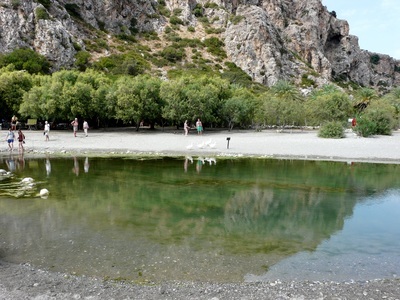 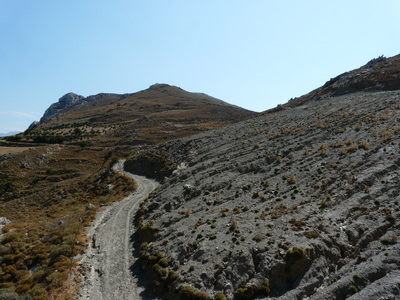 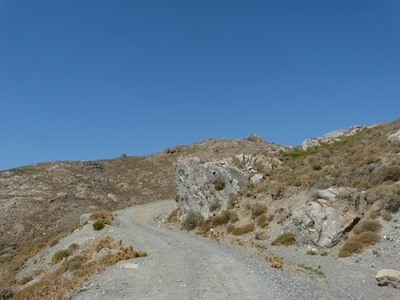 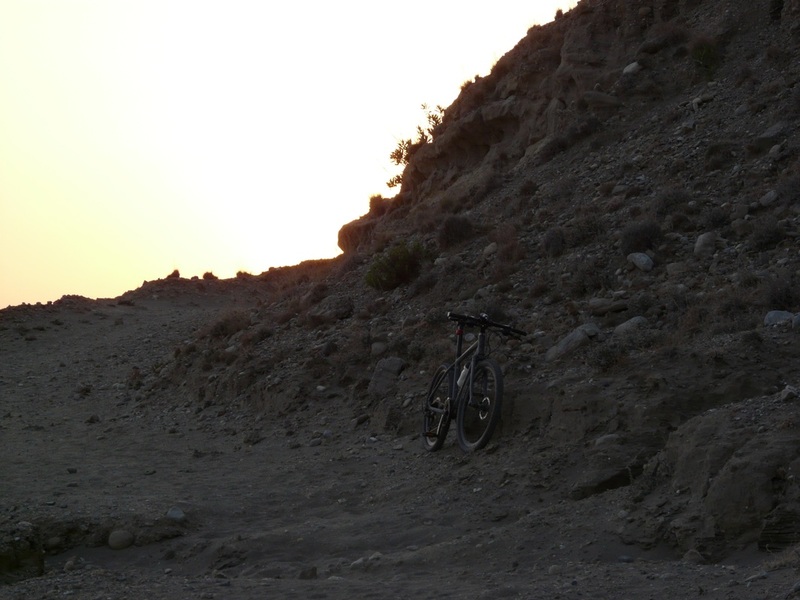 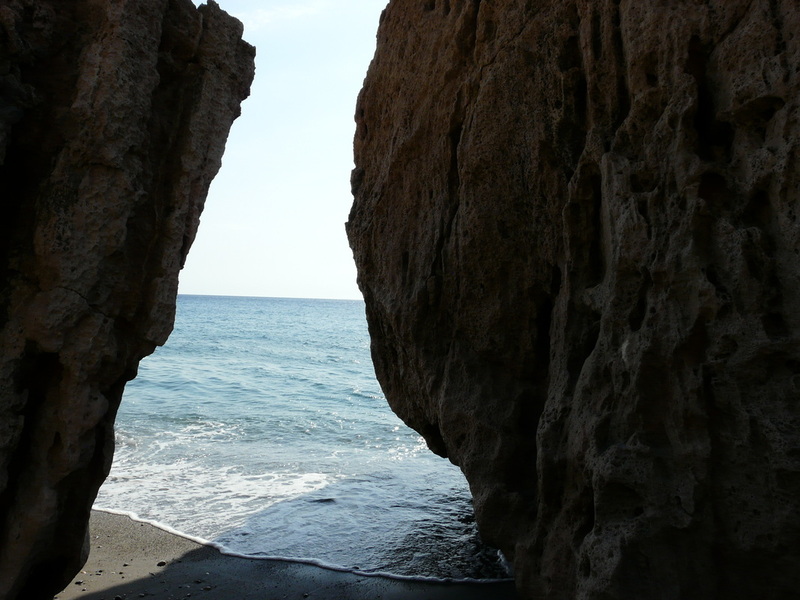 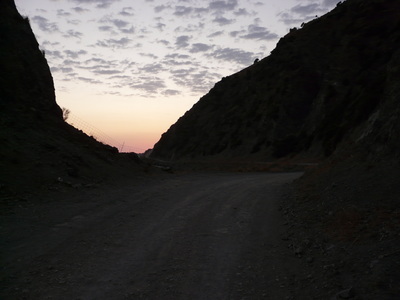 Twice as I got near to Preveli I decided to take non existent shortcuts which redefined them as longcuts. 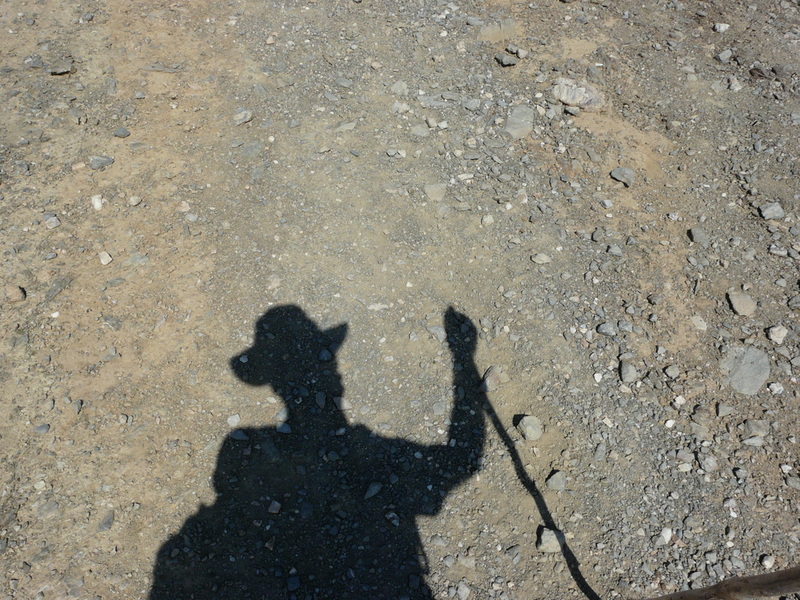 All said and done I would do it again. I will write more about this day at a later date.